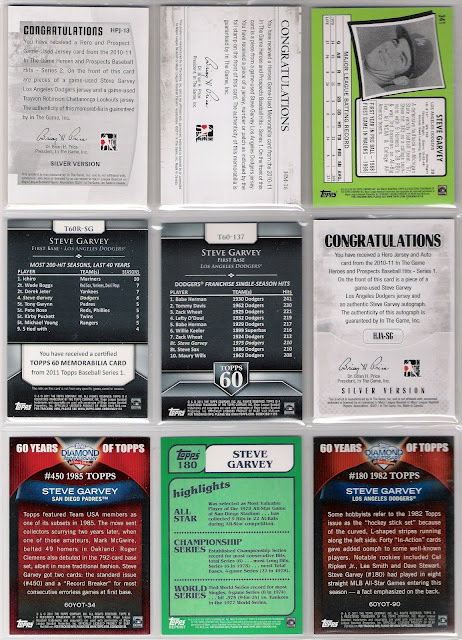 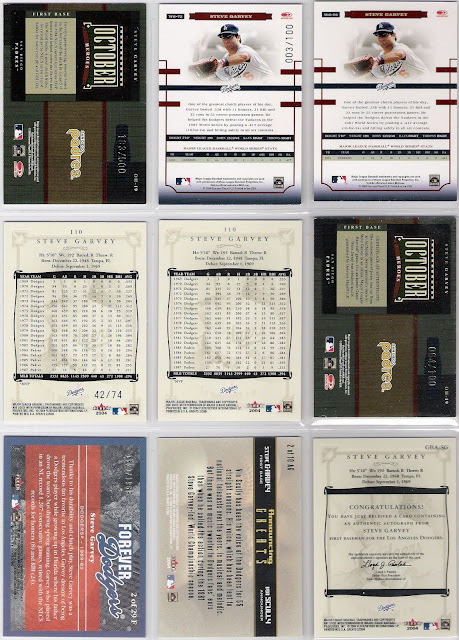 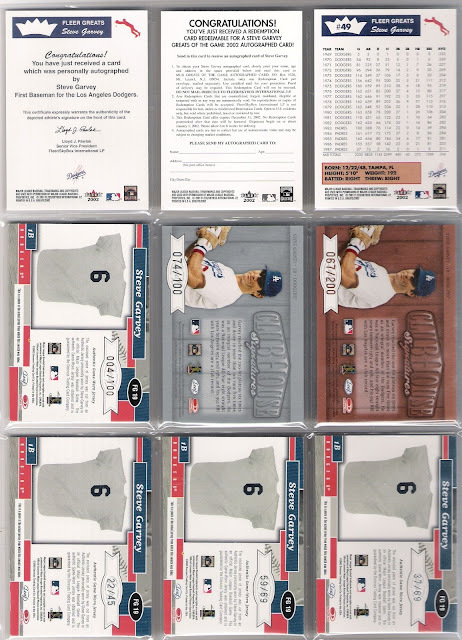 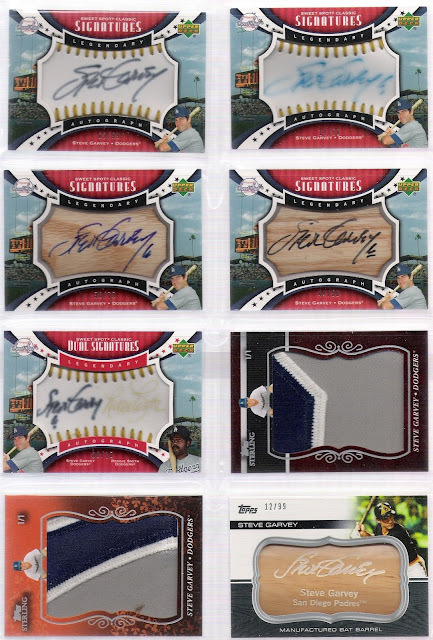 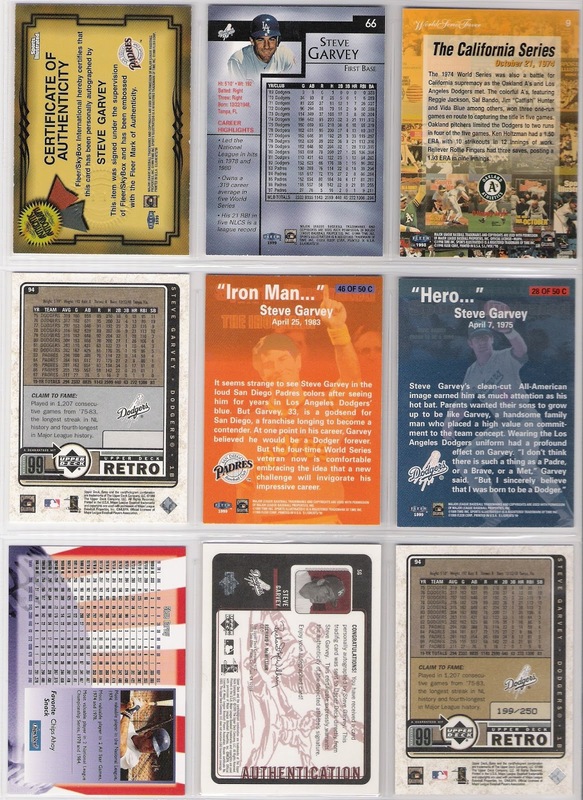 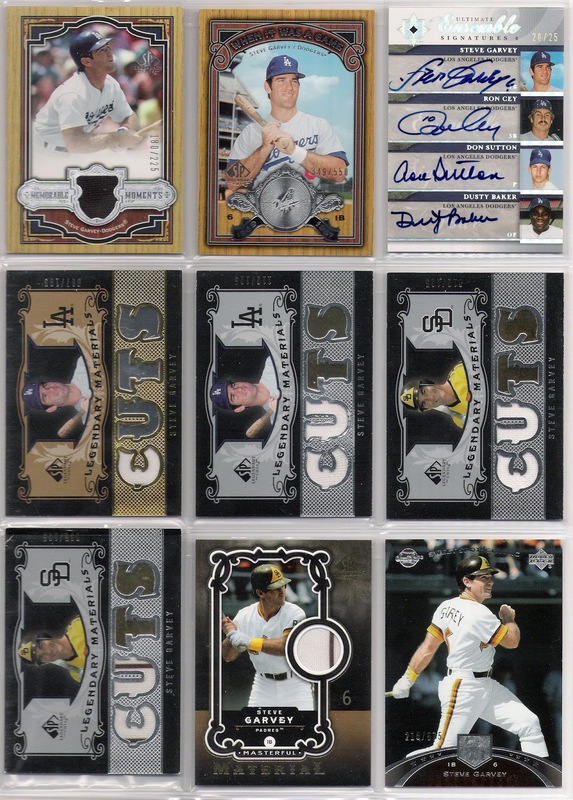 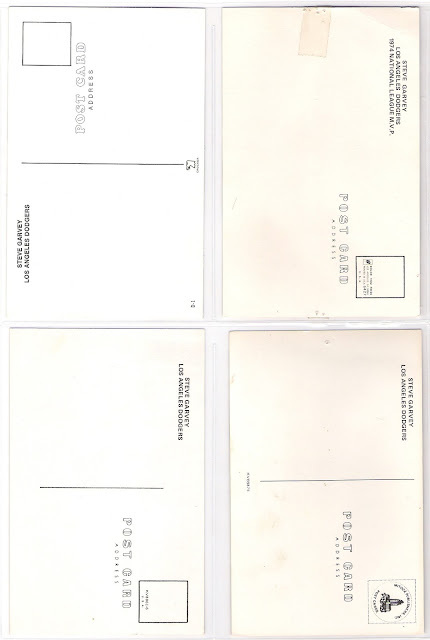 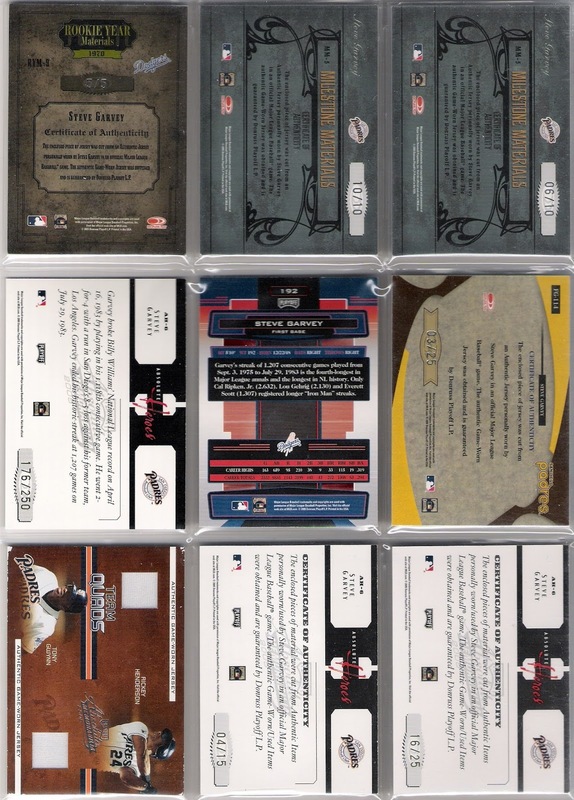 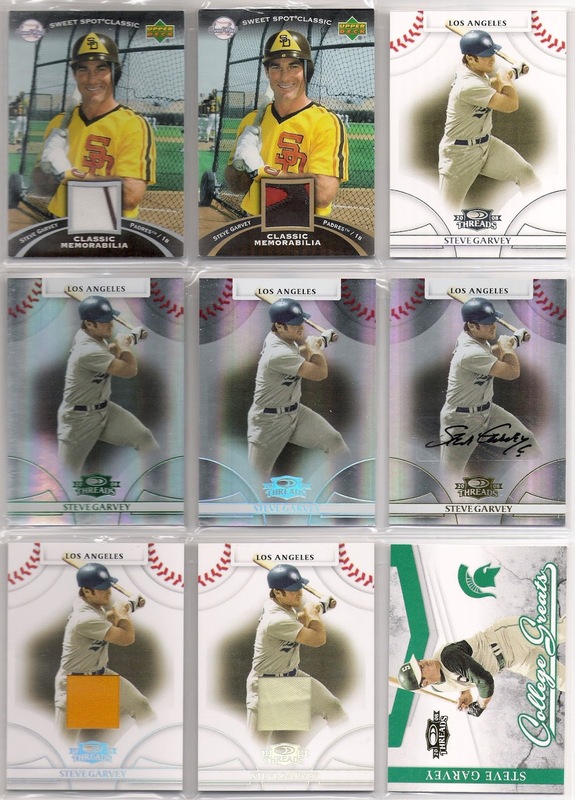 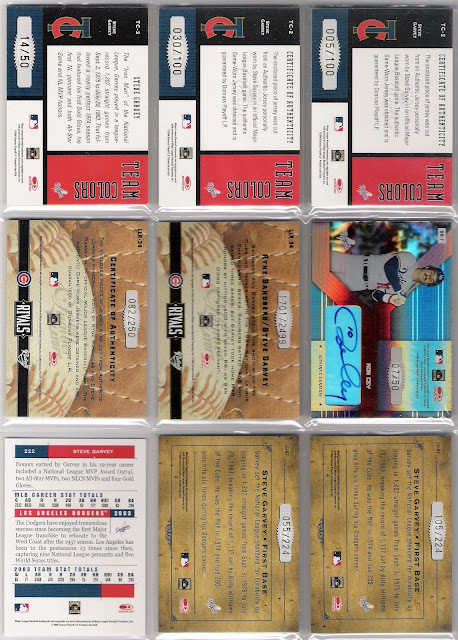 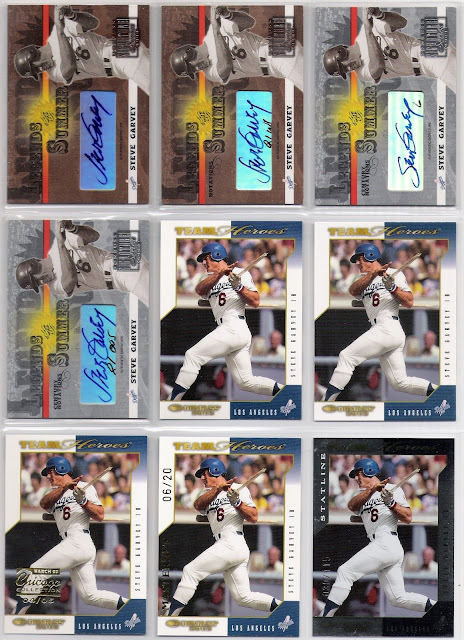 shortly after i started this blog in september of 2008, i received an email from ben henry, creator of the baseball card blog and someone with whom i had traded a couple of times. he said that he had poked around the site a bit, liked what he saw, and thought that it was smart of me to be focusing on a particular team and era. 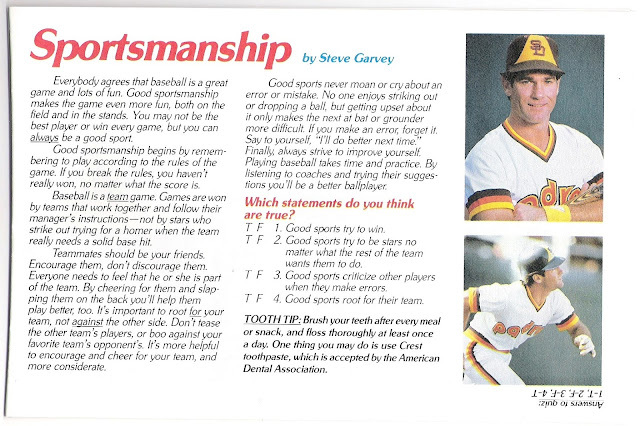 i've thought a lot about that comment over the past 6+ years, and i've come to realize that he was right. 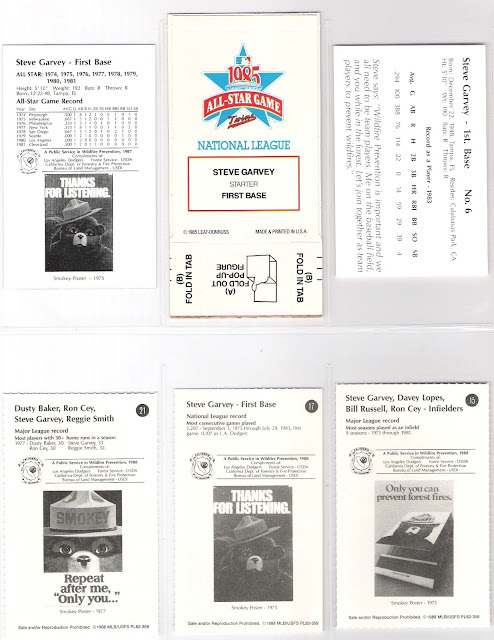 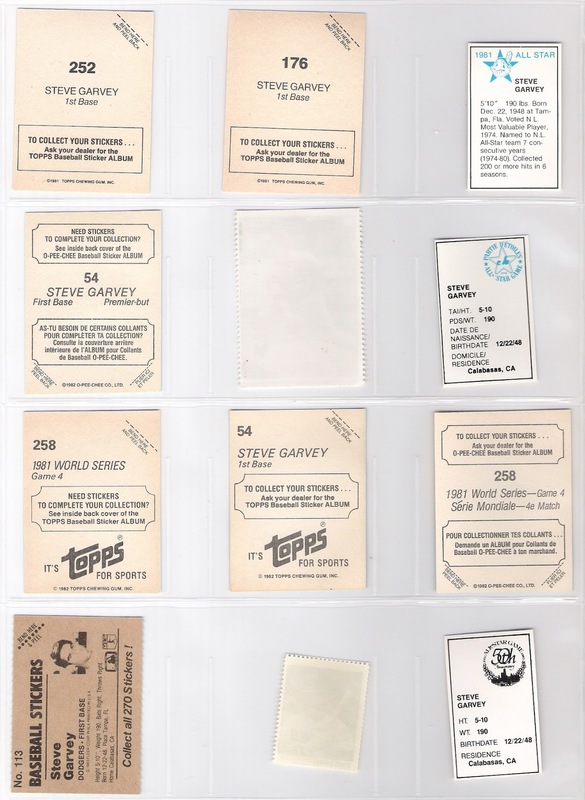 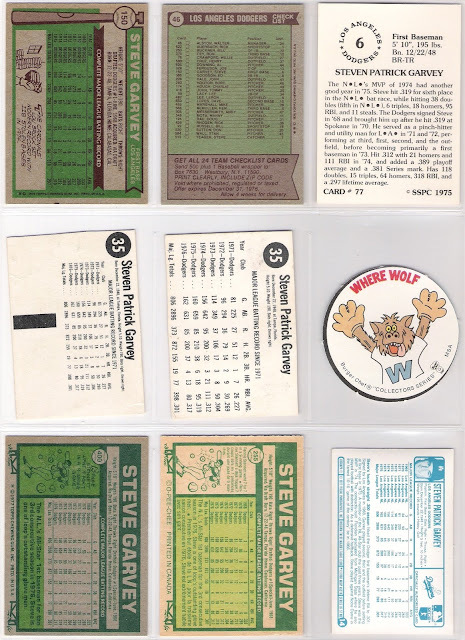 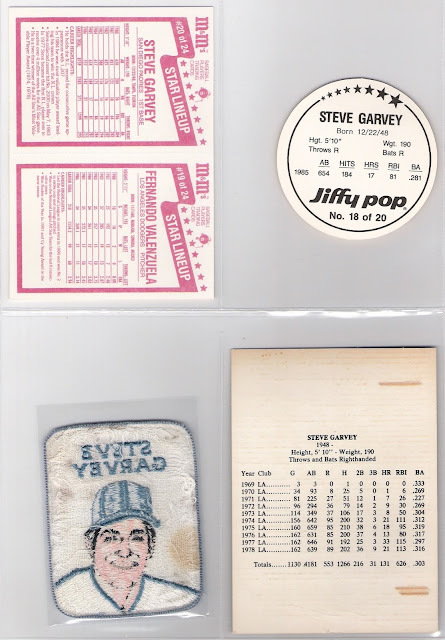 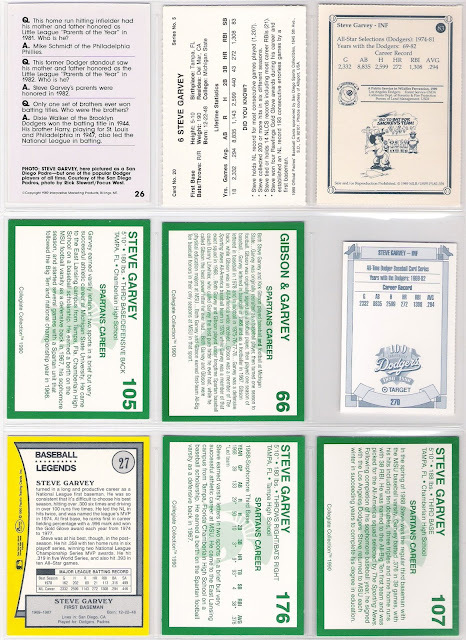 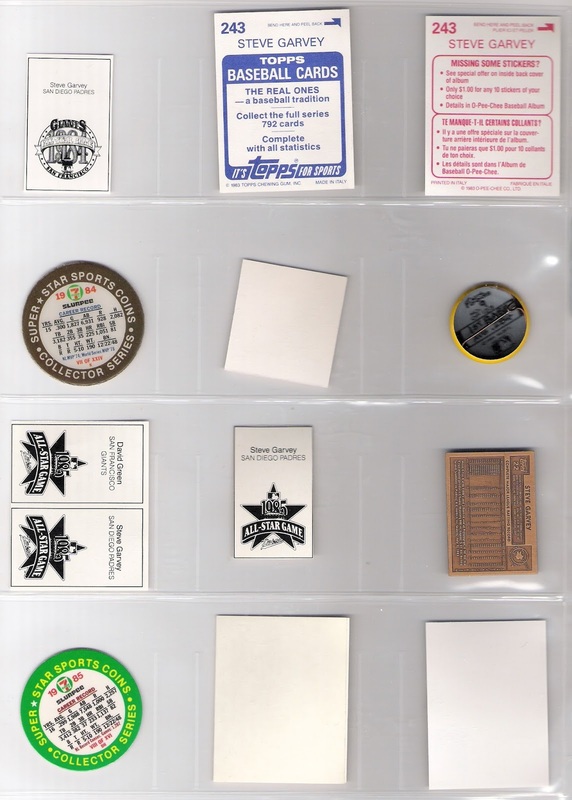 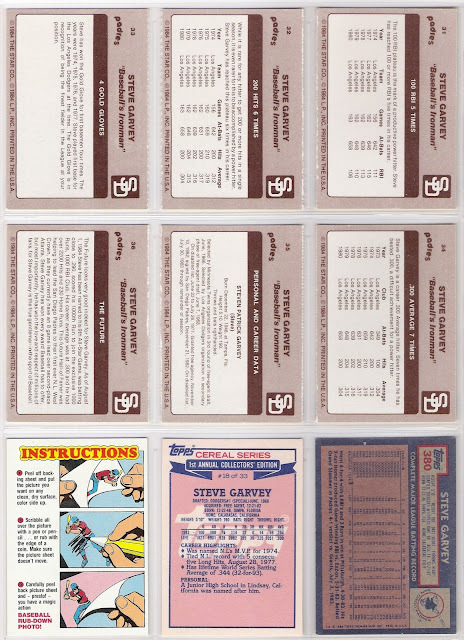 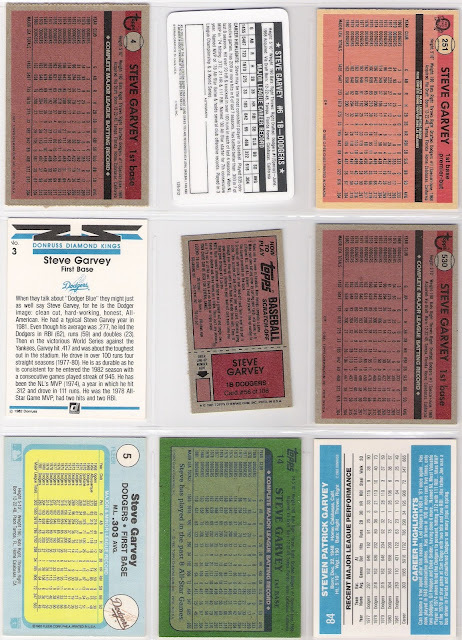 even though i've branched out with tangential topics that make up part of my collection - the memorial patches and armbands, through the mail autograph successes, cards featuring dodger stadium in the background, double plays, final tributes, and tatooine cards to name a few - the focus on the team of my youth, and in particular the infield of steve garvey, davey lopes, bill russell, and ron cey, has always been there. 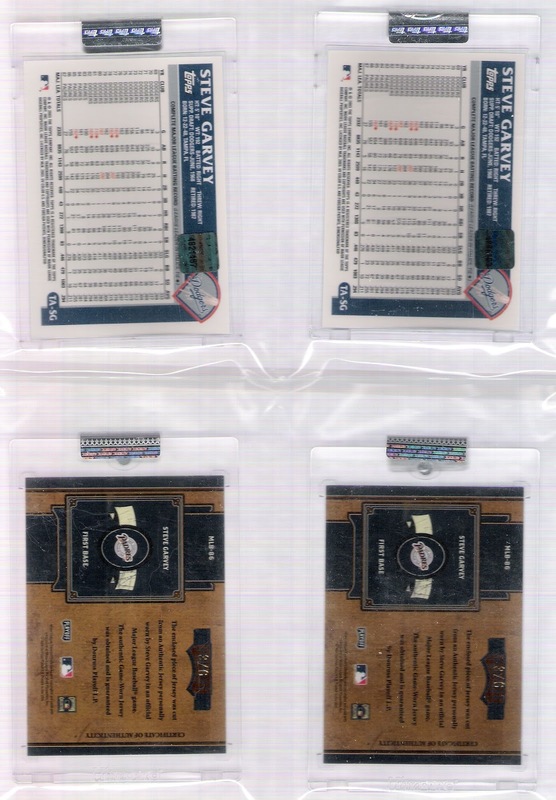 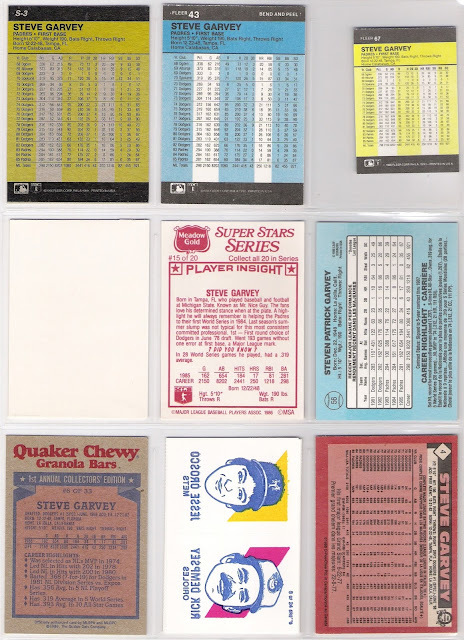 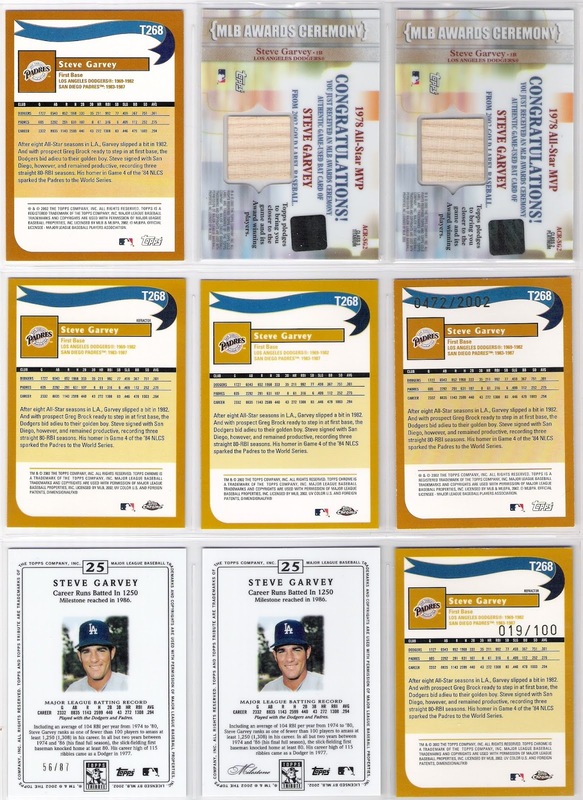 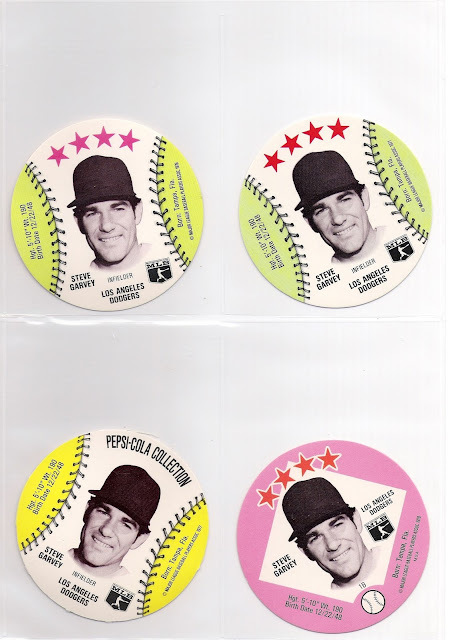 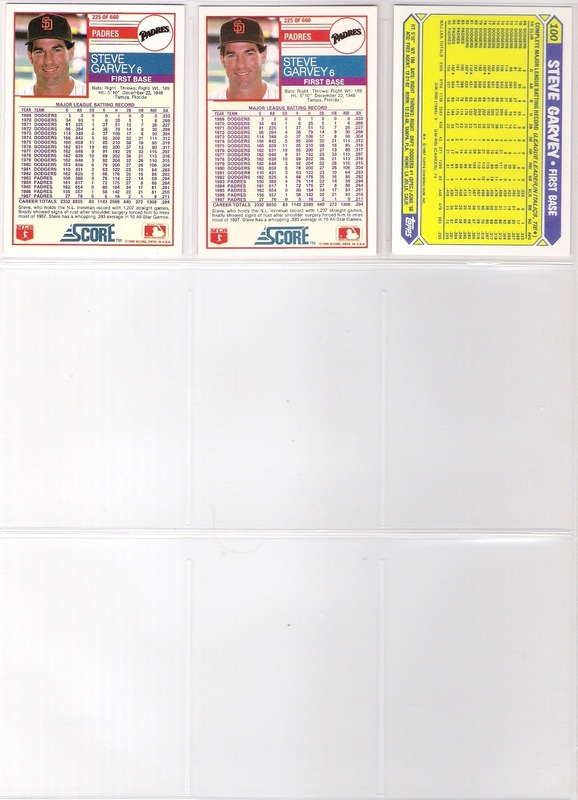 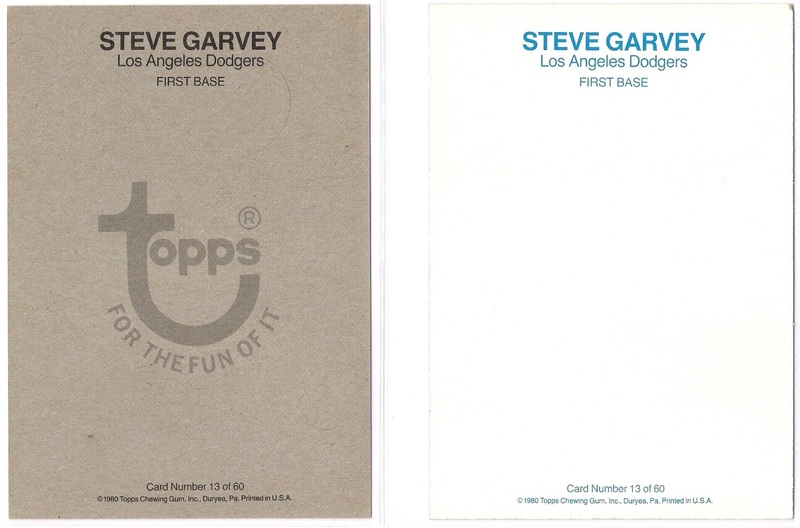 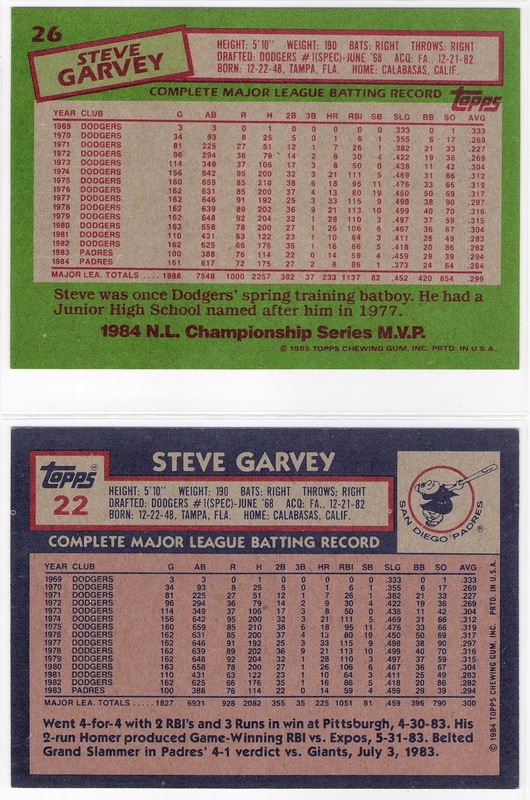 i've completed a few different series of posts related to the infield and the team - most recently the contents of my steve garvey collection, but prior to that the position by position evolution from the brooklyn years to recent dodger teams, the inclusion of members of the 1978 topps dodgers in topps flagship sets for almost 50 years, the career torchbearers for the primary starters from that team, and the year-by-year evolution of the infield itself during their playing days. 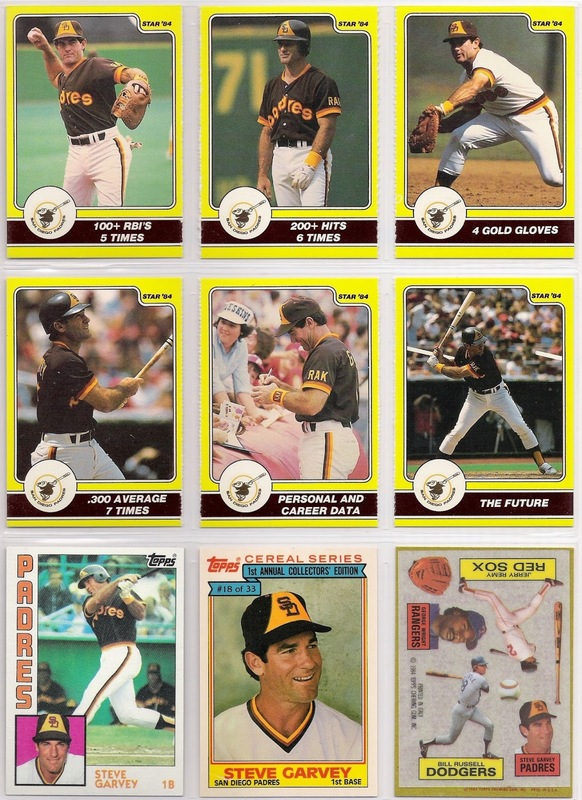 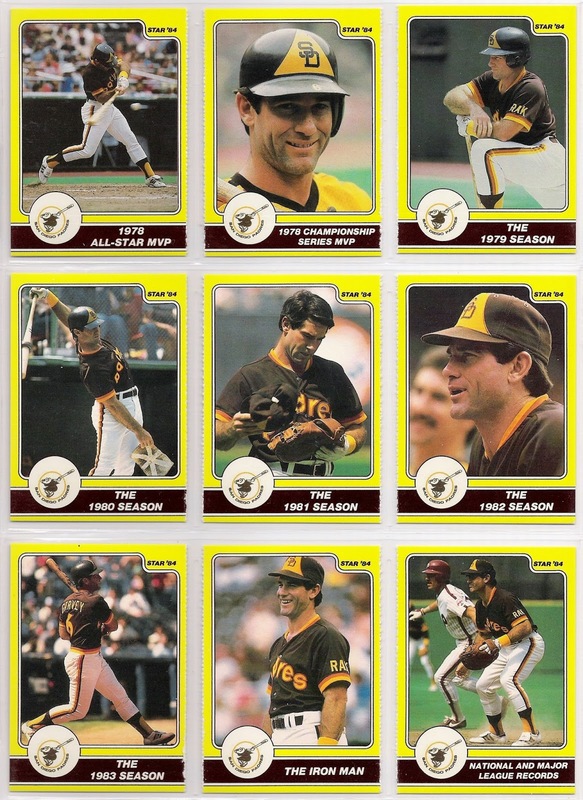 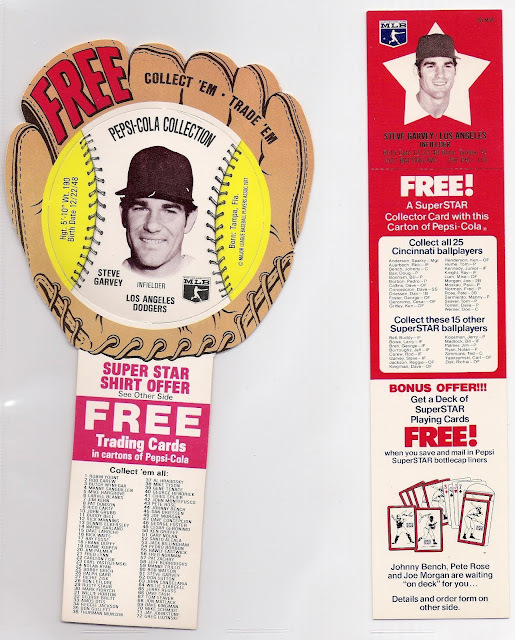 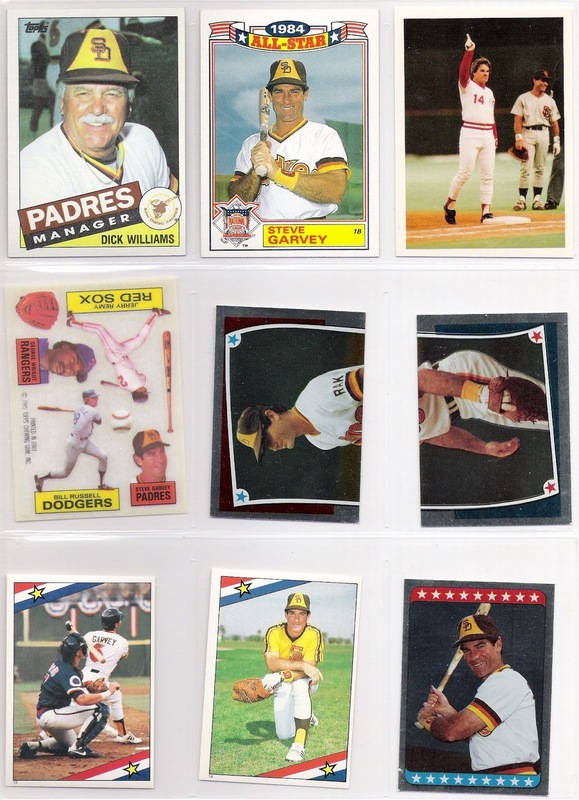 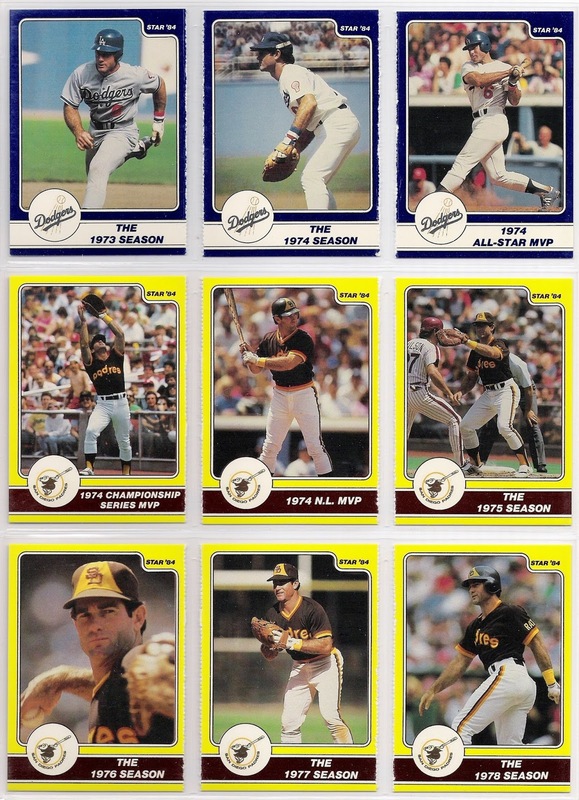 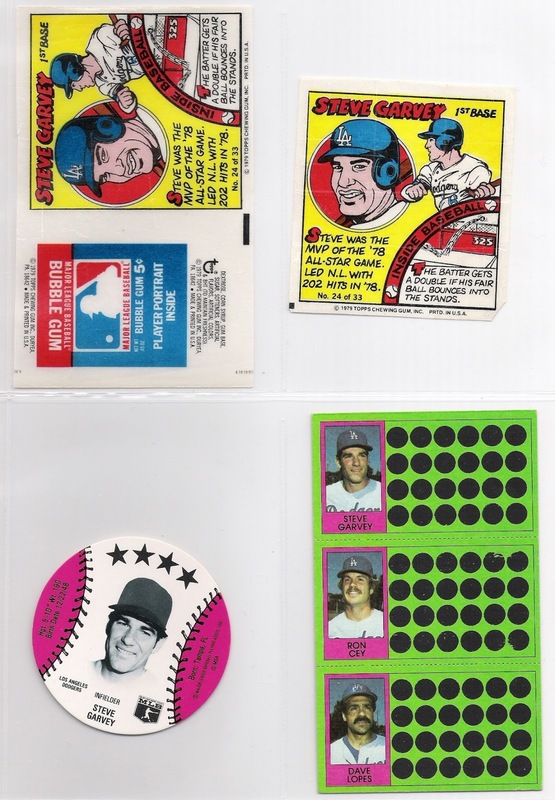 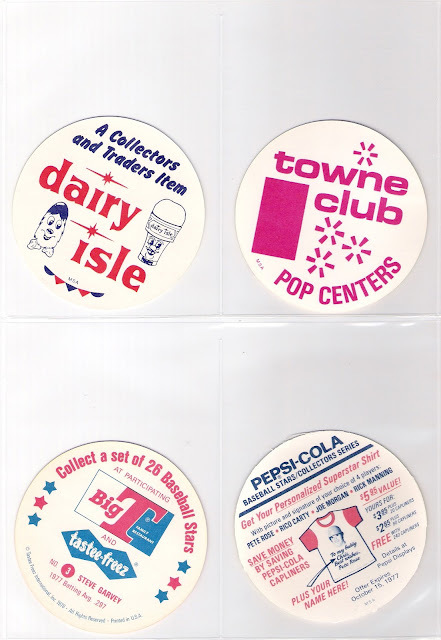 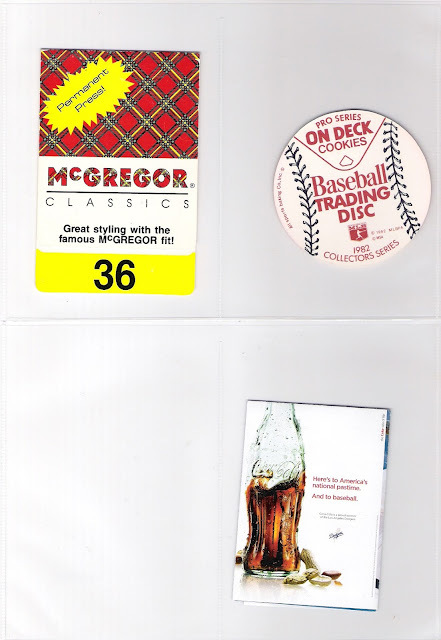 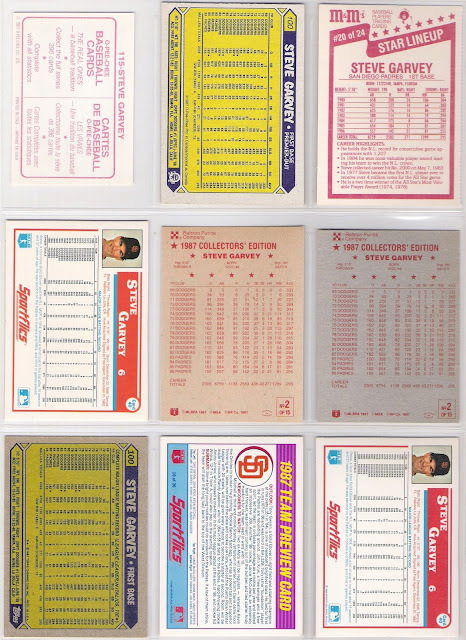 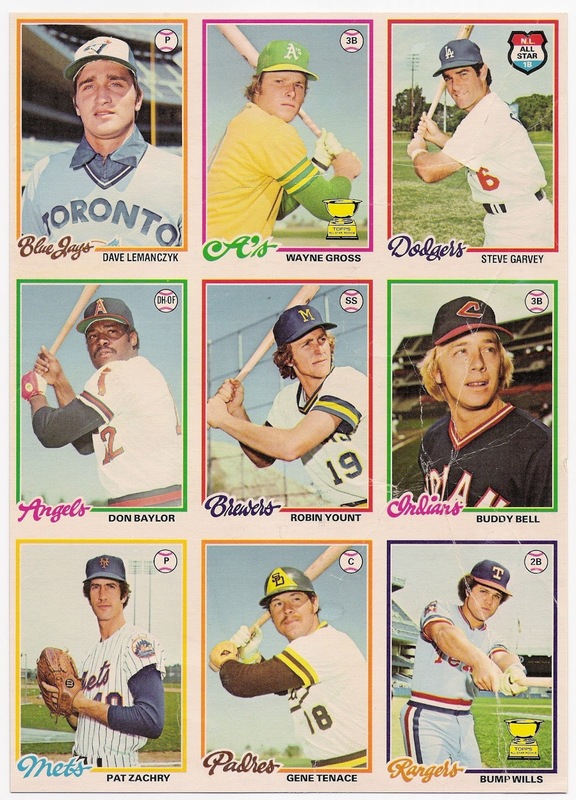 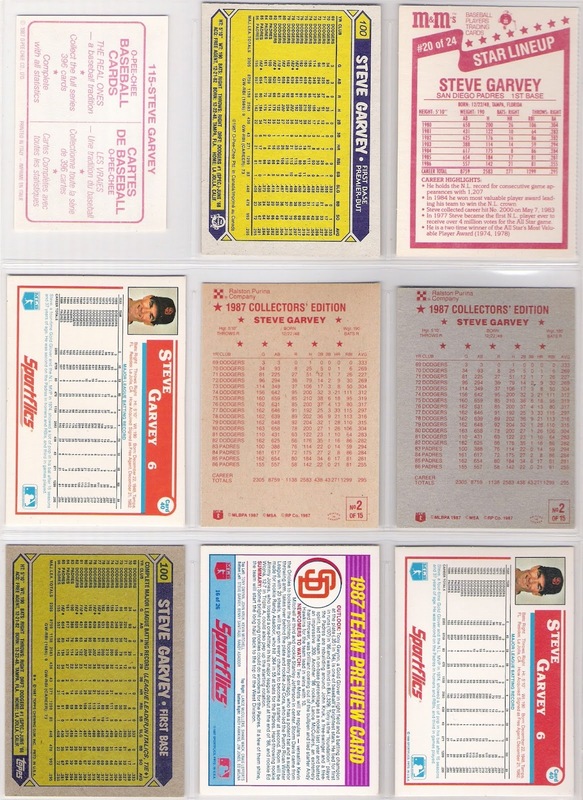 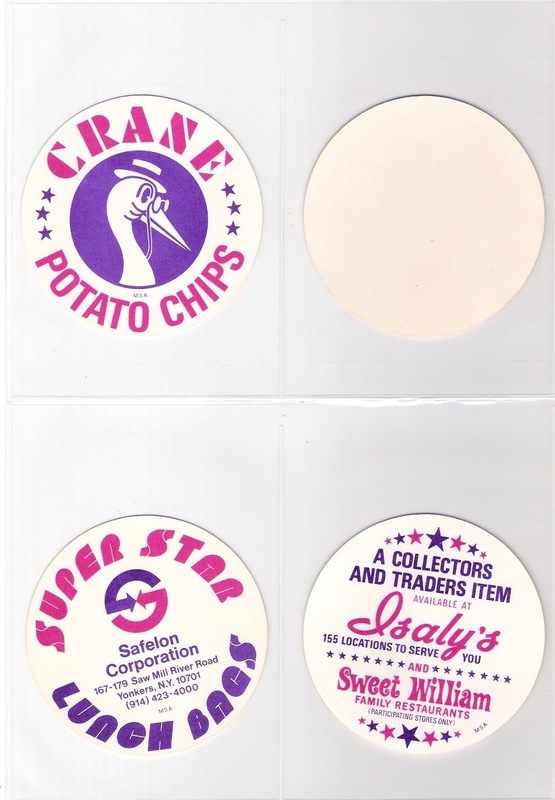 in doing so, i've enjoyed reliving the memories i have of those teams and of collecting cards during the late 1970's and early 1980's. i've also enjoyed trading with other bloggers and reading their posts about what makes their collections unique. 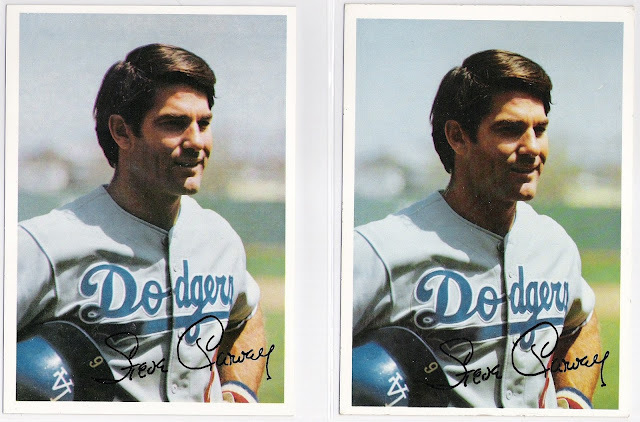 i know that i have not been the most interactive blogger - i don't leave too many comments, i don't share much personal information, and i fail at responding to comments most of the time. 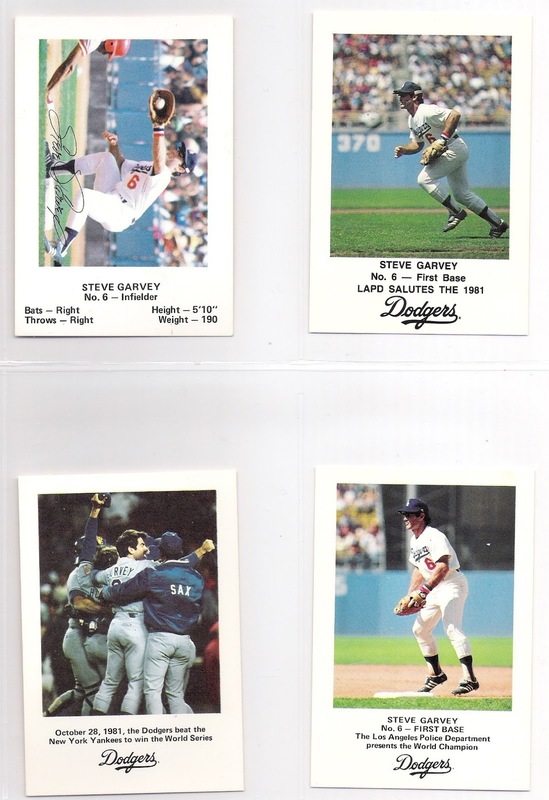 i do, however, put together a decent trade package. 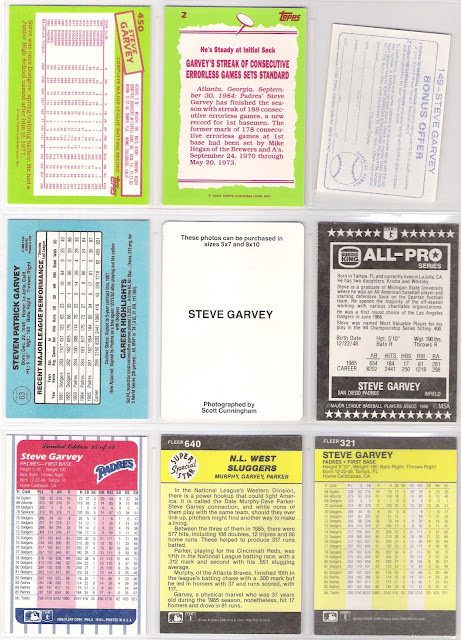 it was never my goal to be the most heralded blogger or have the most popular blog, not that those are anyone else's goals, or bad goals to have, either. 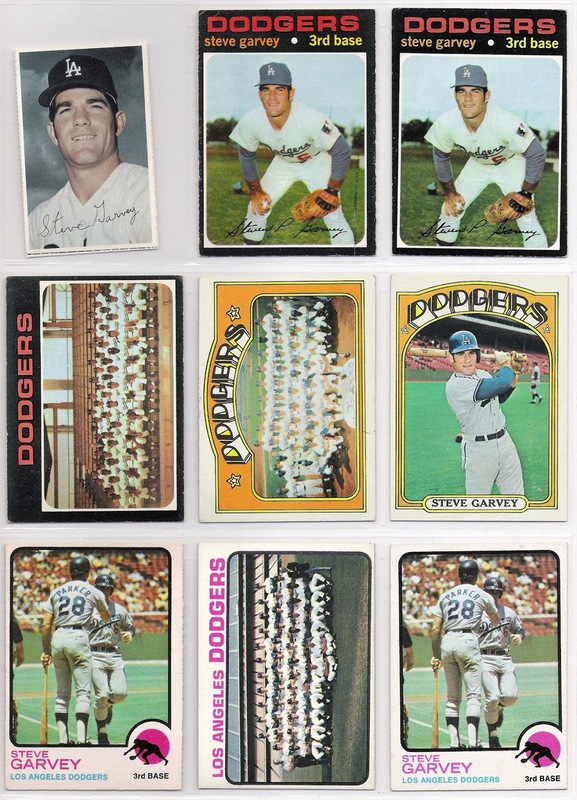 that's just not the reason for the 2,800 posts i've written. 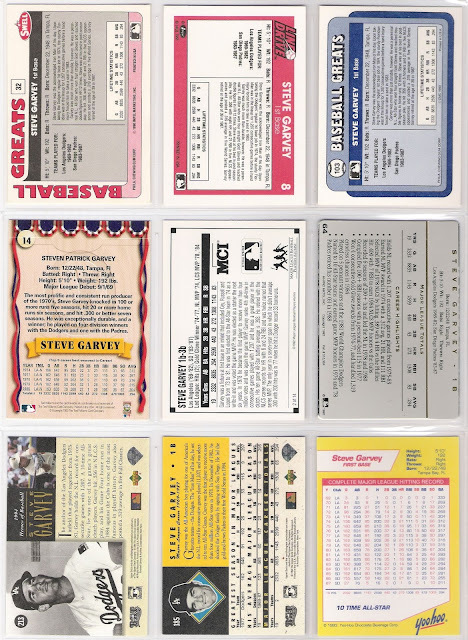 i didn't track readership or number of comments, and i didn't fret about posting every day - i just wrote and posted about cards as i saw fit. 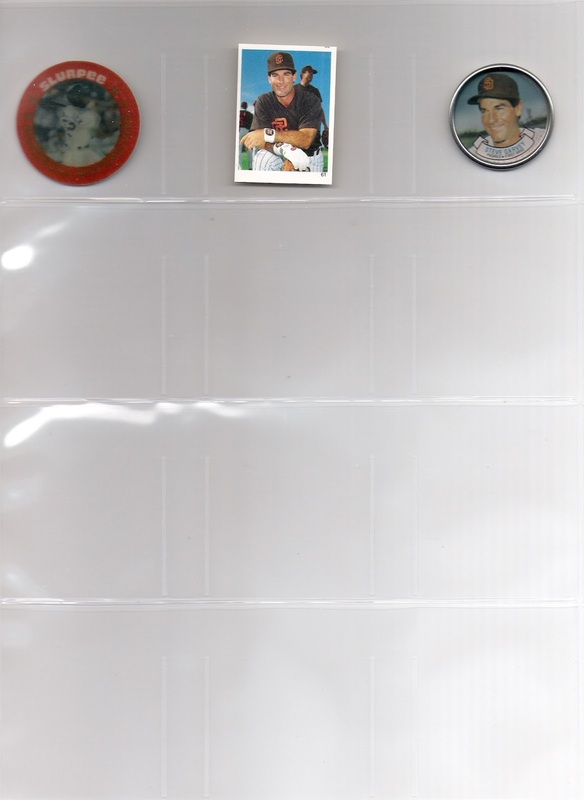 i did it for myself, and in doing so, i gained a new appreciation of my collection - one that didn't exist when they were just cards in boxes and binders. 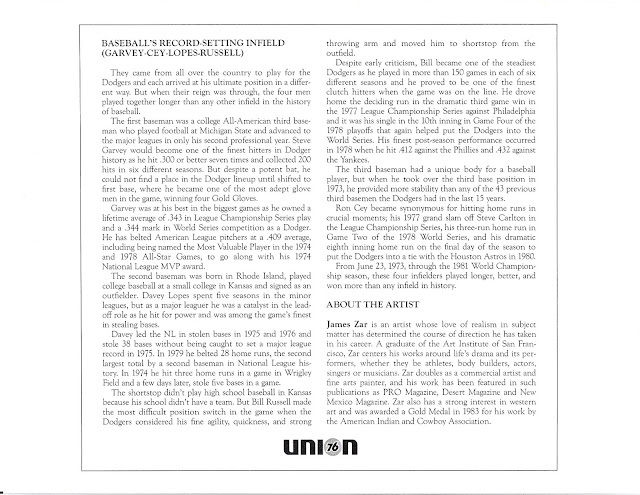 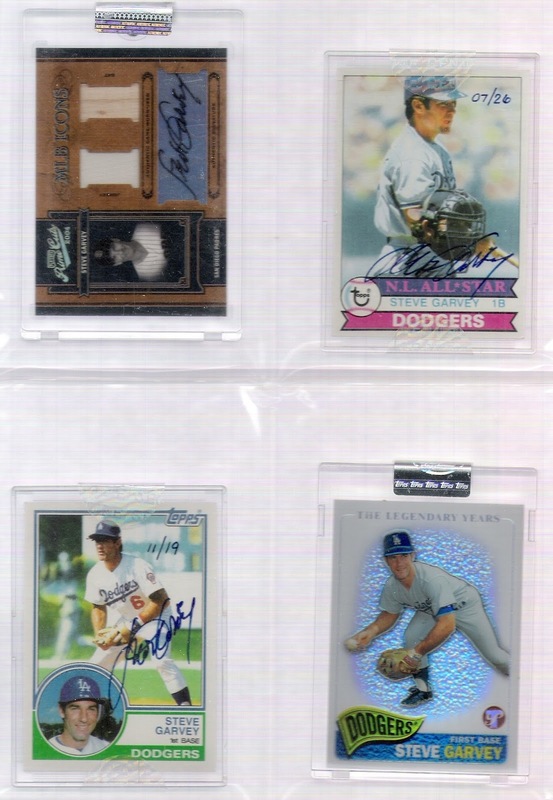 as a result of creating this blog and its subsequent impact on my collection and collecting habits, i've received and traded emails with jerry reuss, the hall of fame, dodger historian mark langill, and others (including a nastygram from a dodger player from the '90's), plus a comment from kevin pasley, and return mail from a host of former dodgers (including all four of the infielders for whom this blog is named) and other players who signed cards for me or wrote a note in response to a request. 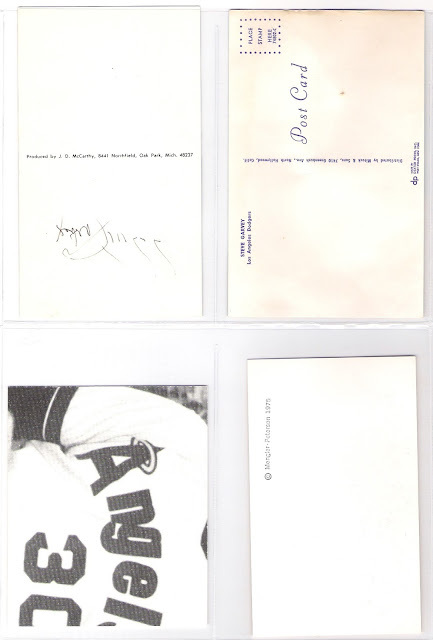 even the great vin scully signed and returned a card for me, in what resulted in the greatest mail day ever. all of that is appreciated greatly, as are the comments from you folks who have read what i've written, and those of you who have traded with me to help make my collection what it is today. 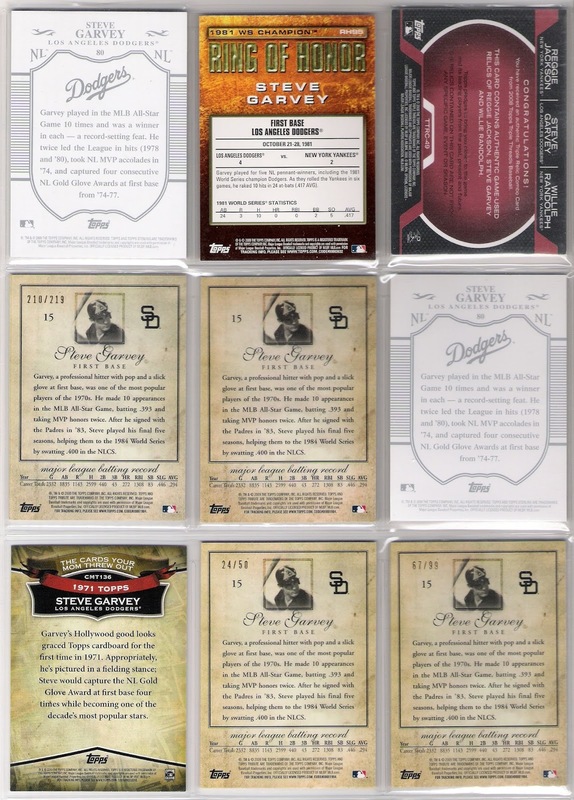 the interaction with fellow bloggers (including the two that i've met in person - carl crawford cards and highly subjective and completely arbitrary) has been a true joy. 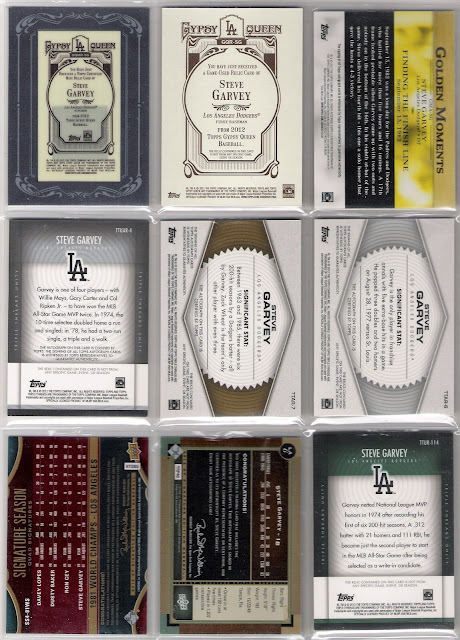 all of it has made for a great experience over the past 6-plus years. during that time i have posted a lot of great cards (and some not so great) from my collection - old and new - and i've enjoyed posting about them, whether they were dodgers or even giants. 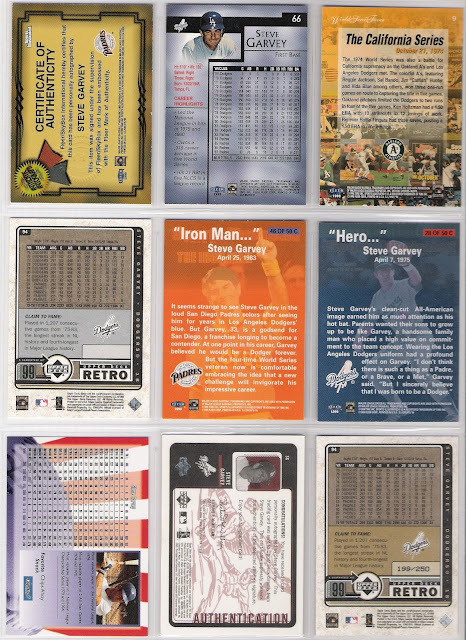 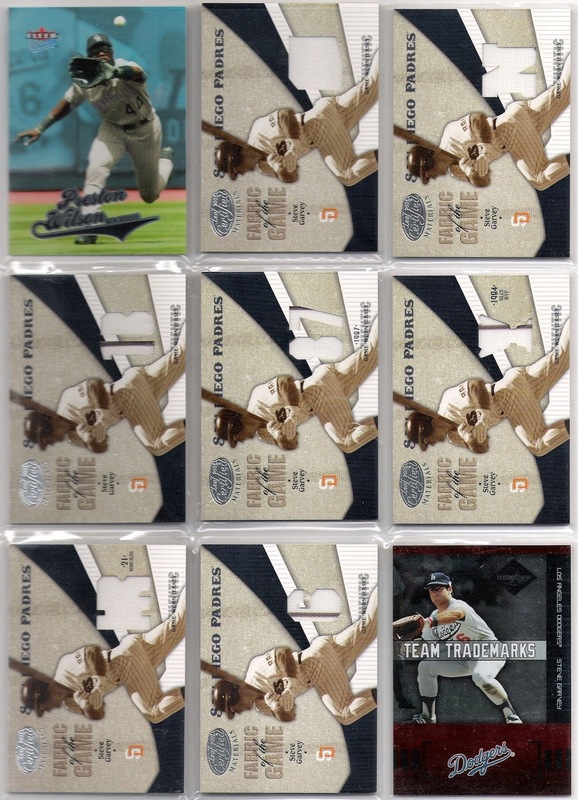 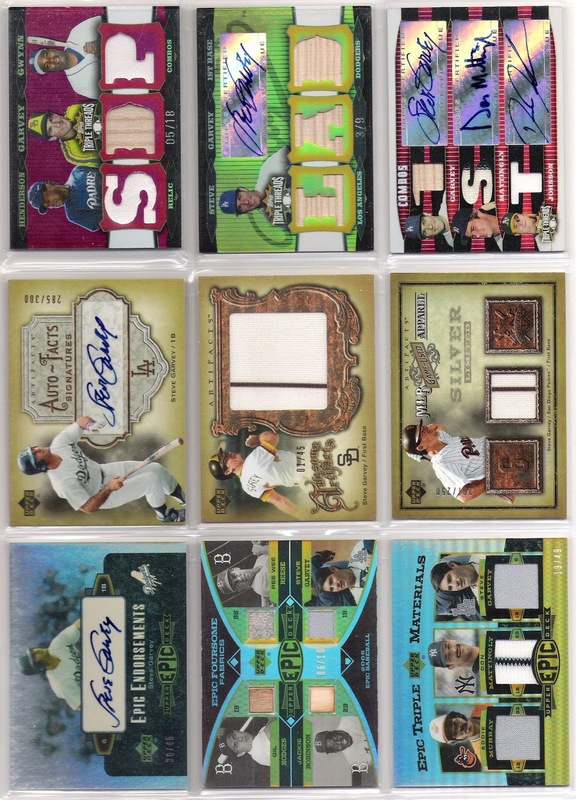 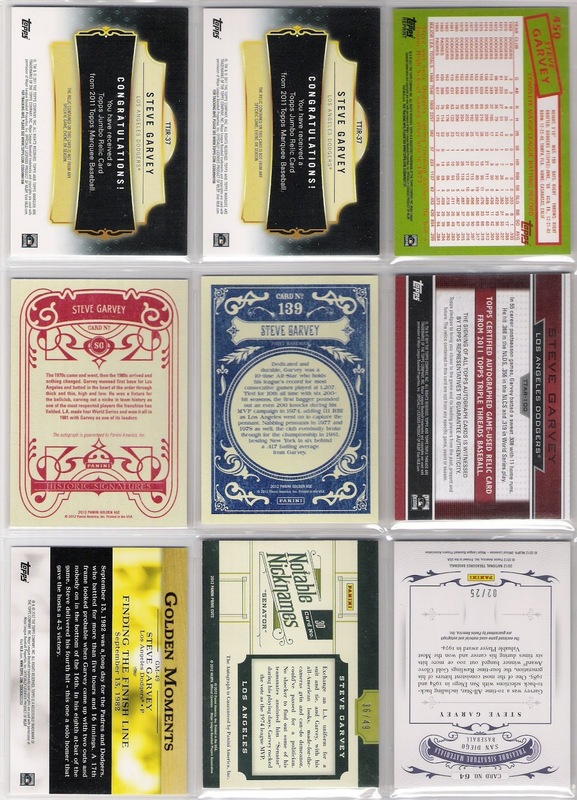 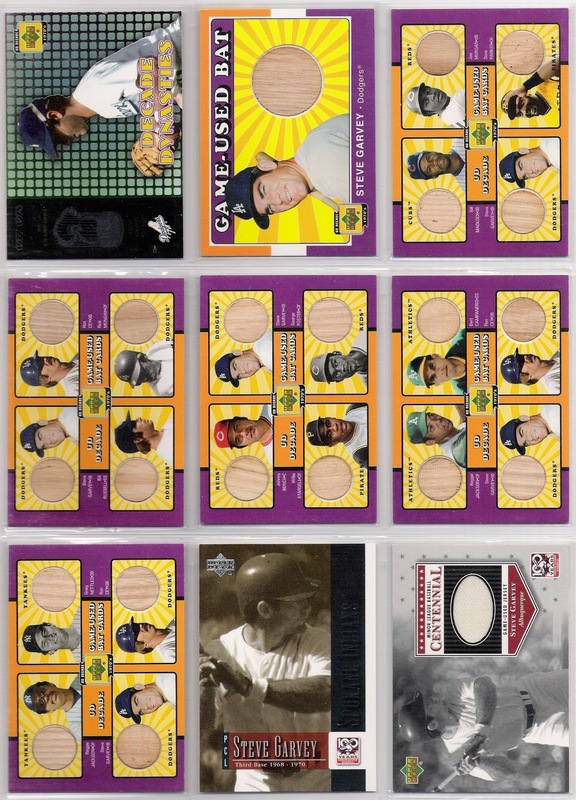 however, there are a lot of great cards in my collection that i haven't shown on this blog, and i know that in the future there will be more great cards that enter my collection that won't be shown here. 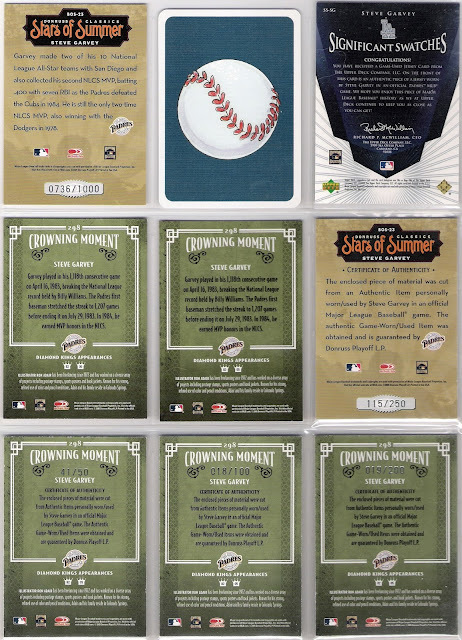 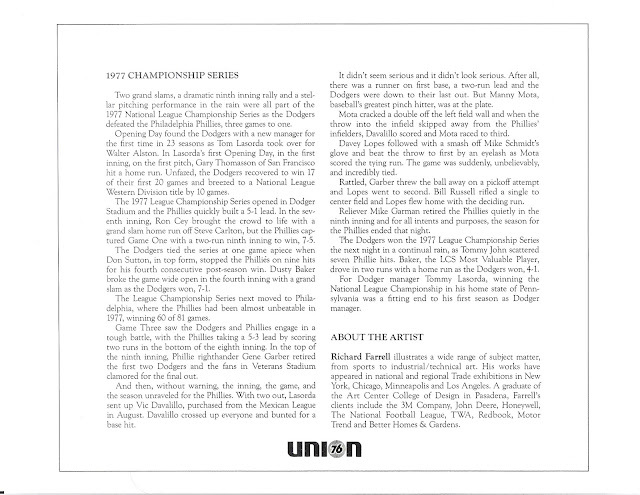 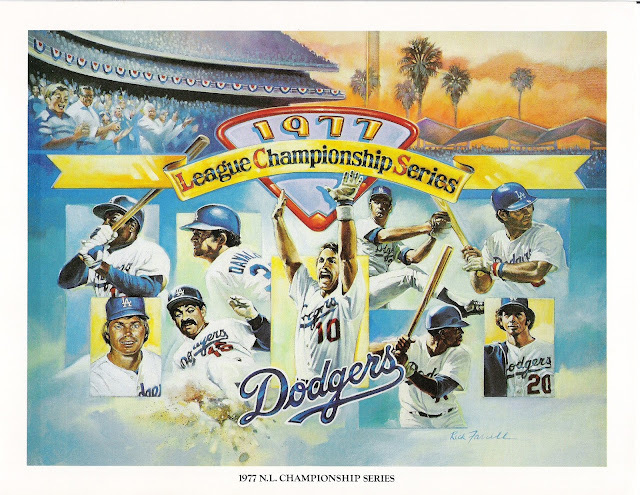 i know that there will be more double play cards, and there will be more cards featuring memorial patches and armbands, and there will be more cards that feature the stunning beauty of dodger stadium in the background. 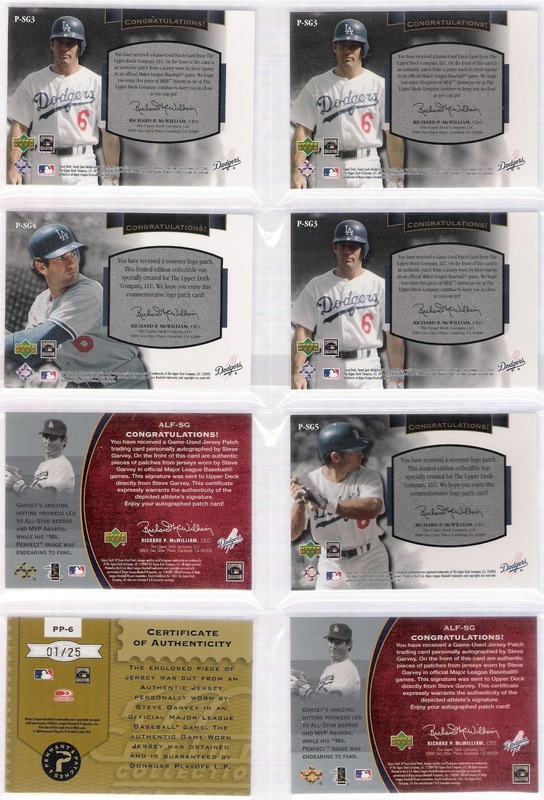 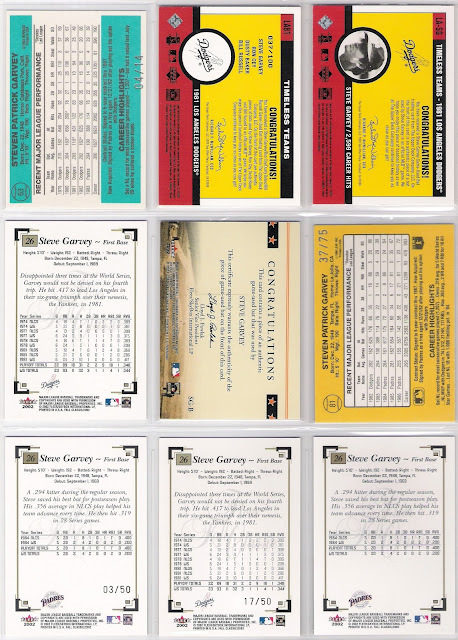 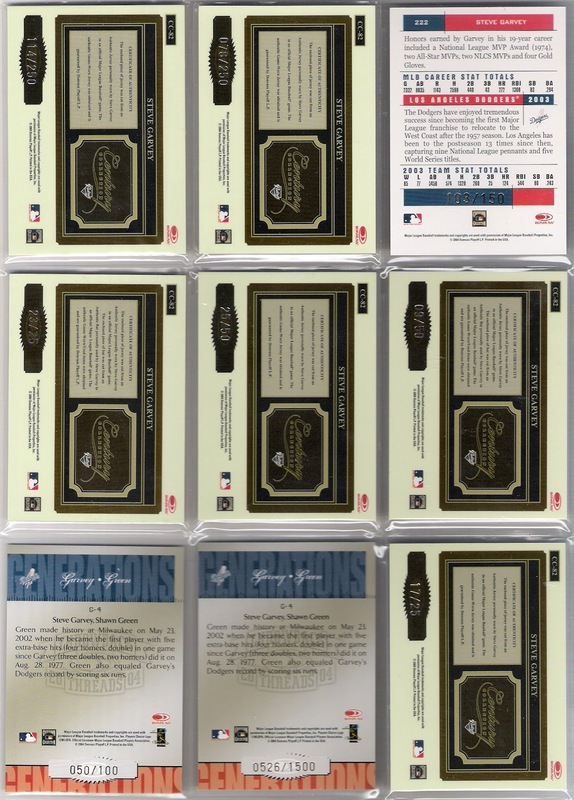 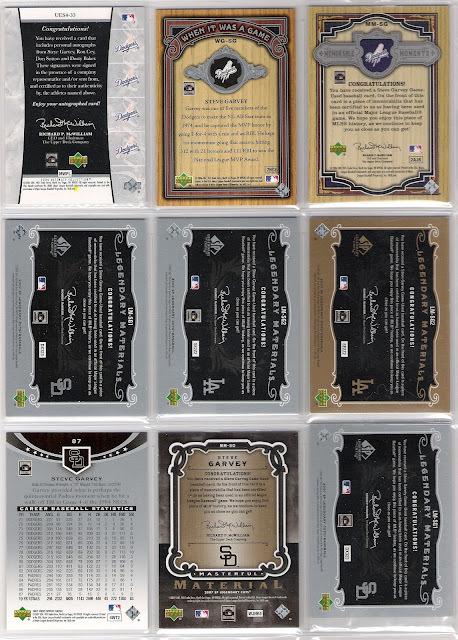 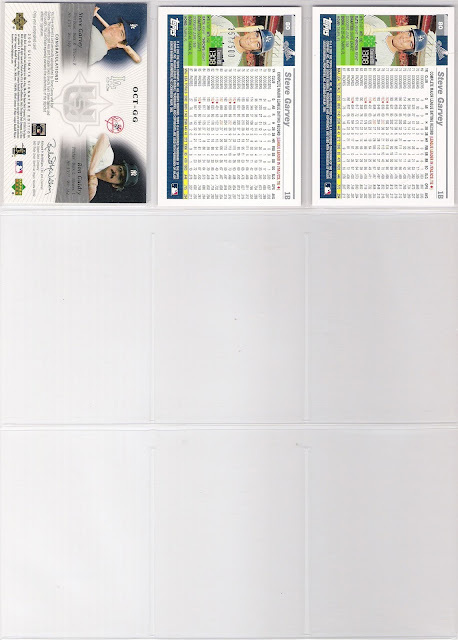 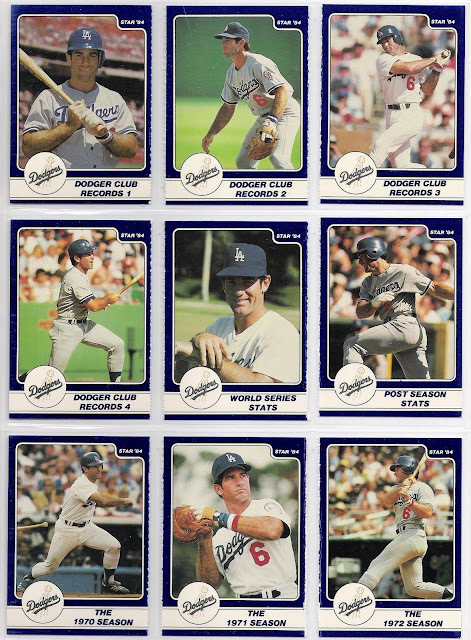 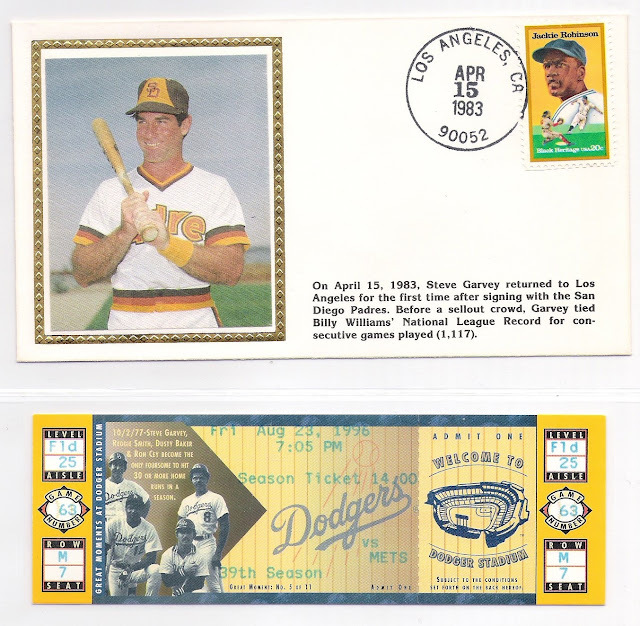 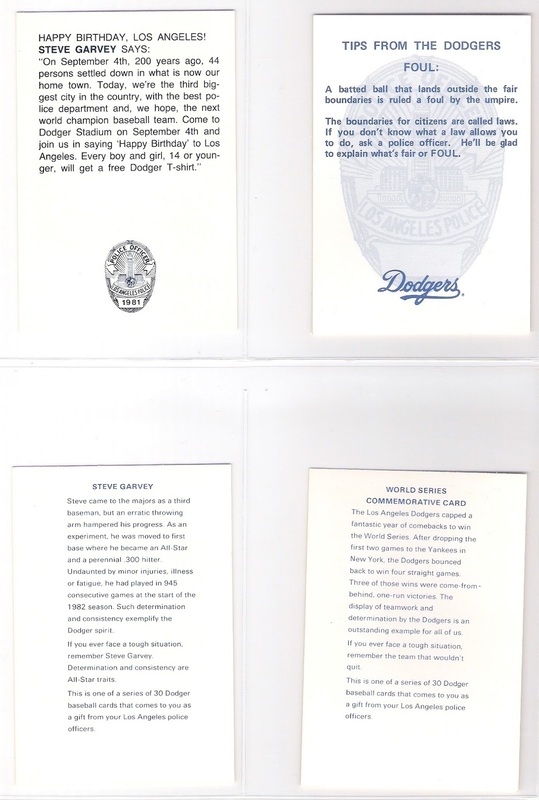 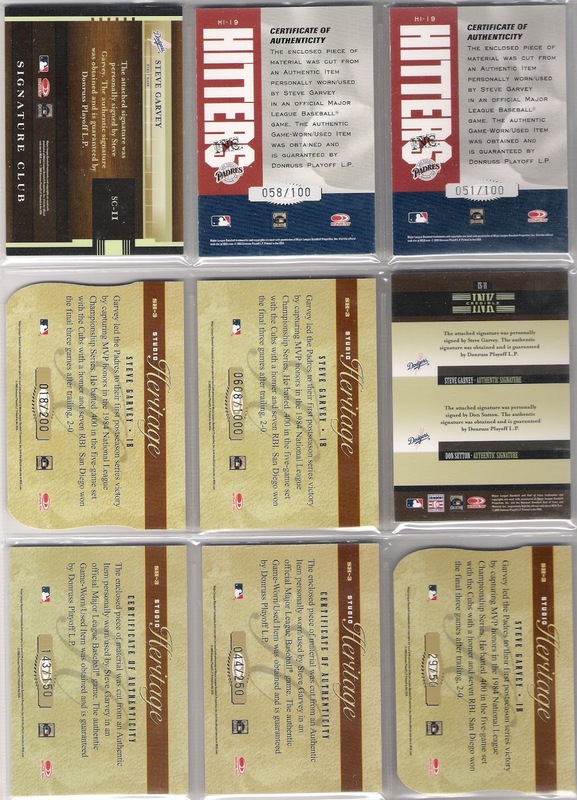 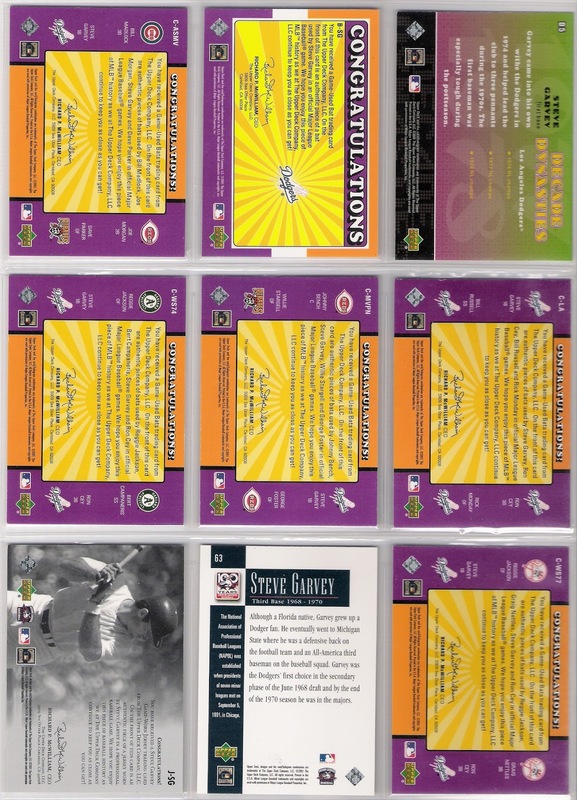 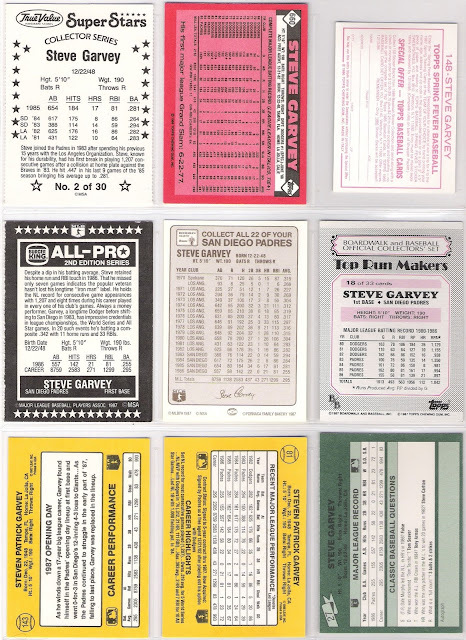 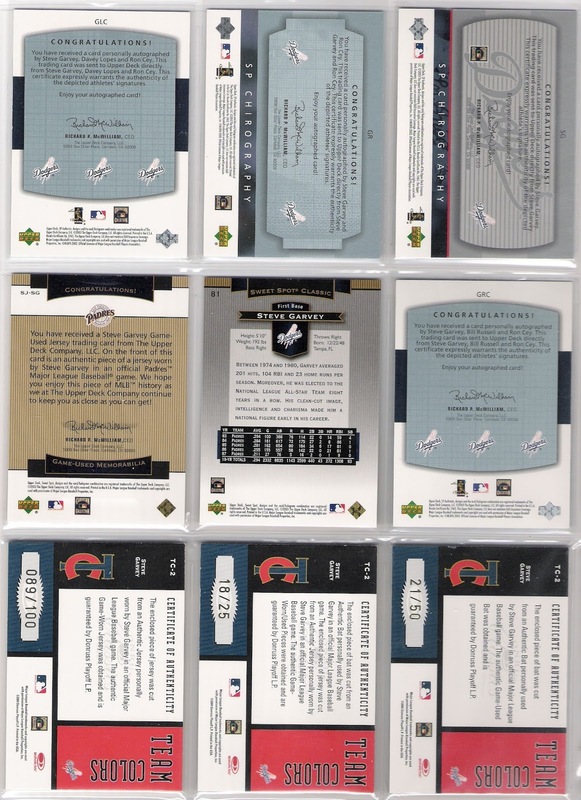 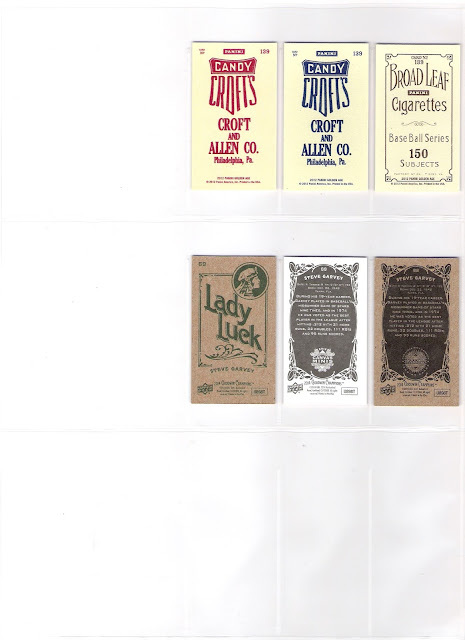 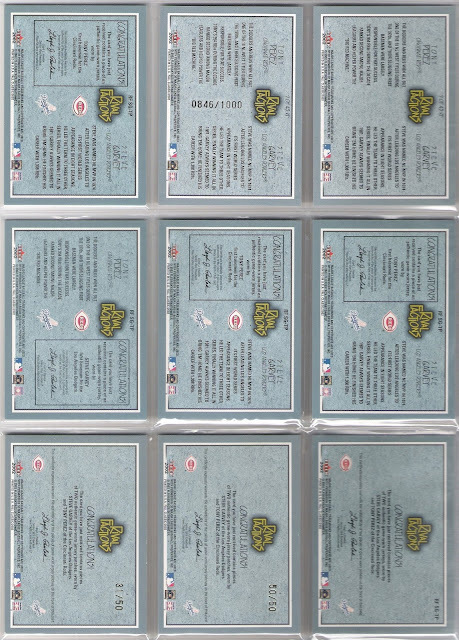 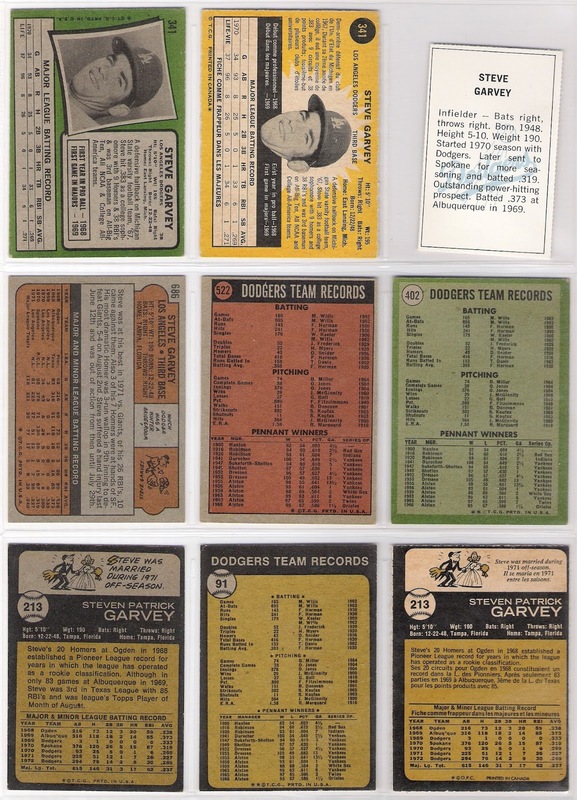 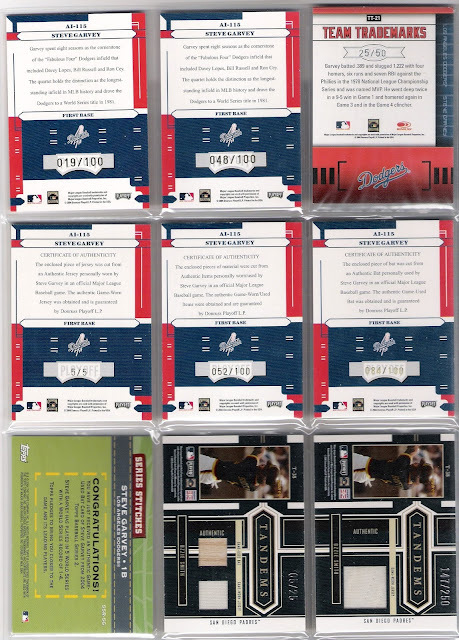 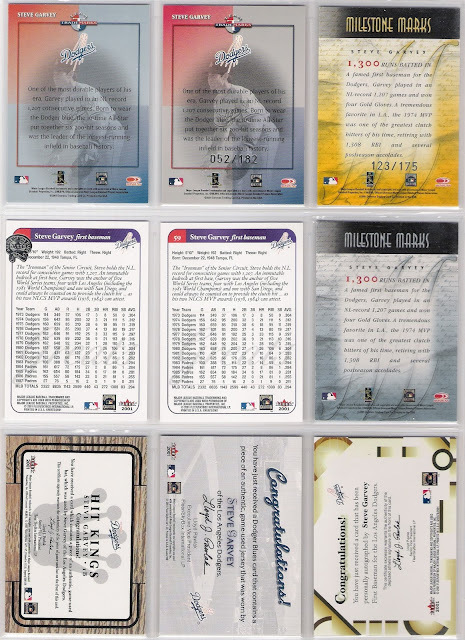 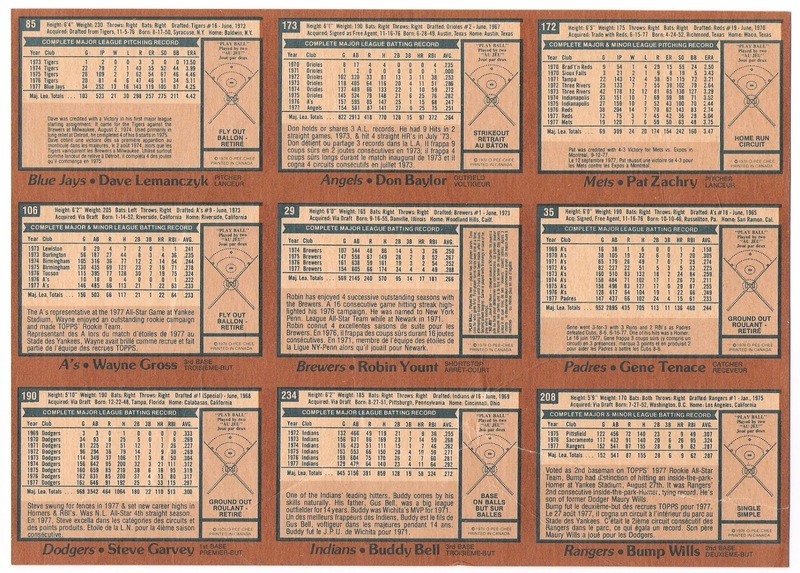 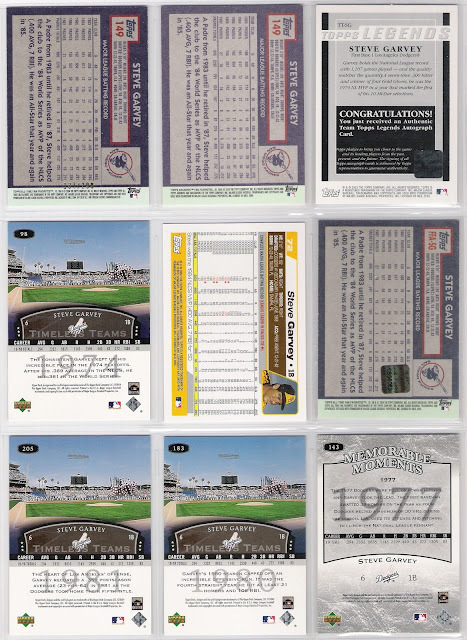 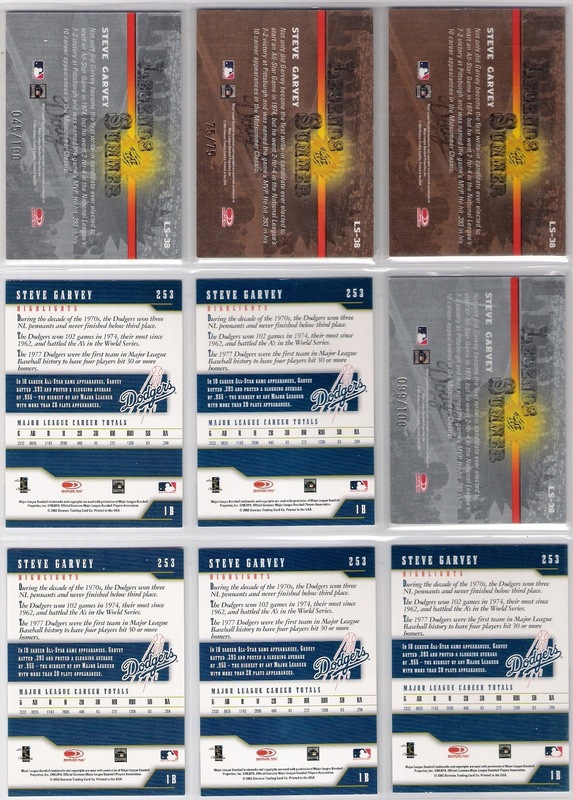 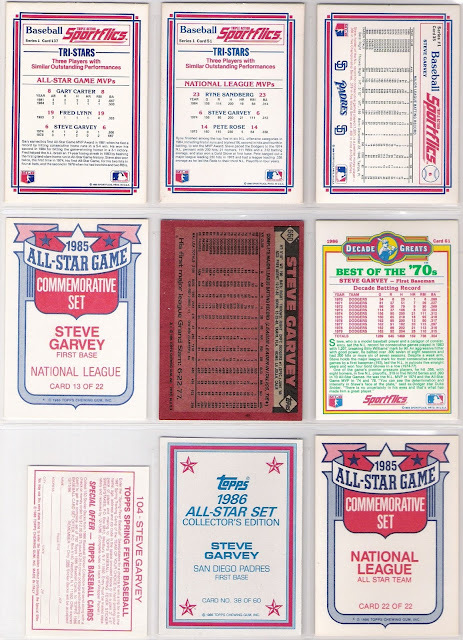 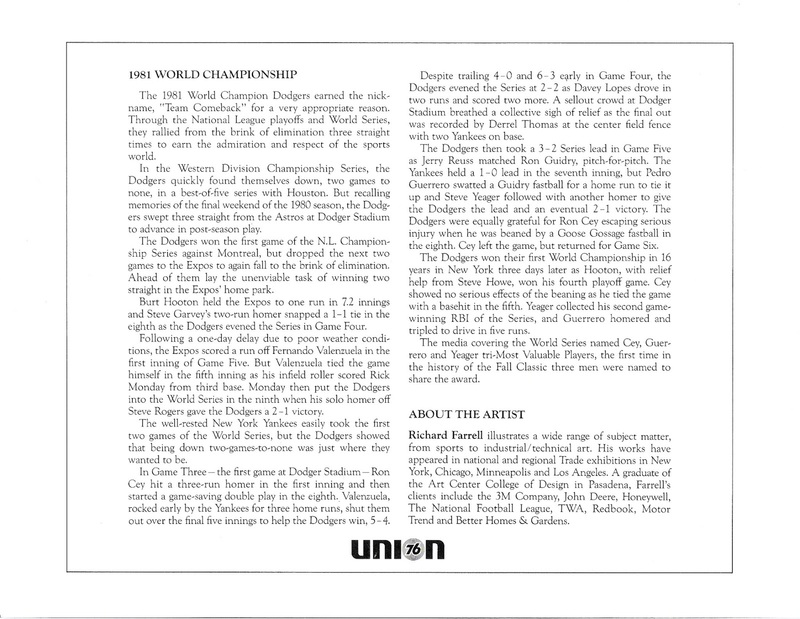 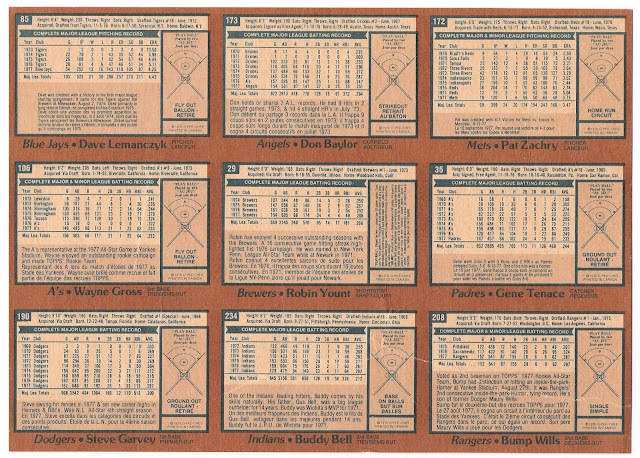 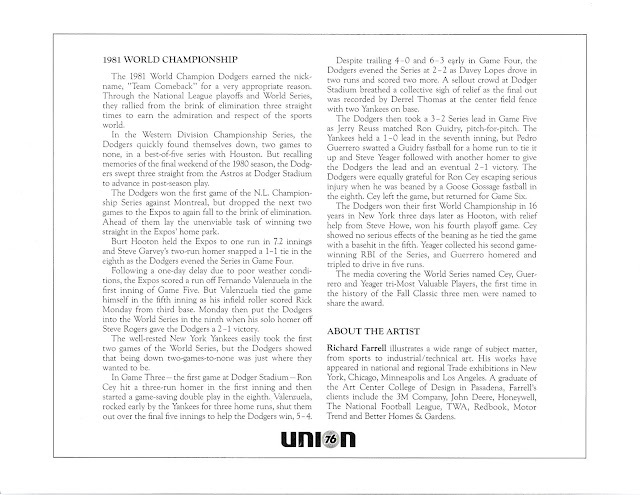 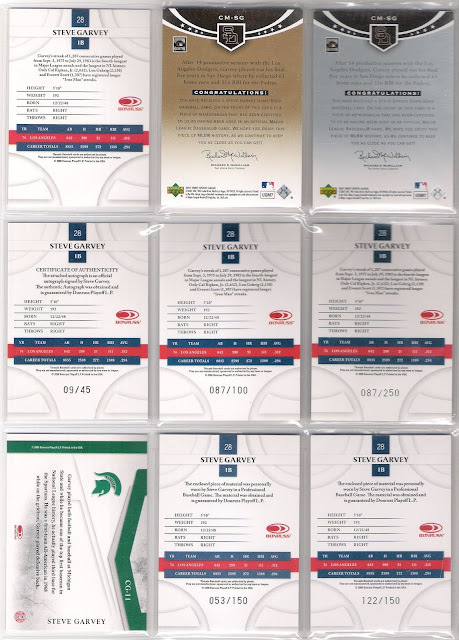 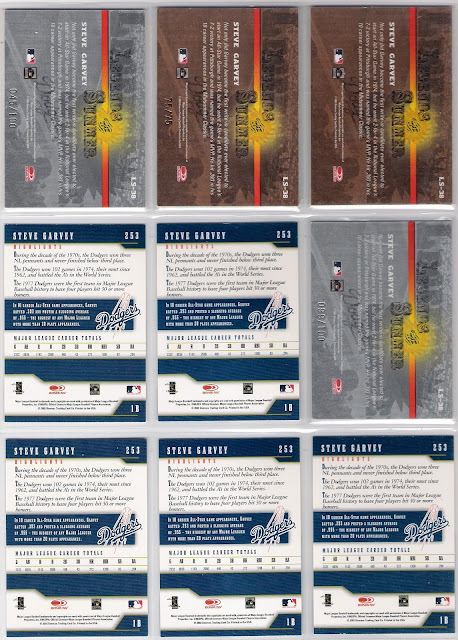 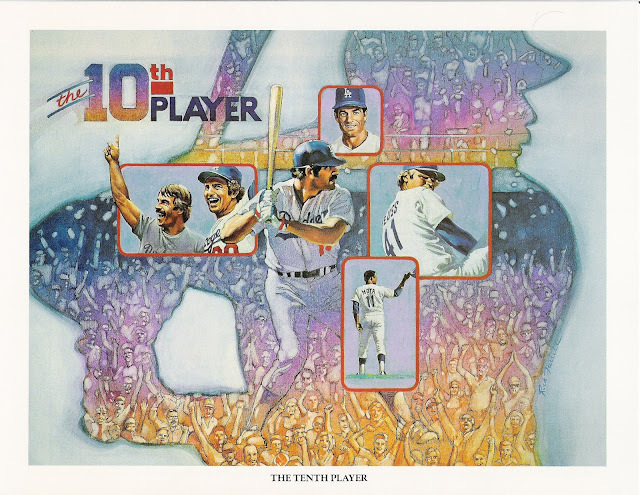 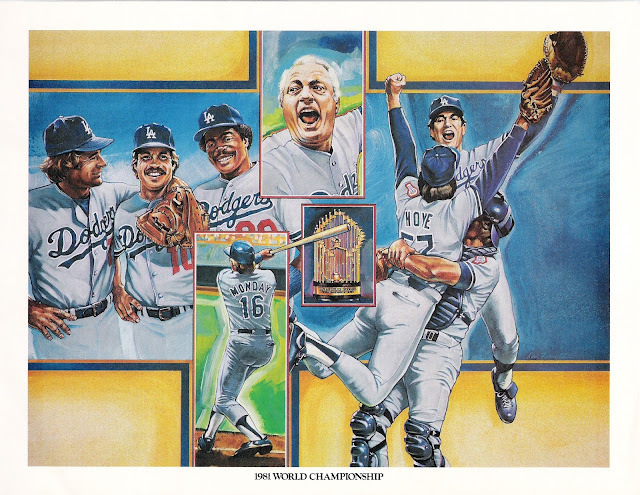 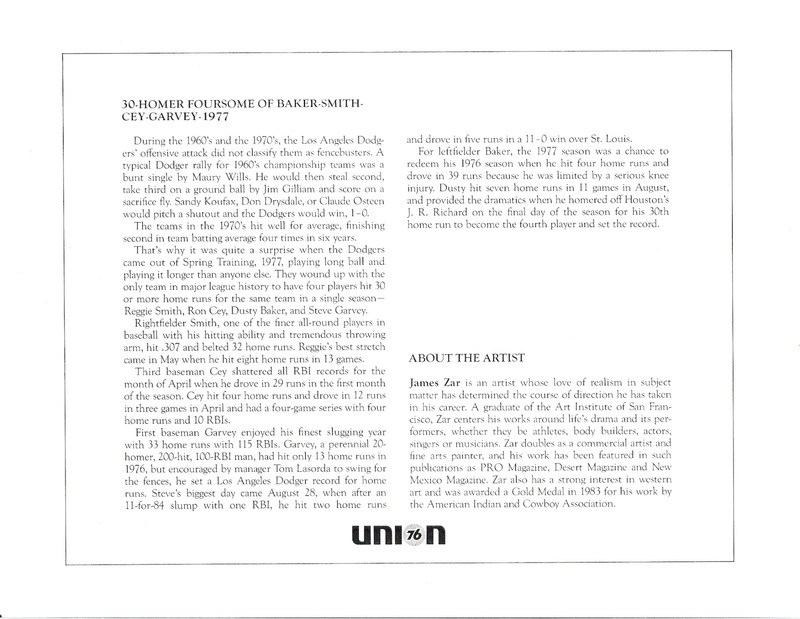 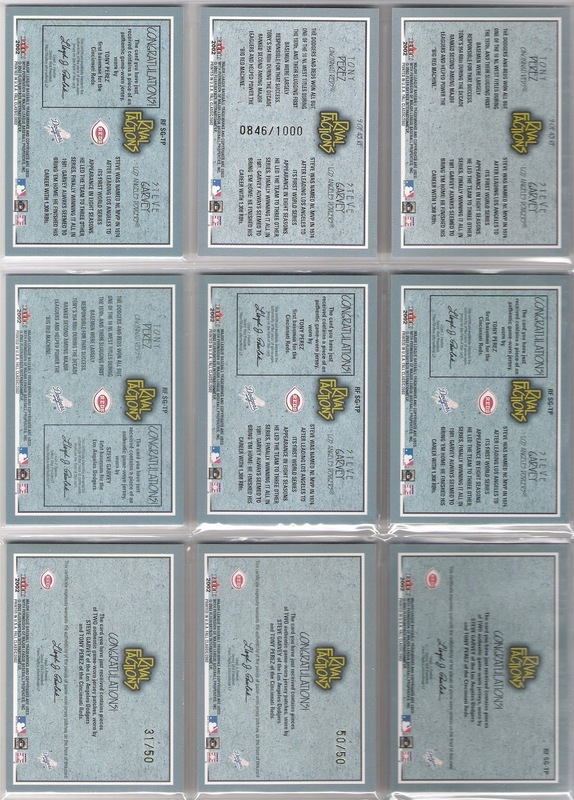 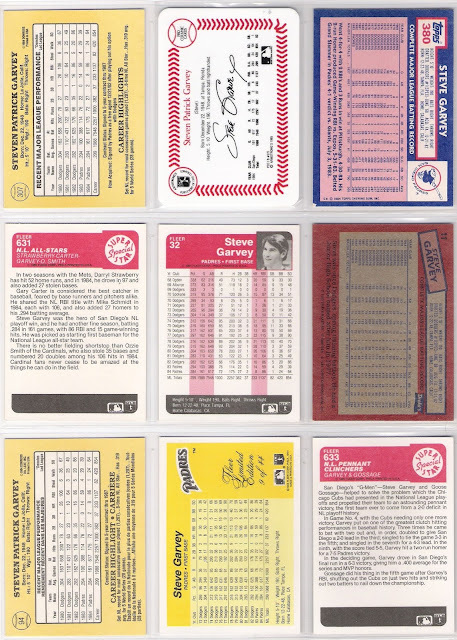 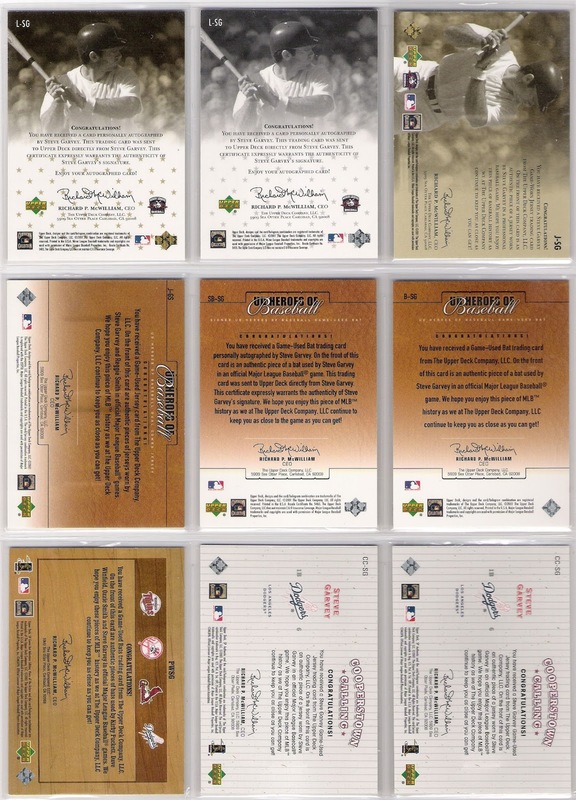 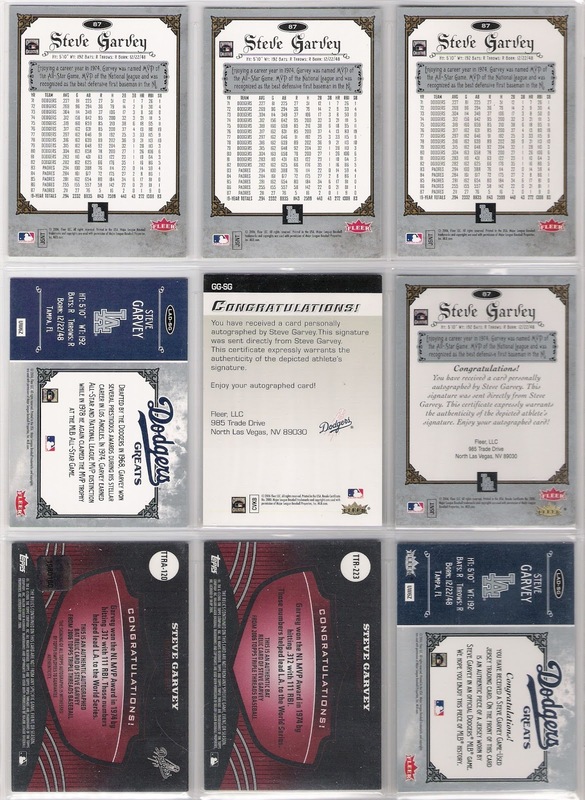 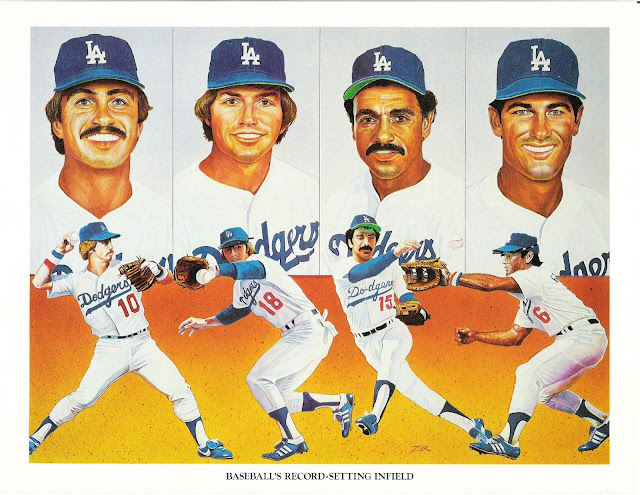 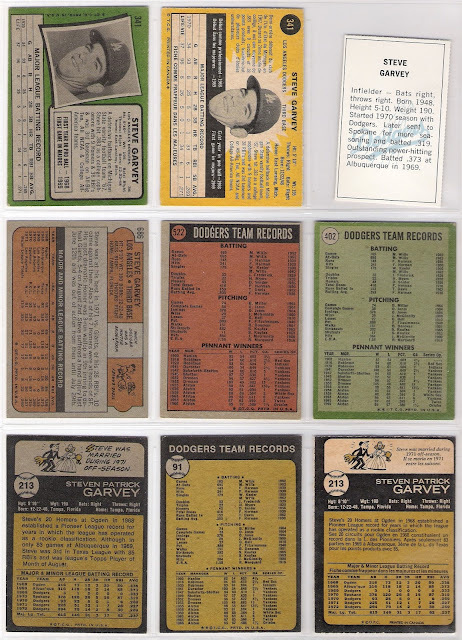 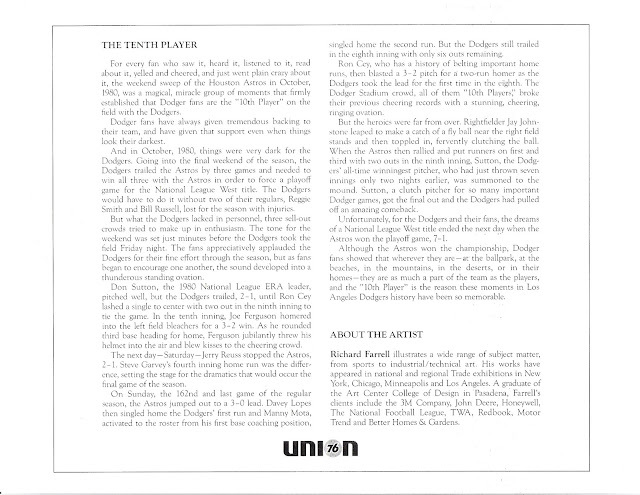 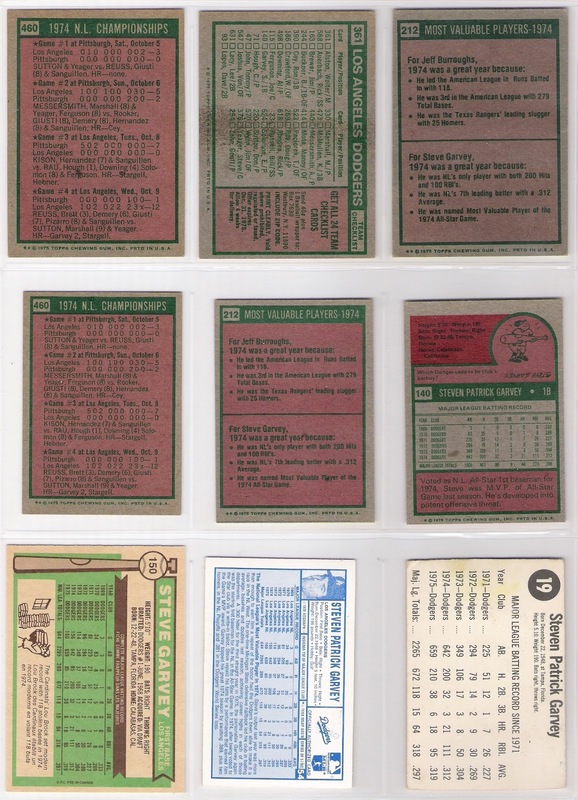 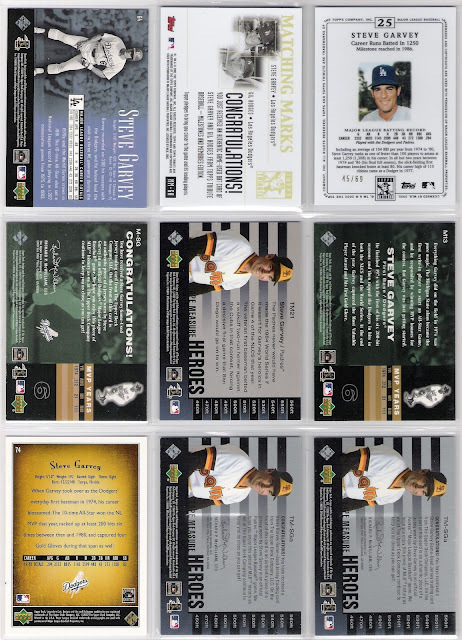 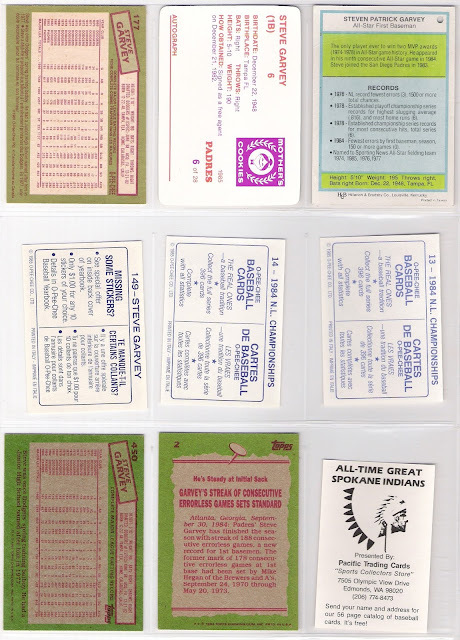 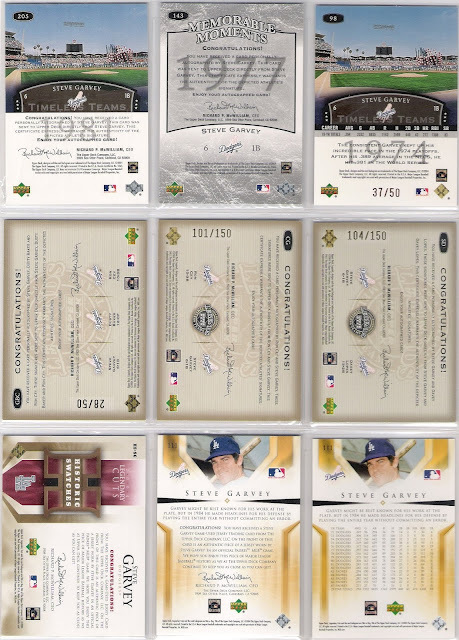 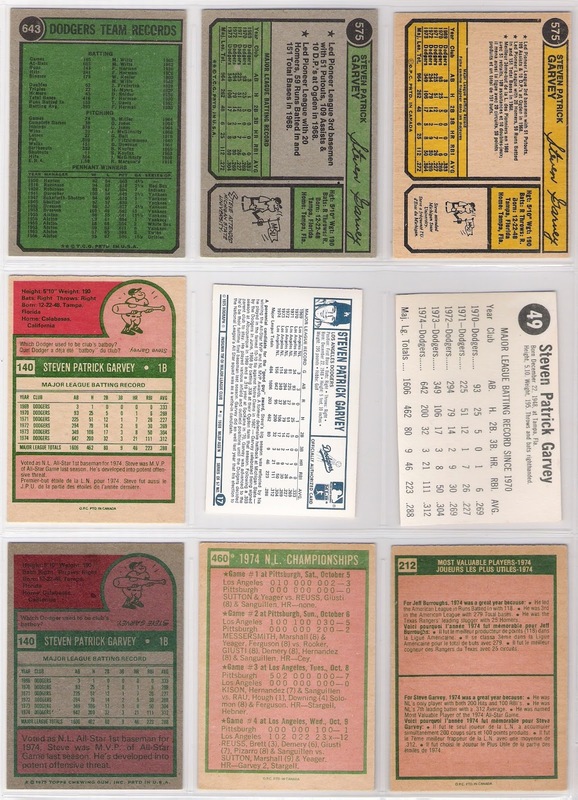 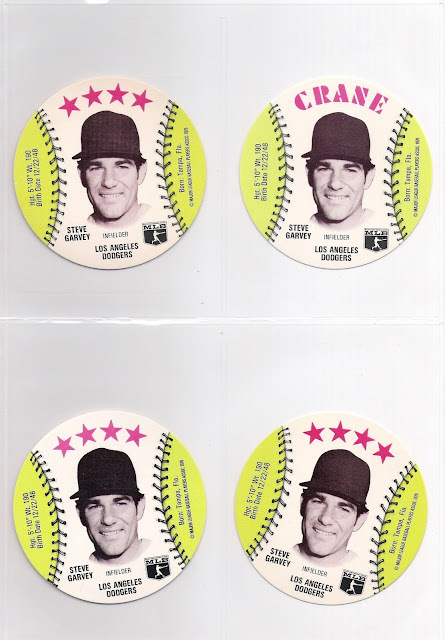 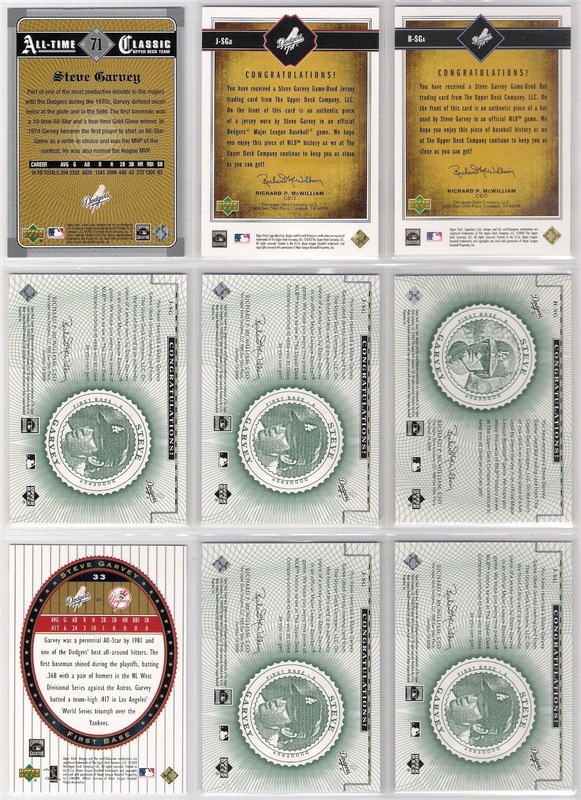 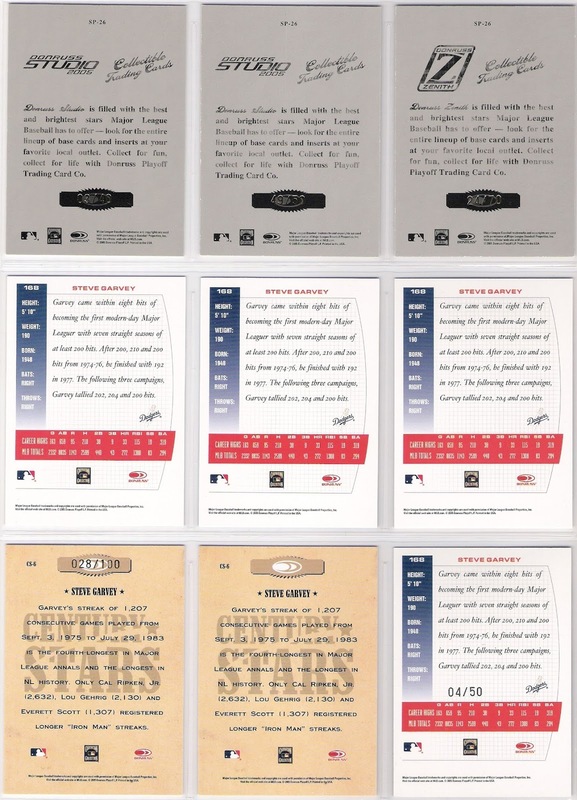 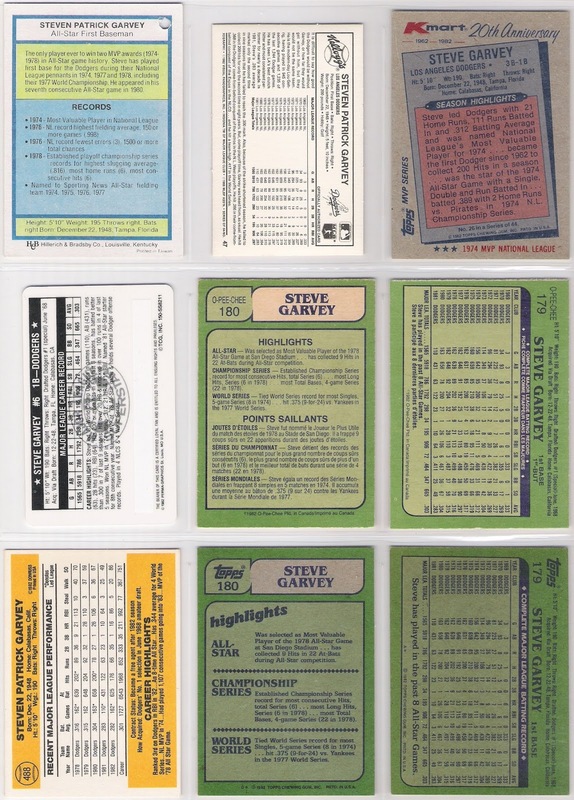 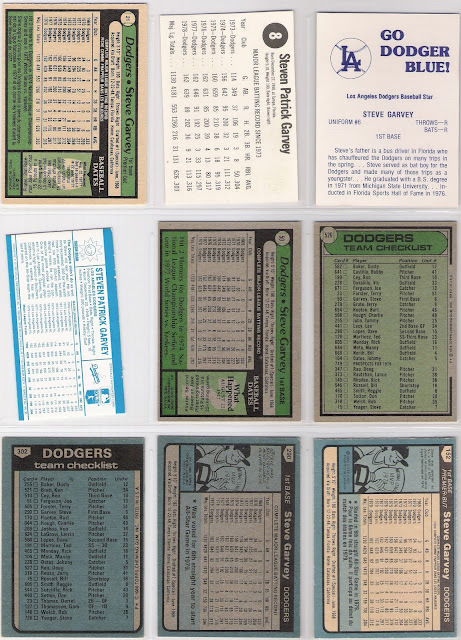 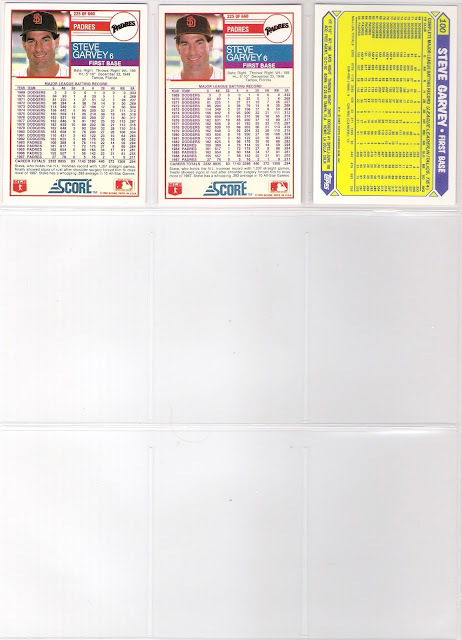 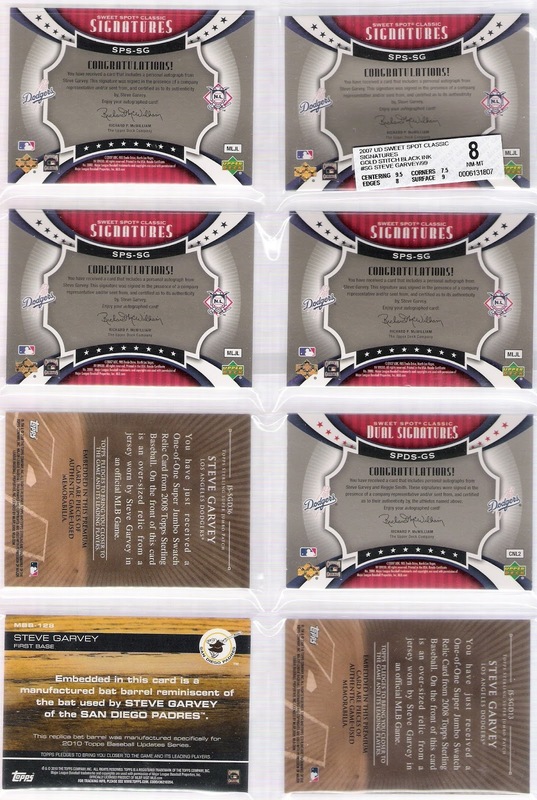 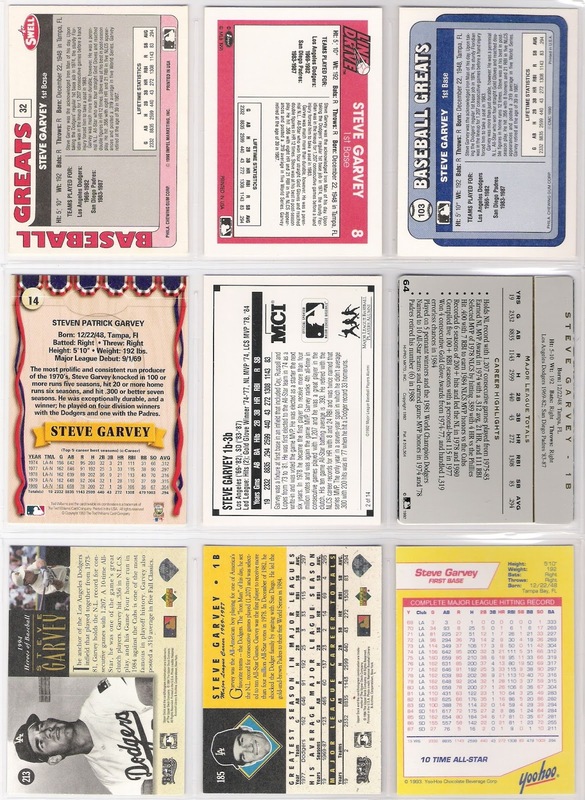 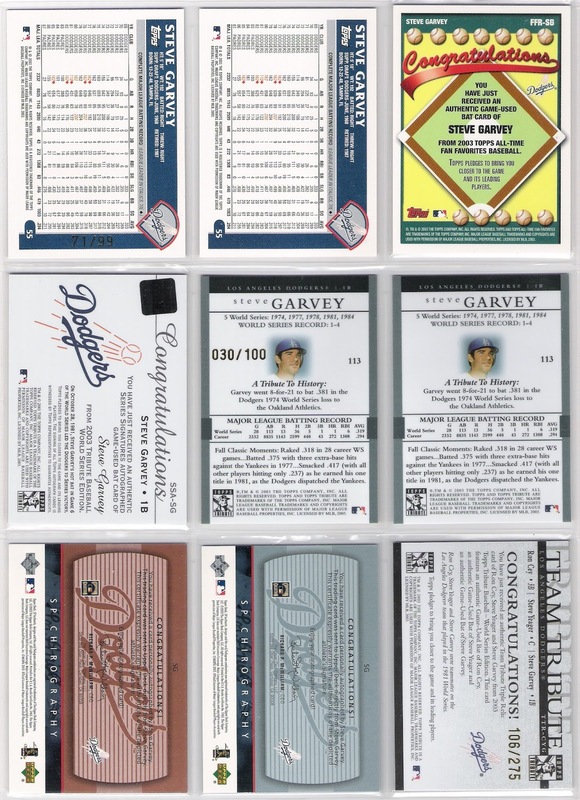 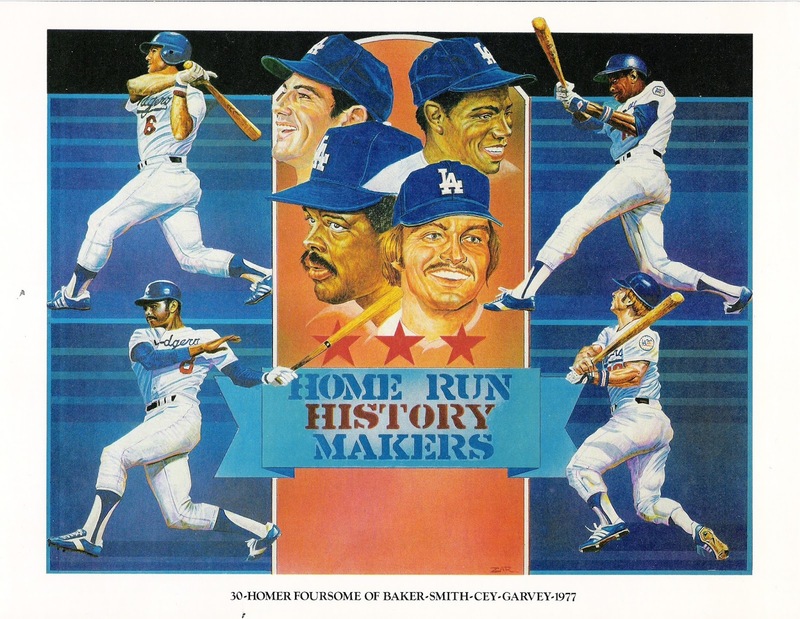 there will also, of course, be more cards featuring the players fortunate enough to play for the los angeles dodgers. 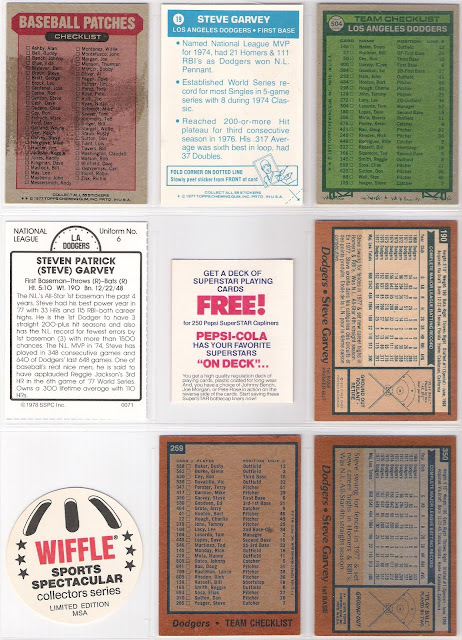 i will still be collecting those cards. 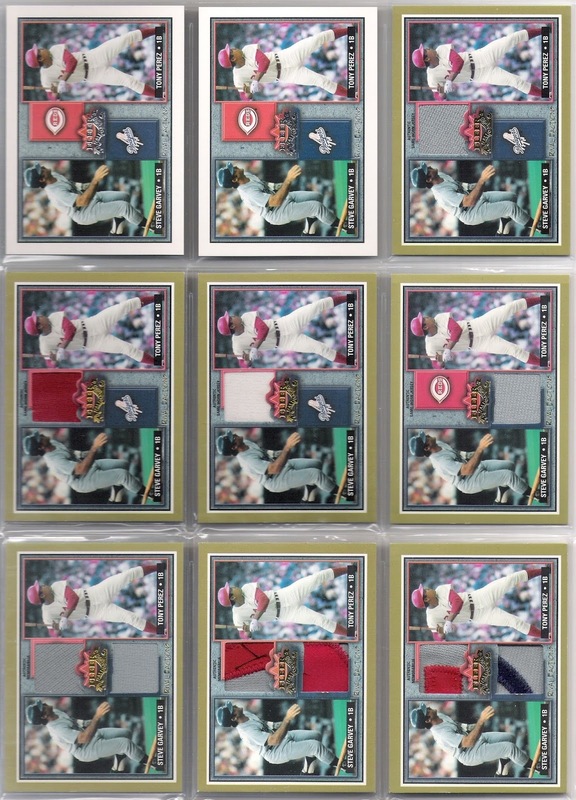 i would still like to trade if you have some of those cards. but, i won't be posting about those cards. 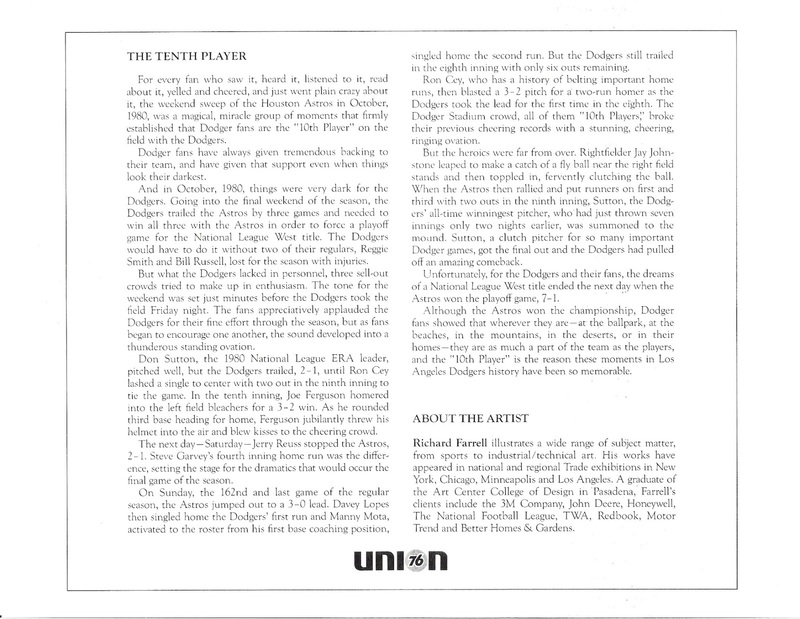 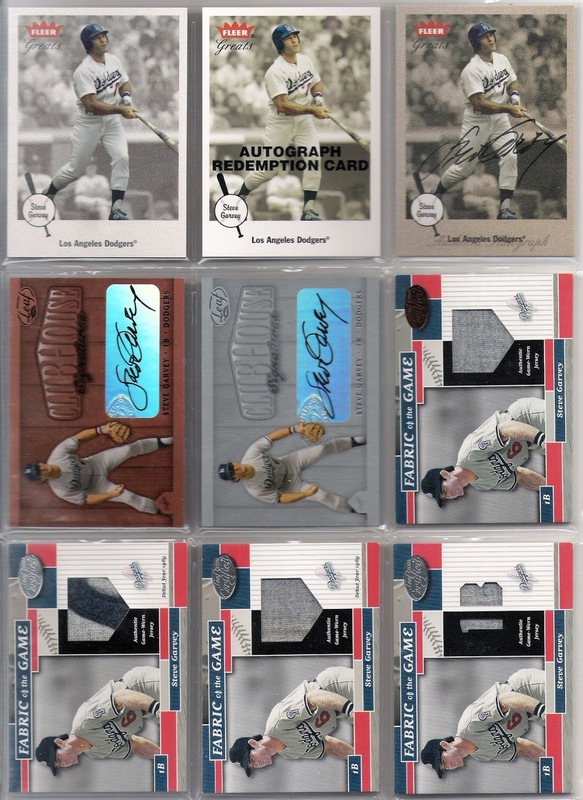 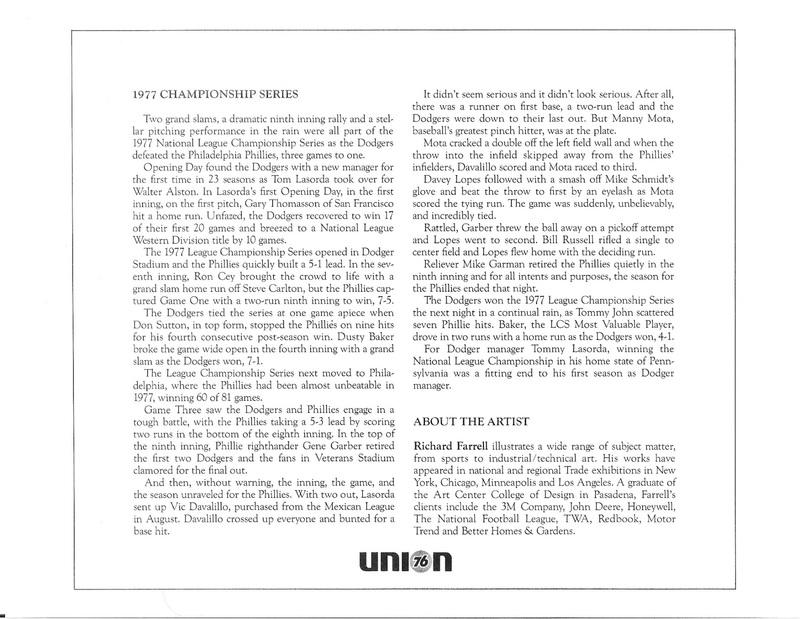 i've done what i set out to do, which was to add my voice to the baseball card collecting community that was exploding in the fall of 2008; to make sure that the dodgers got a fair shake in that community; to highlight the excellence that was the dodger infield and the team of my youth; and to make it known that i was a collector with a passion and a collection worth sharing. 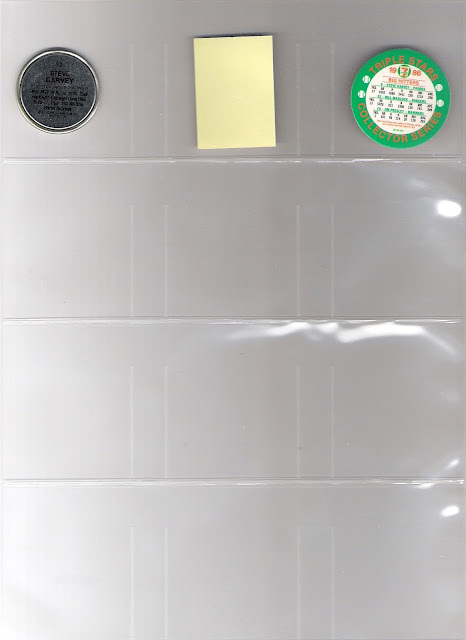 to me, it was worth it. 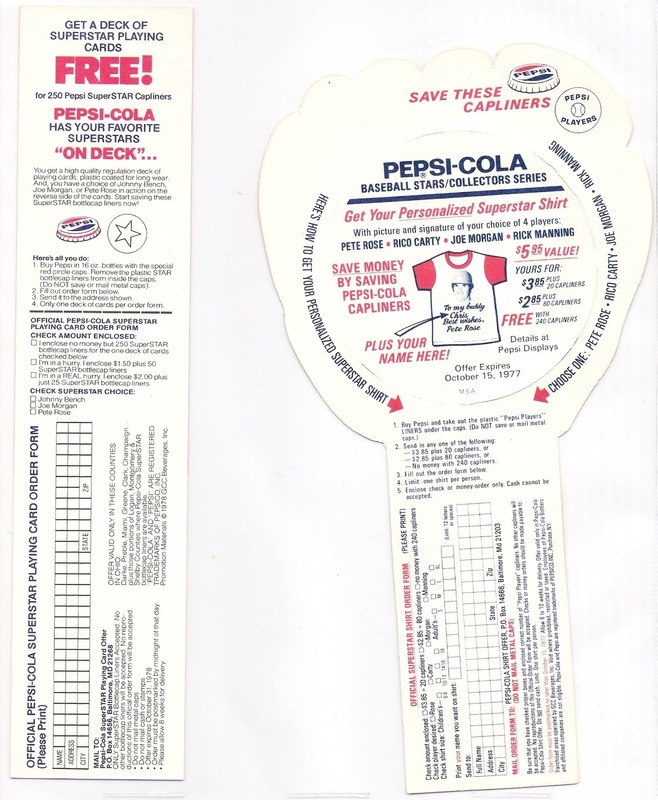 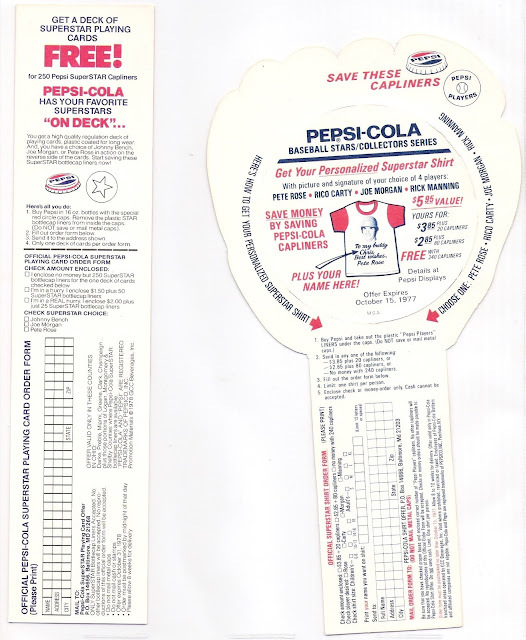 this was the infield of my youth. 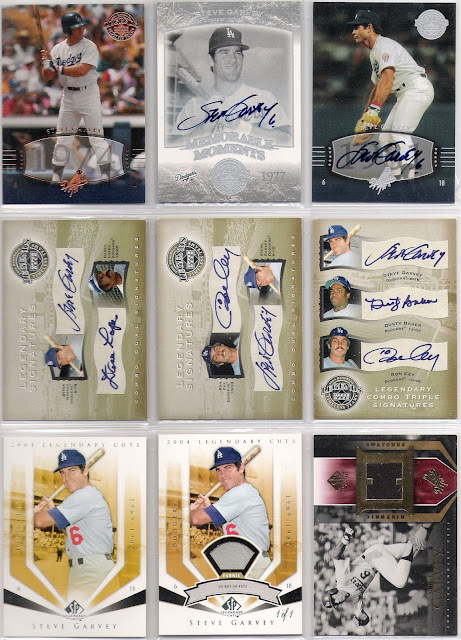 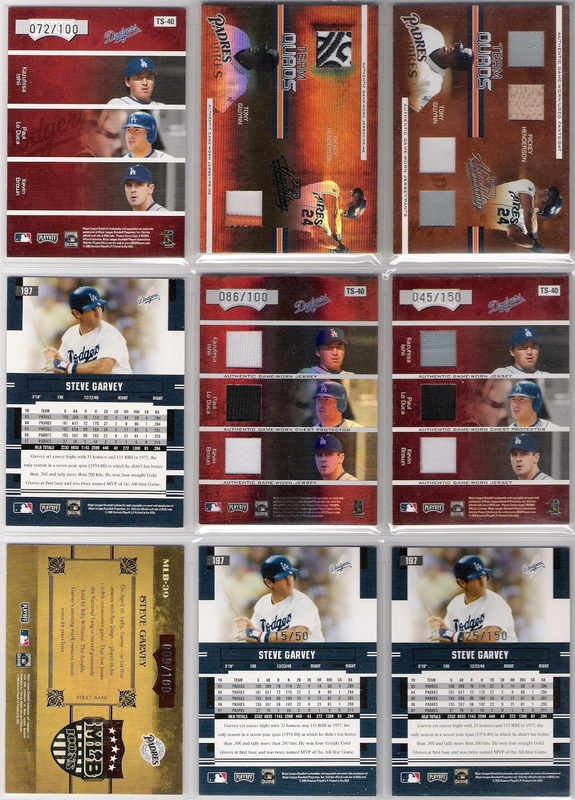 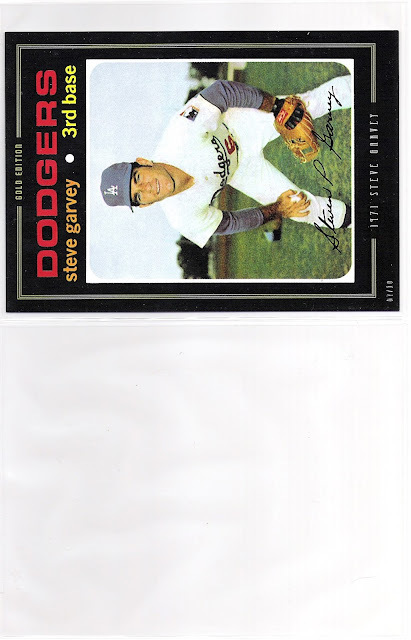 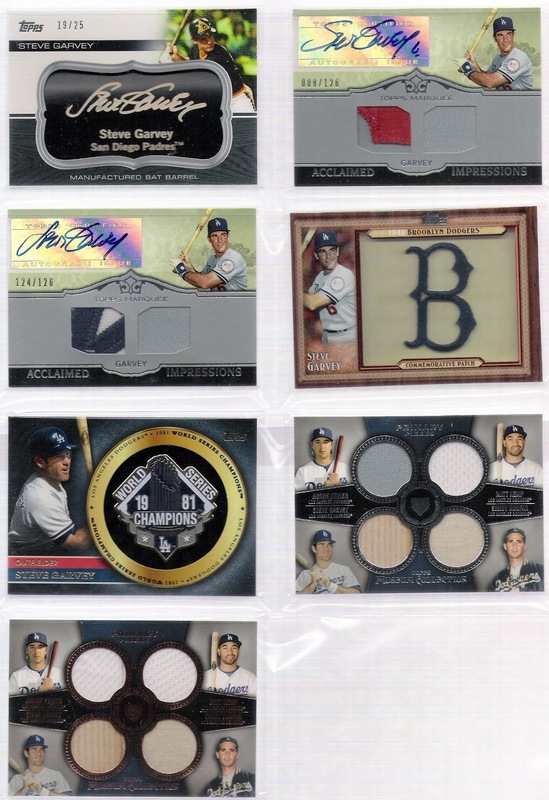 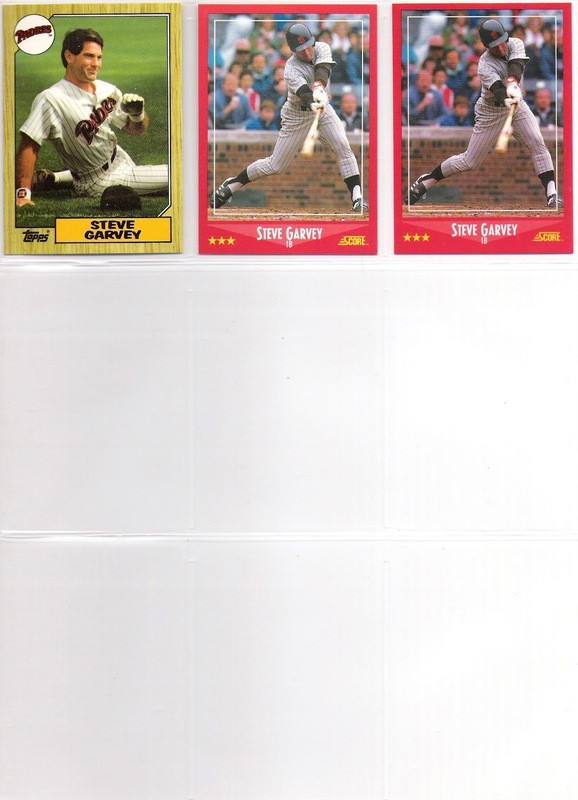 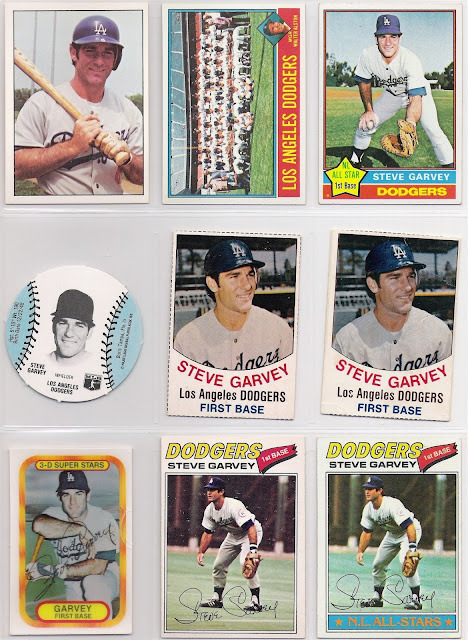 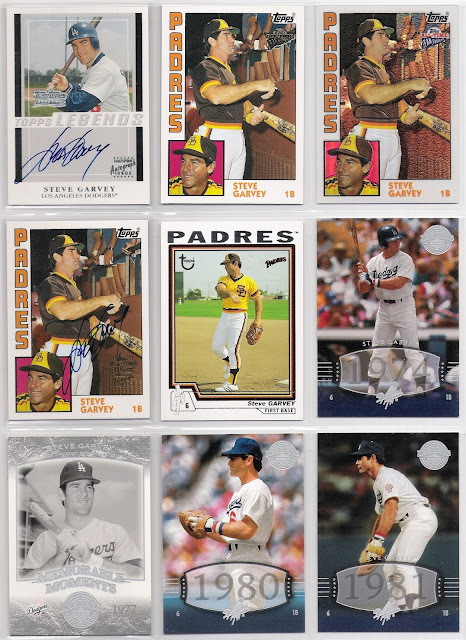 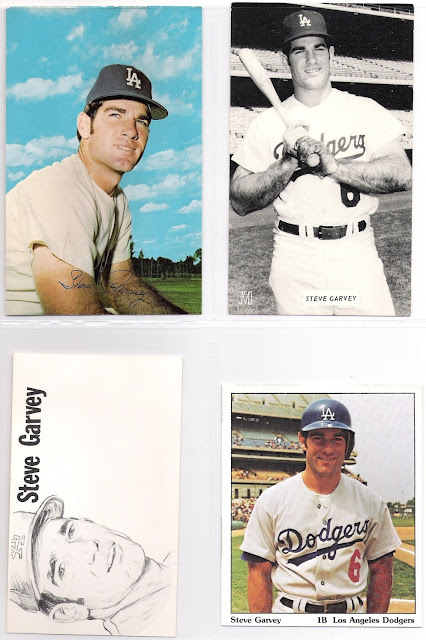 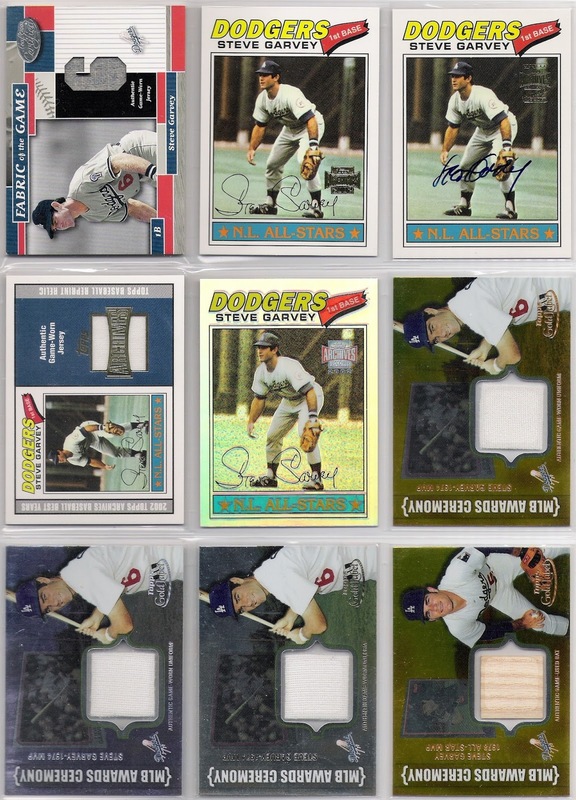 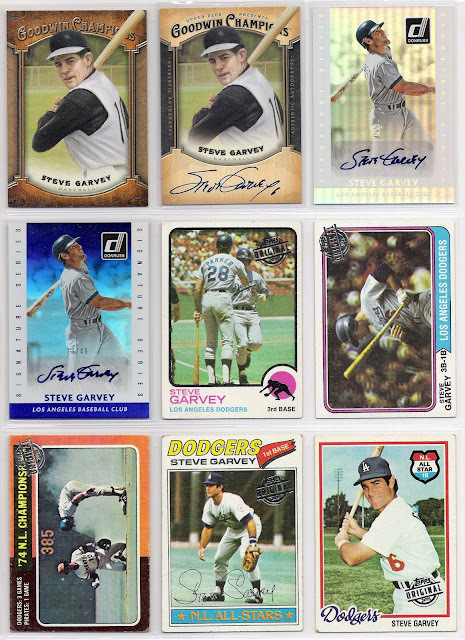 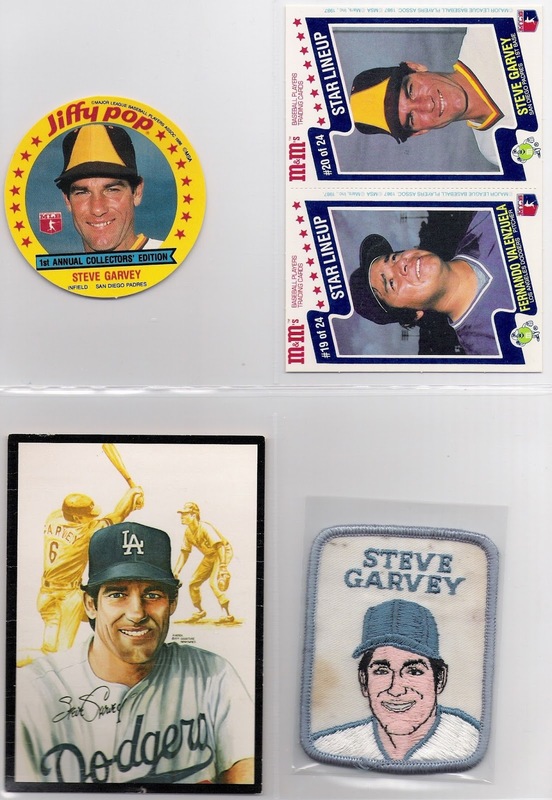 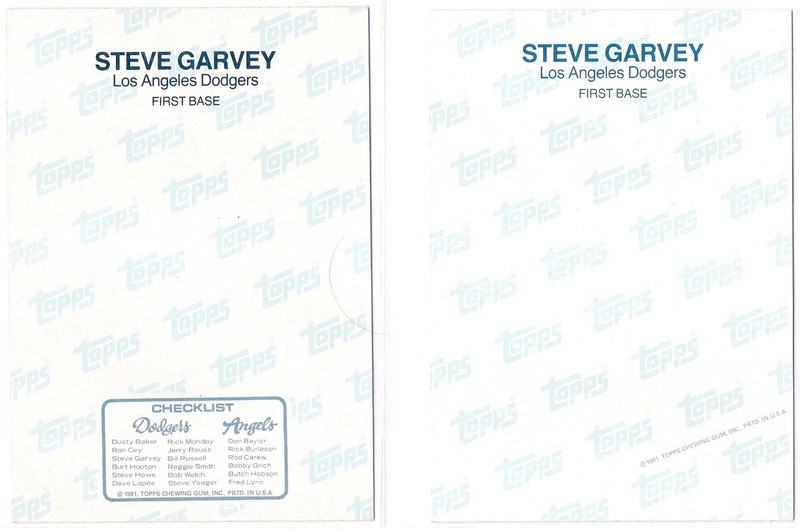 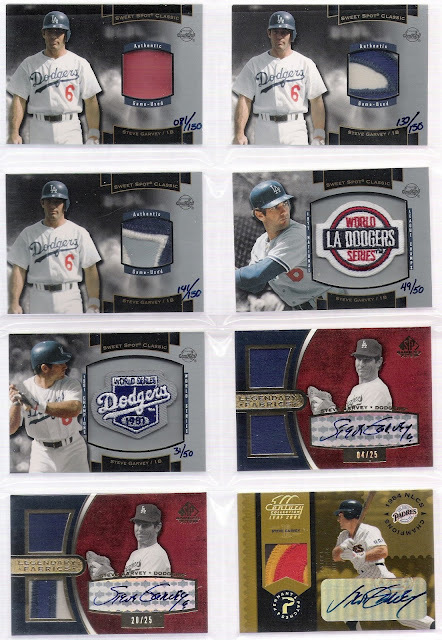 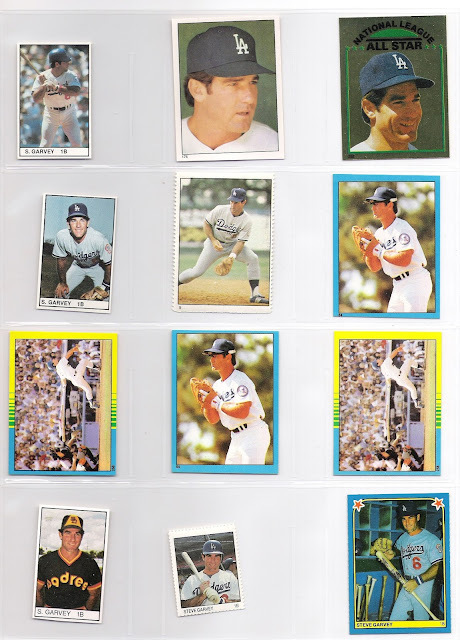 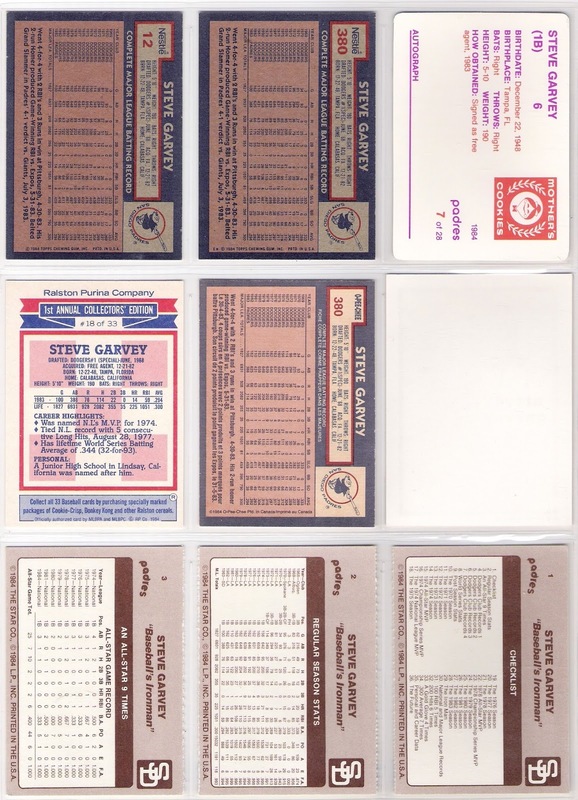 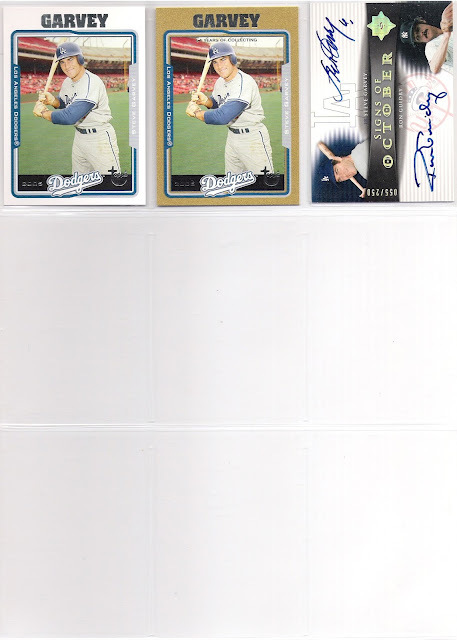 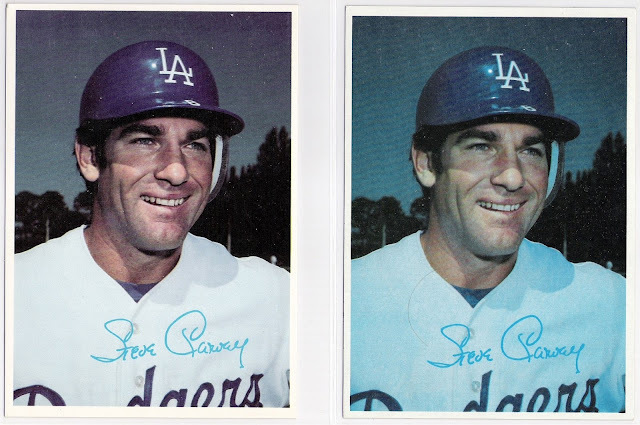 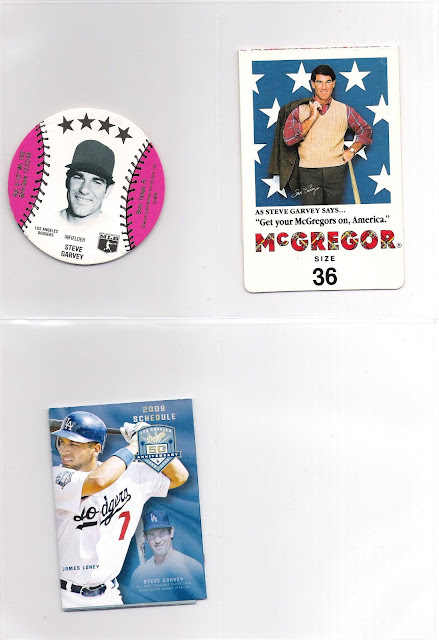 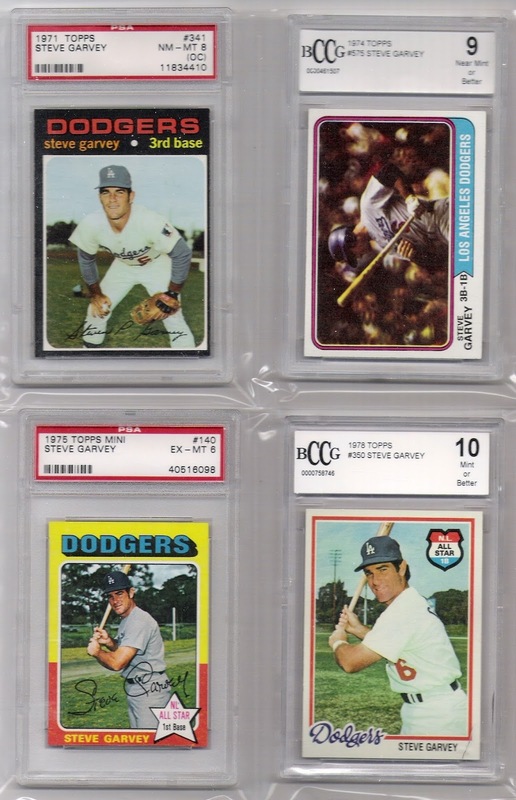 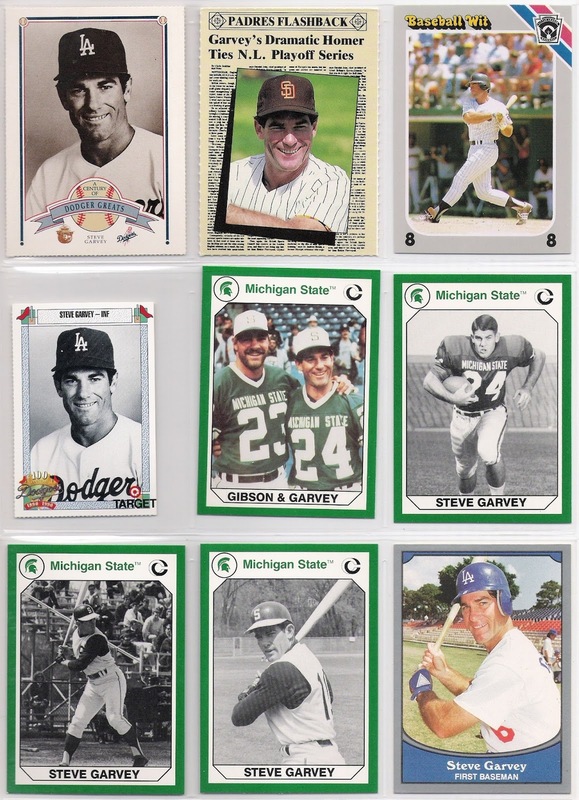 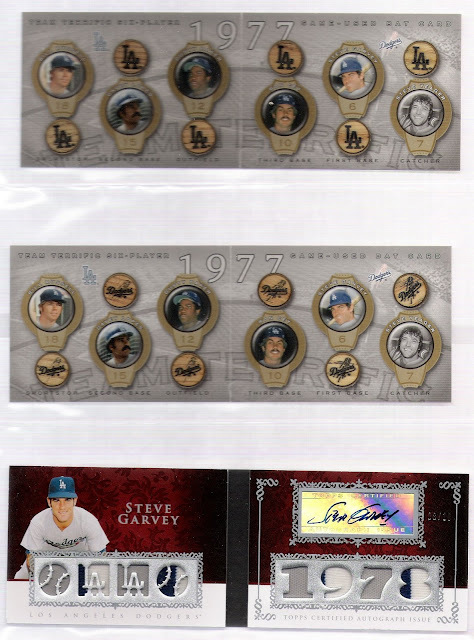 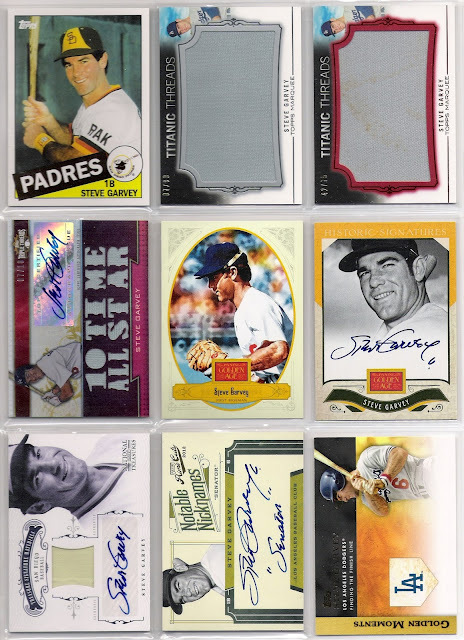 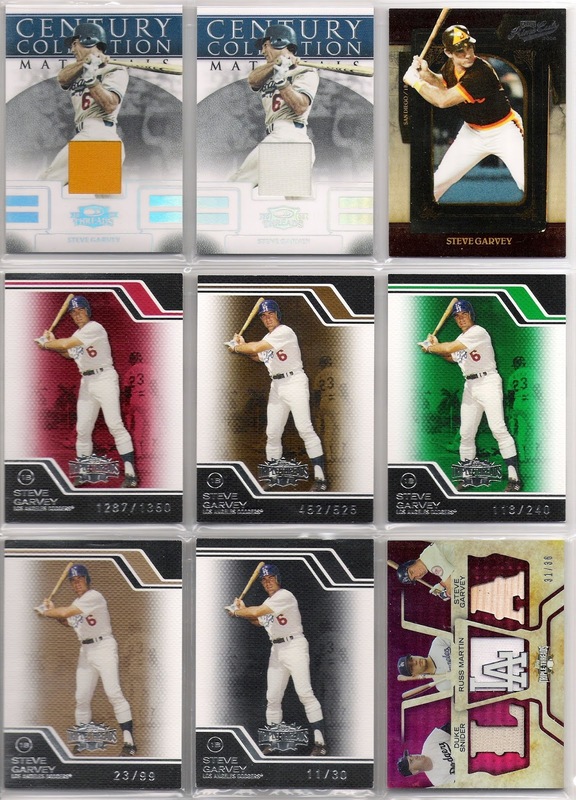 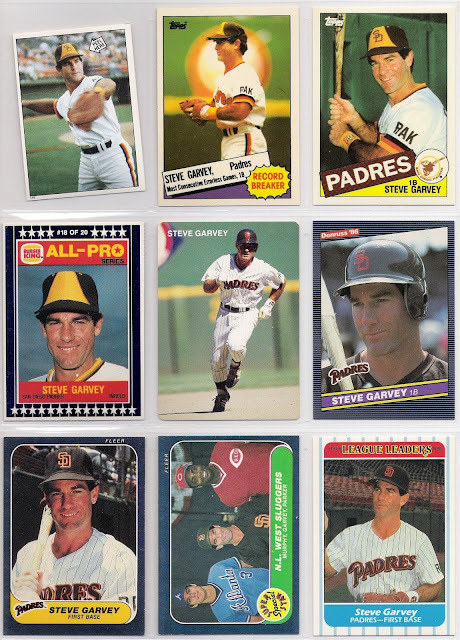 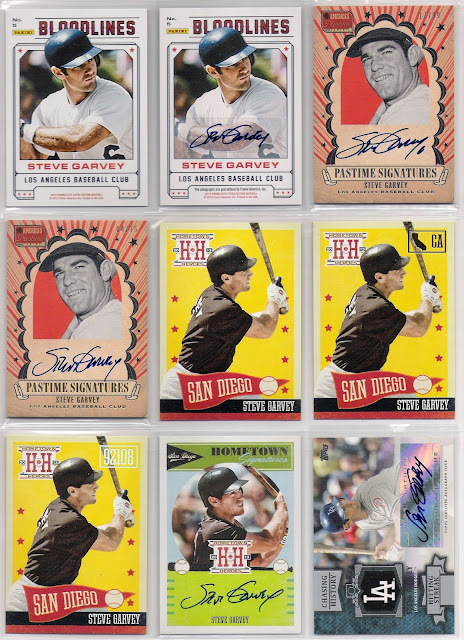 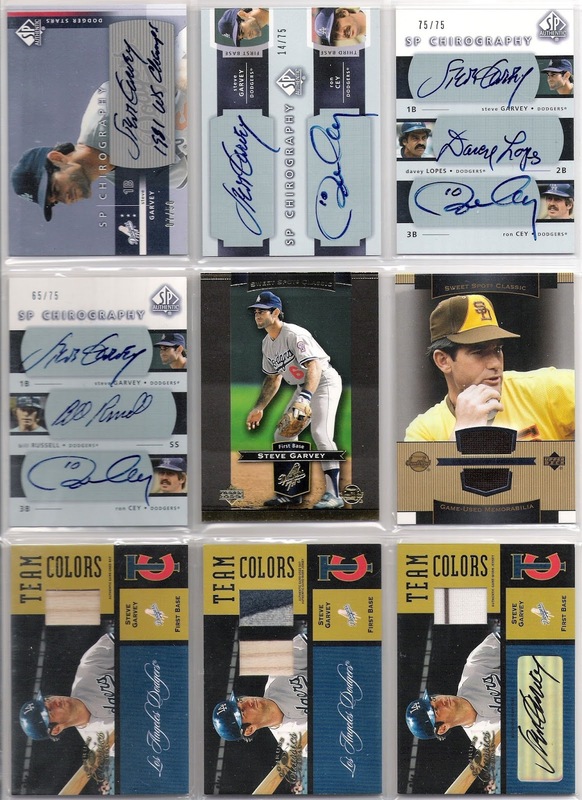 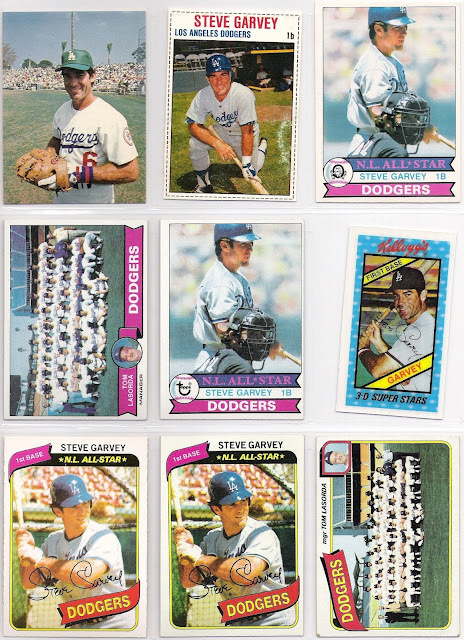 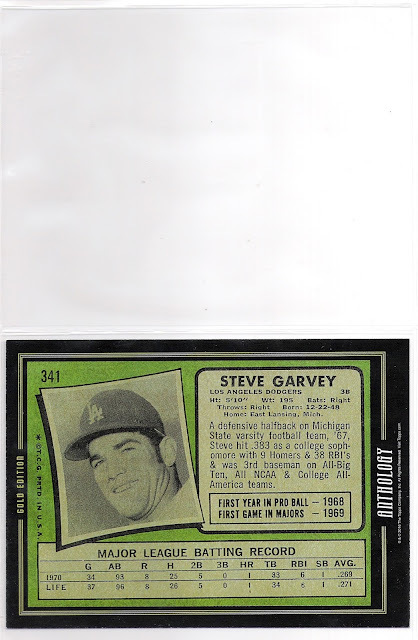 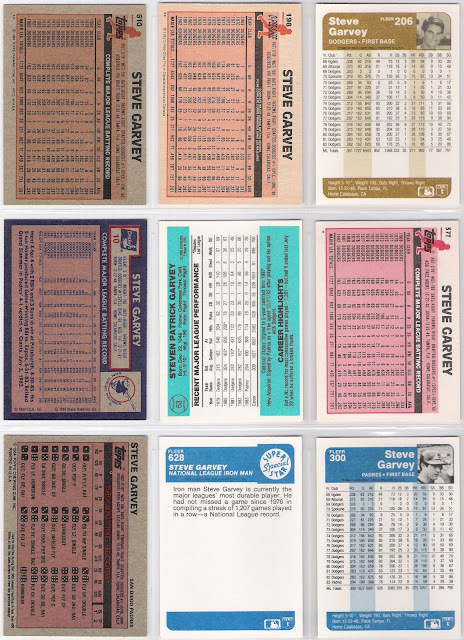 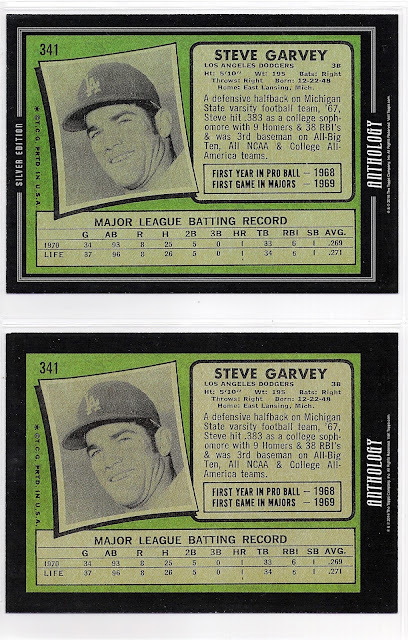 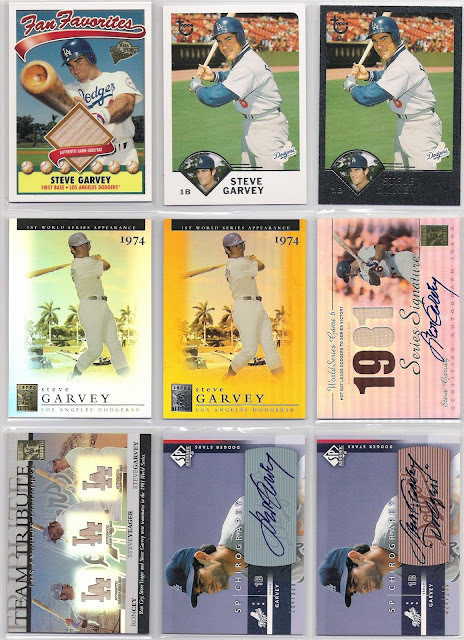 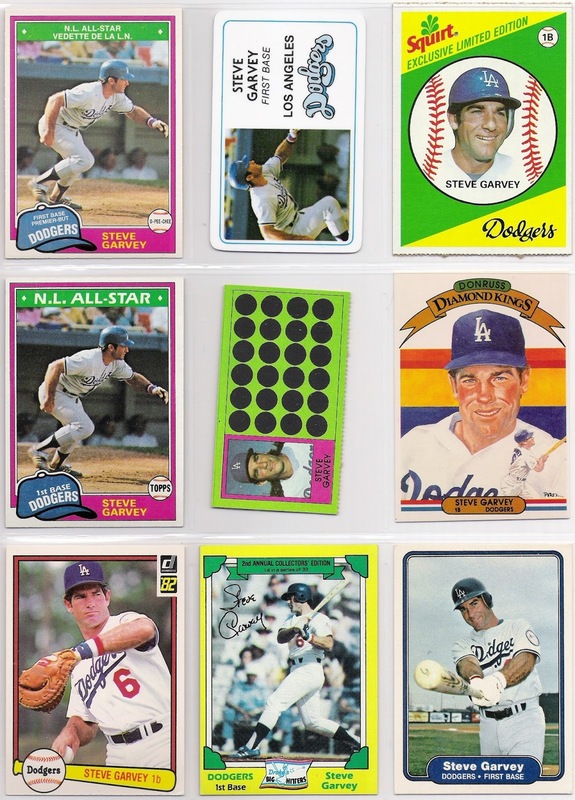 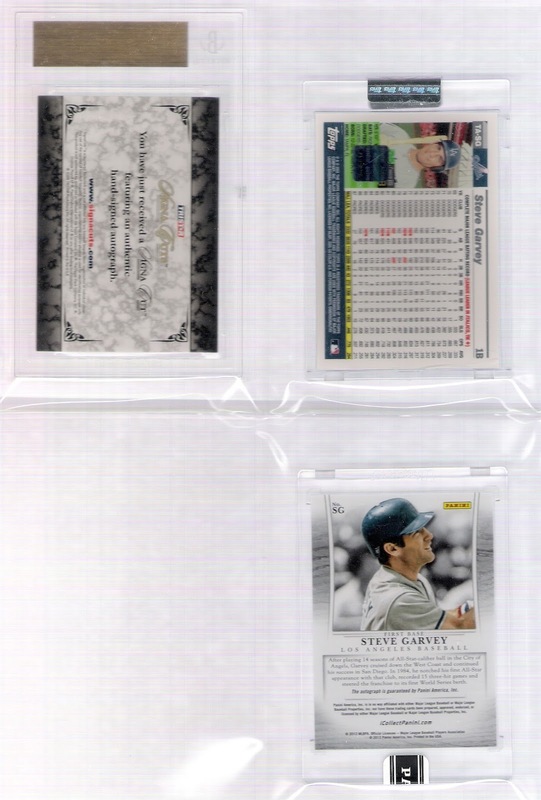 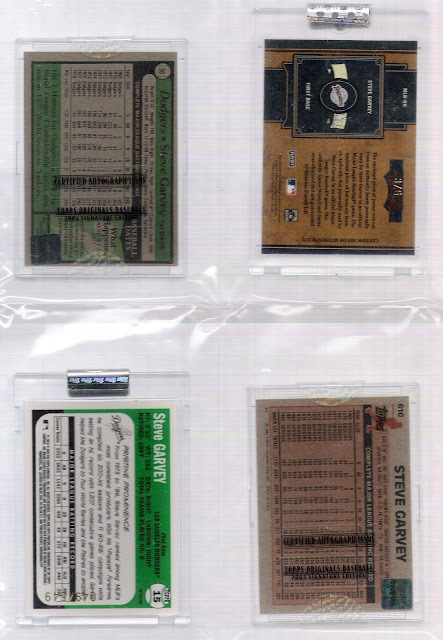 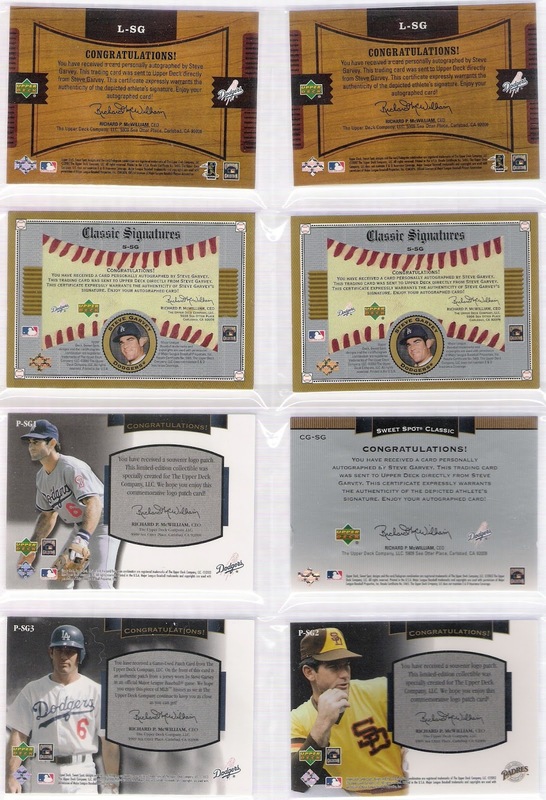 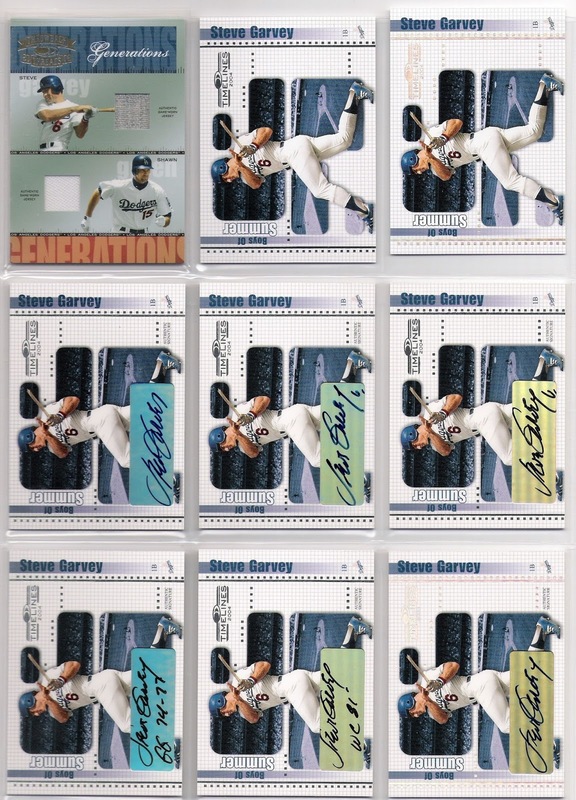 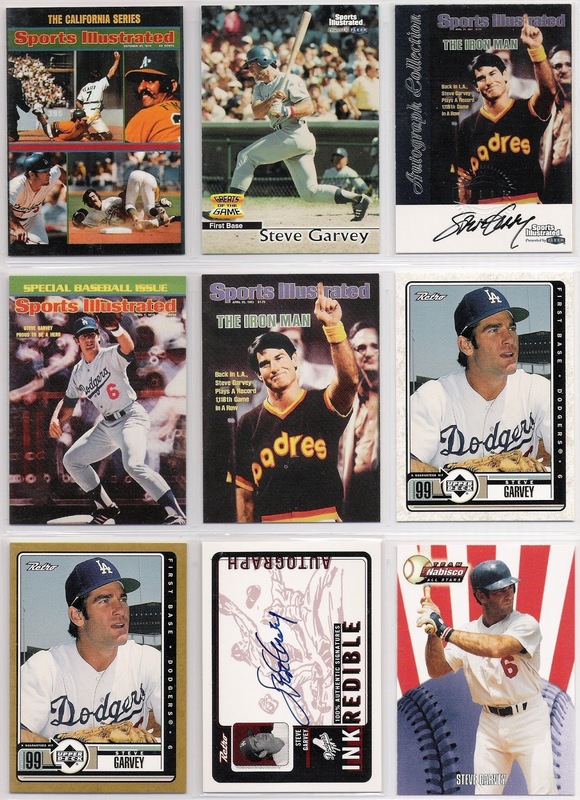 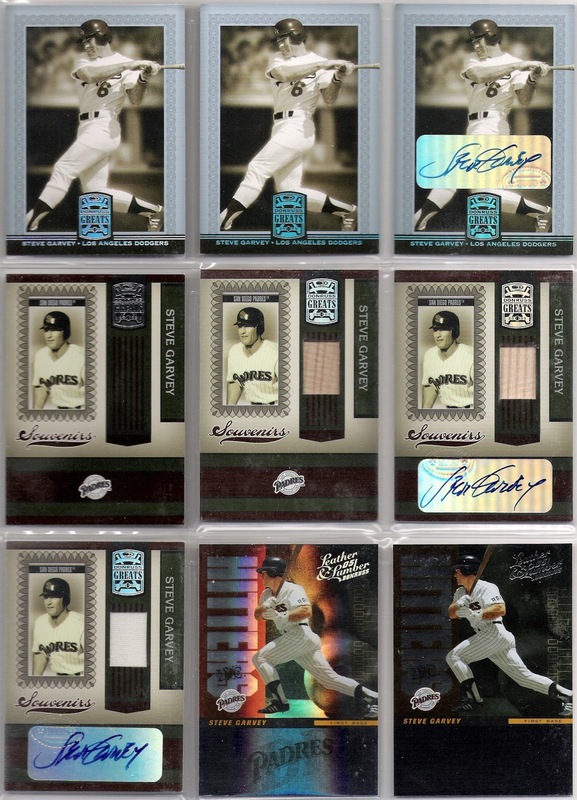 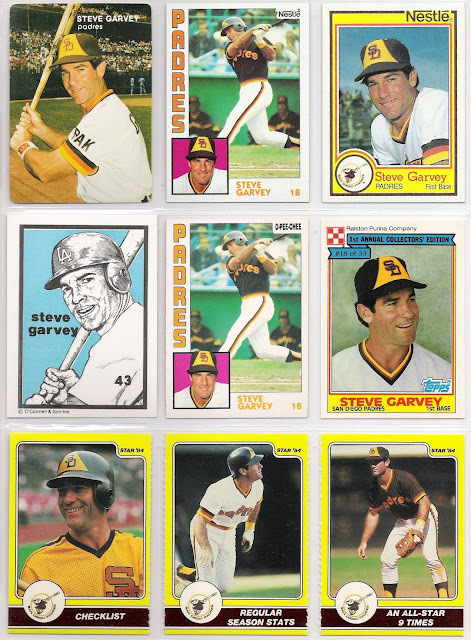 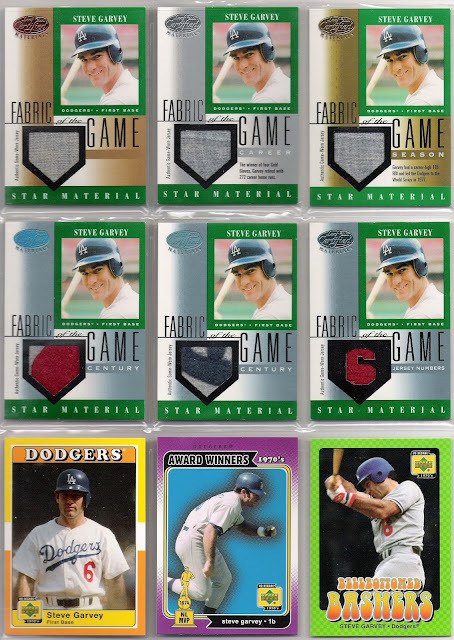 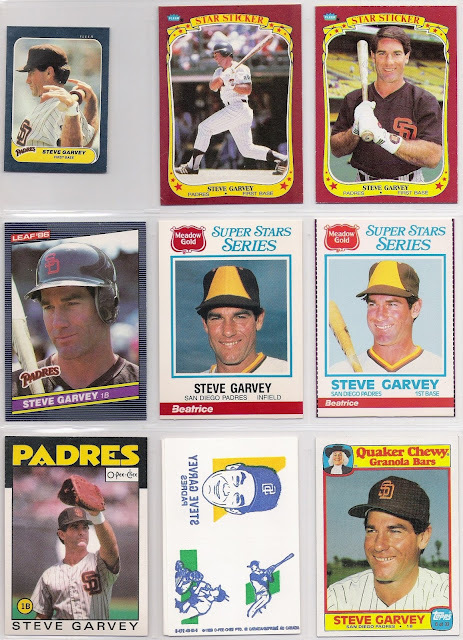 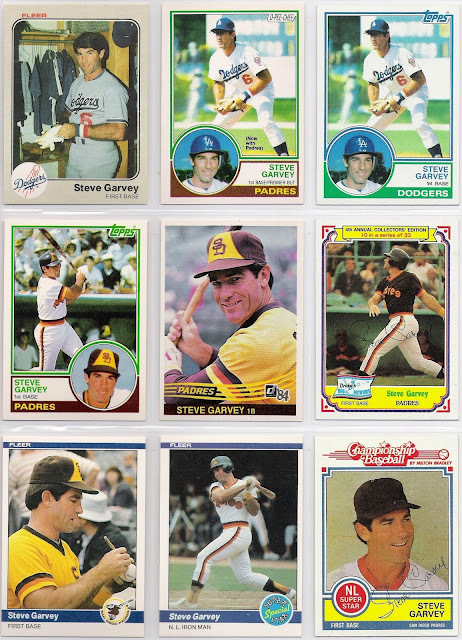 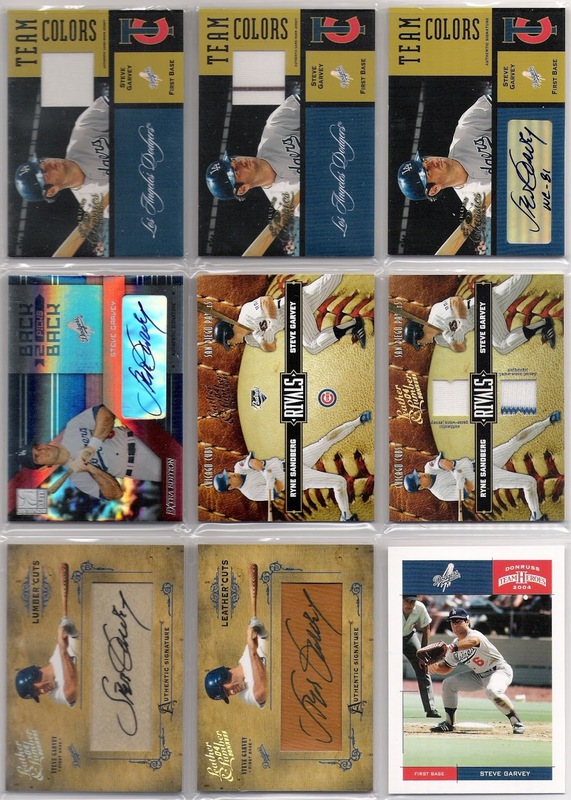 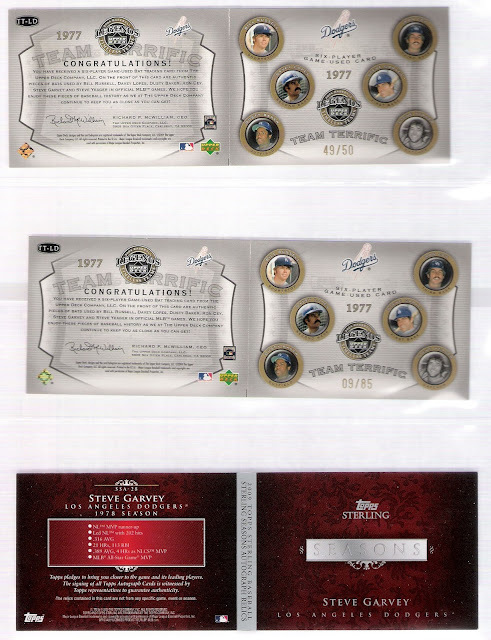 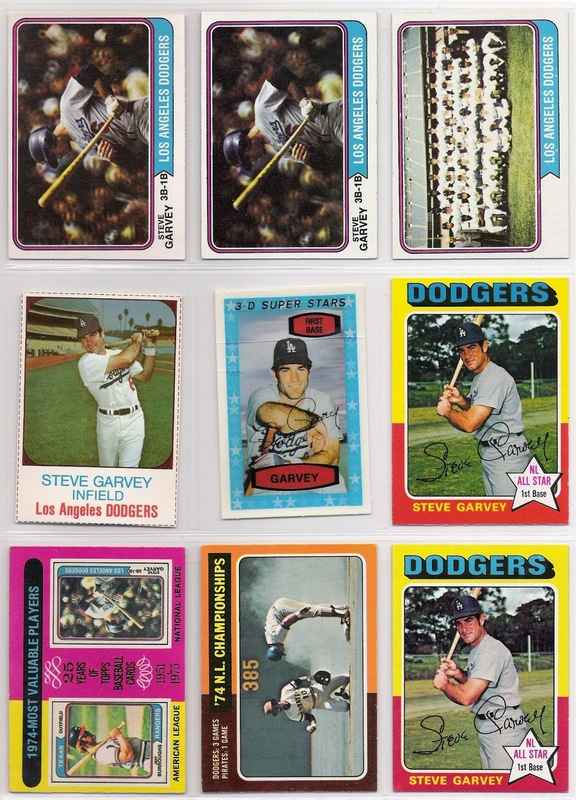 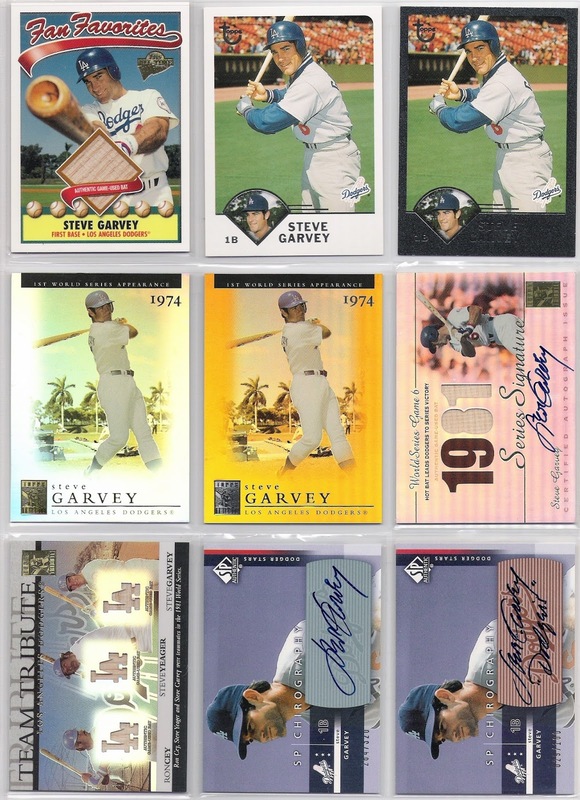 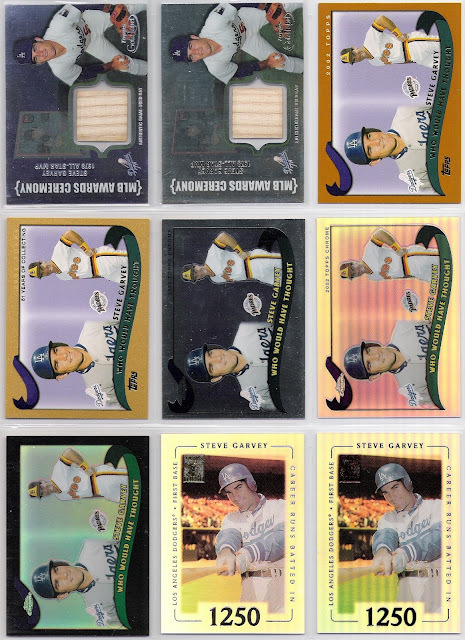 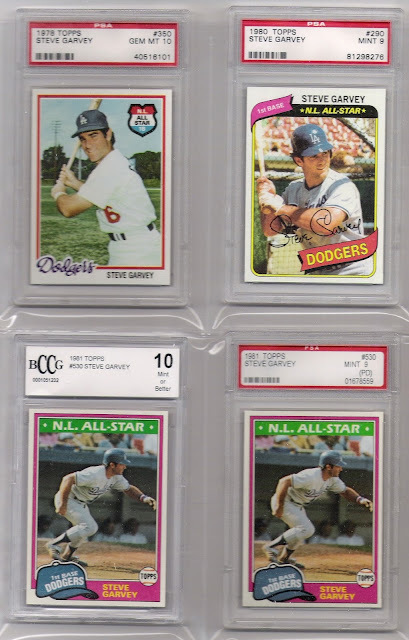 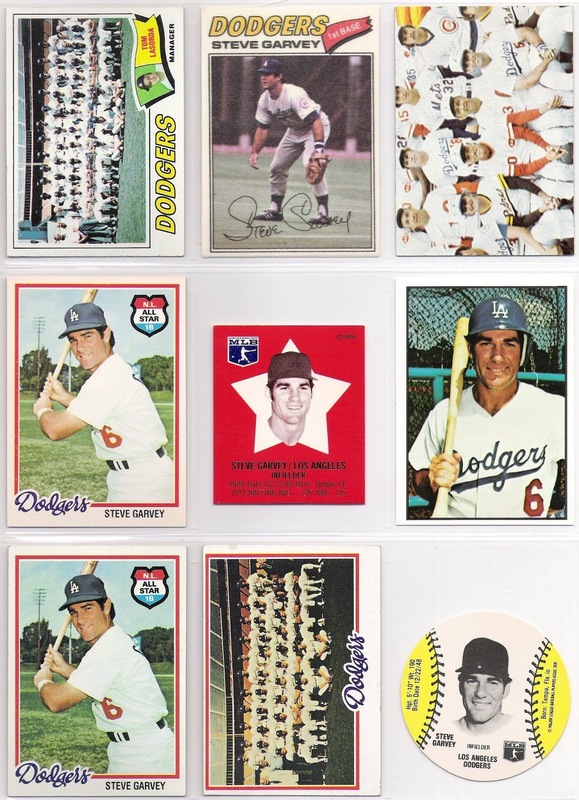 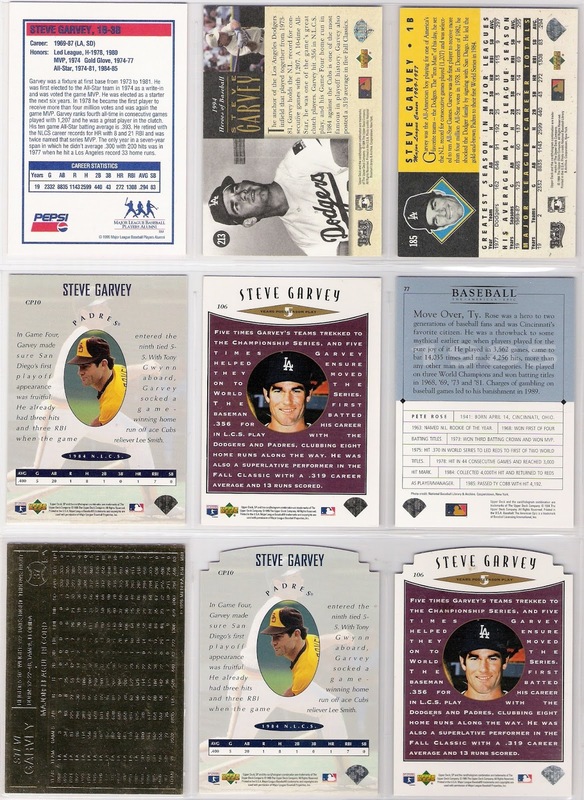 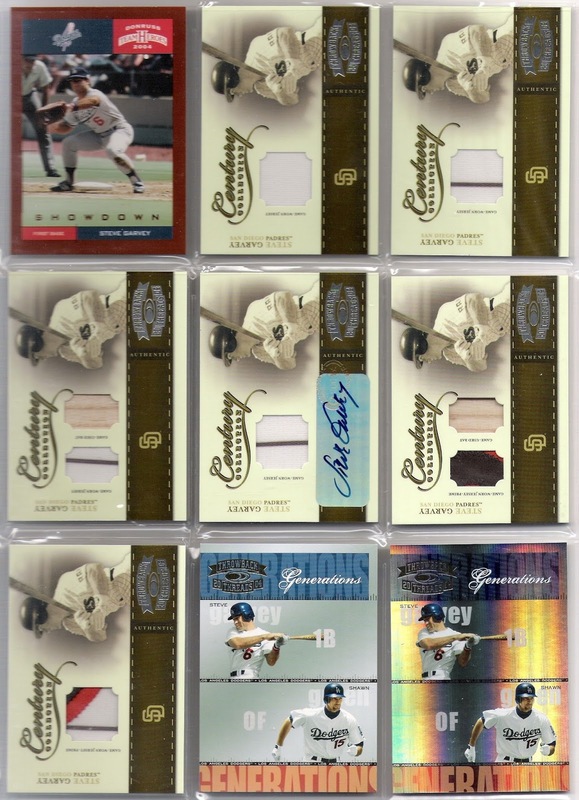 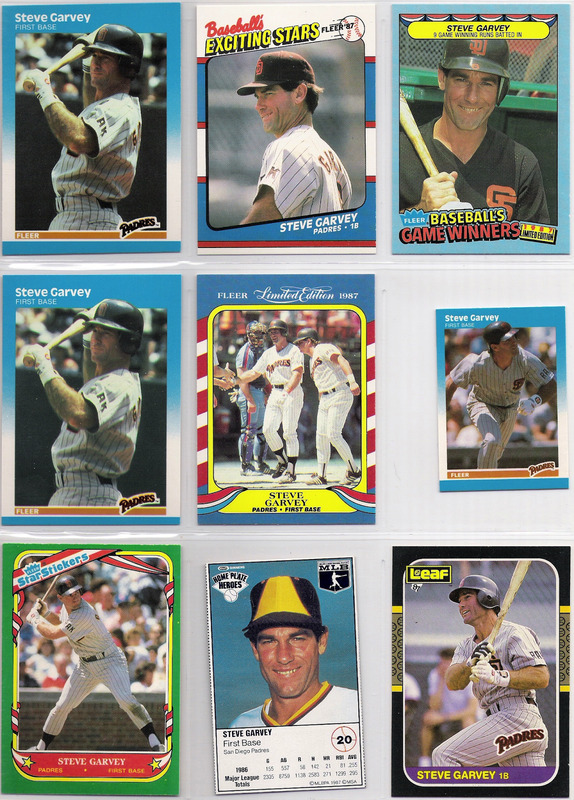 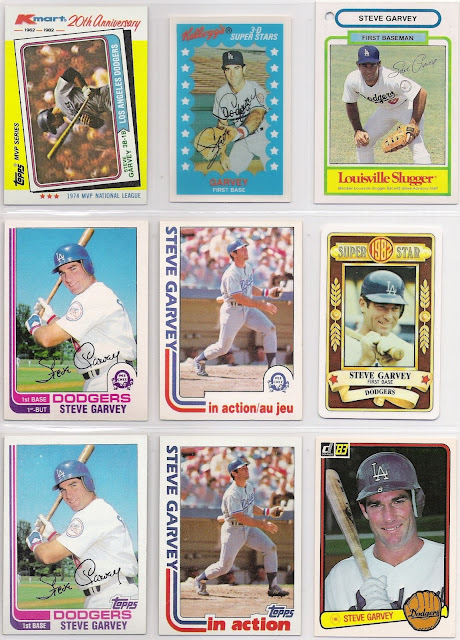 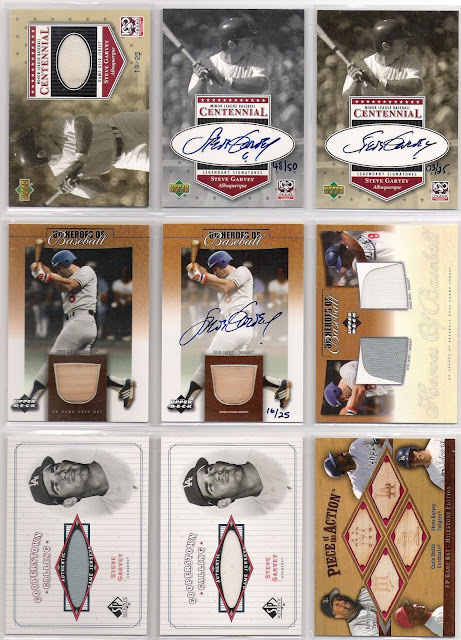 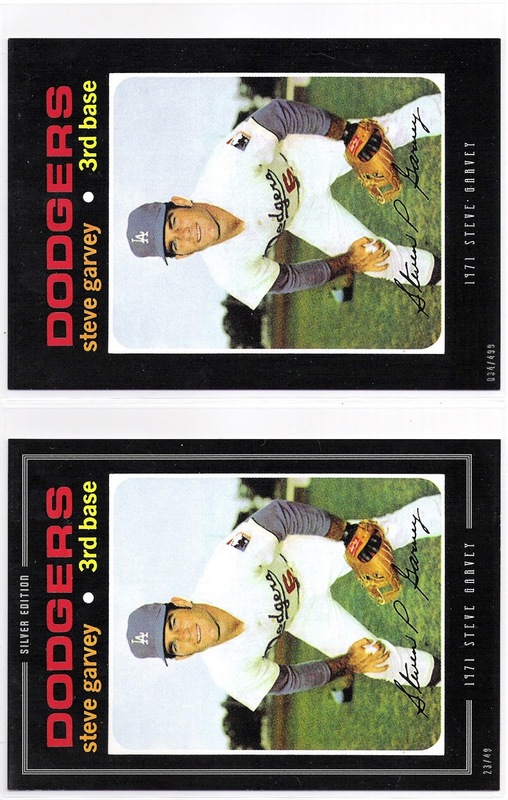 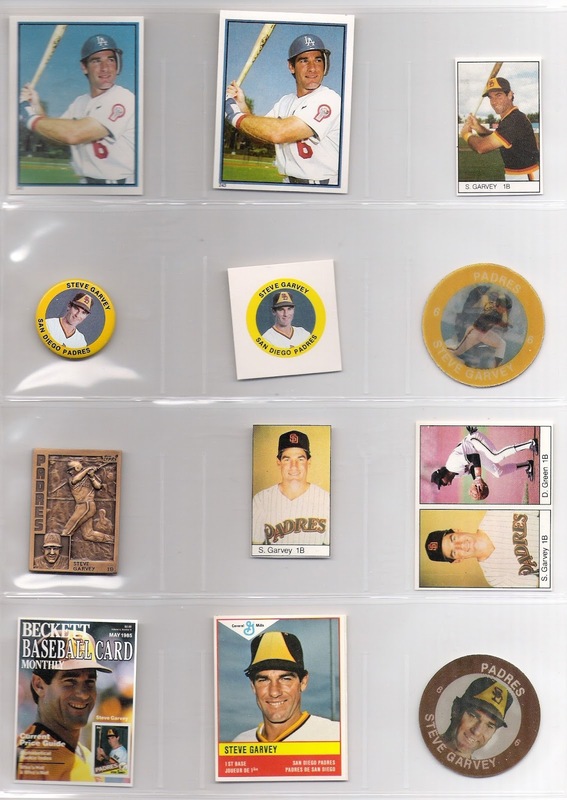 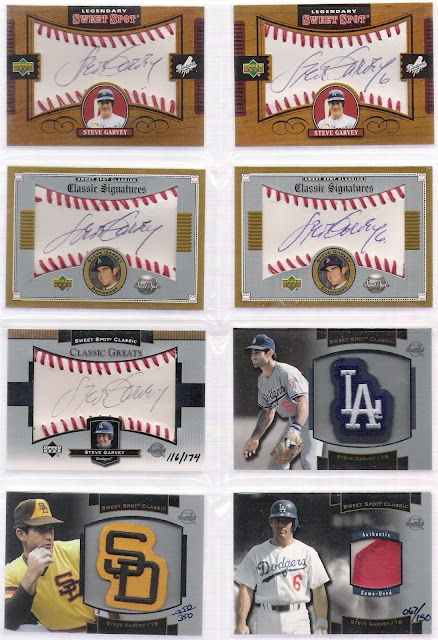 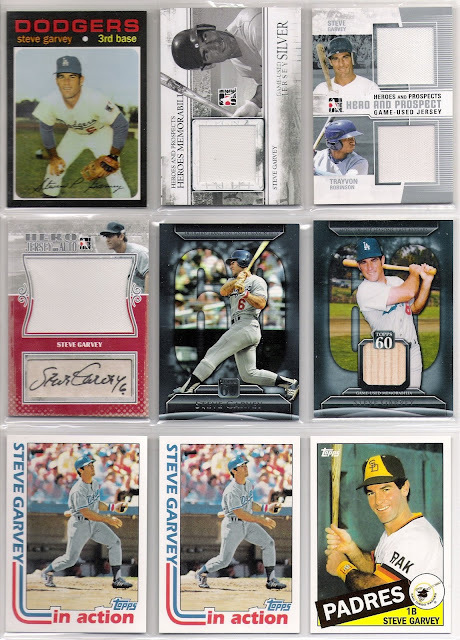 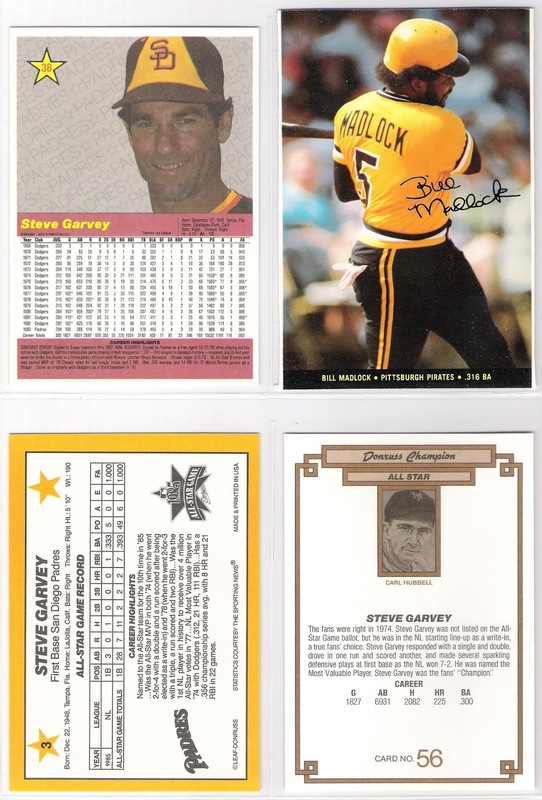 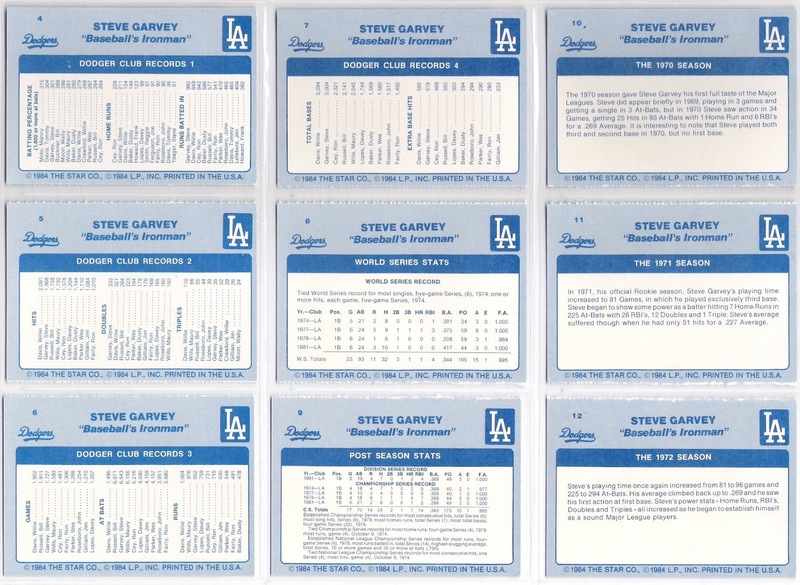 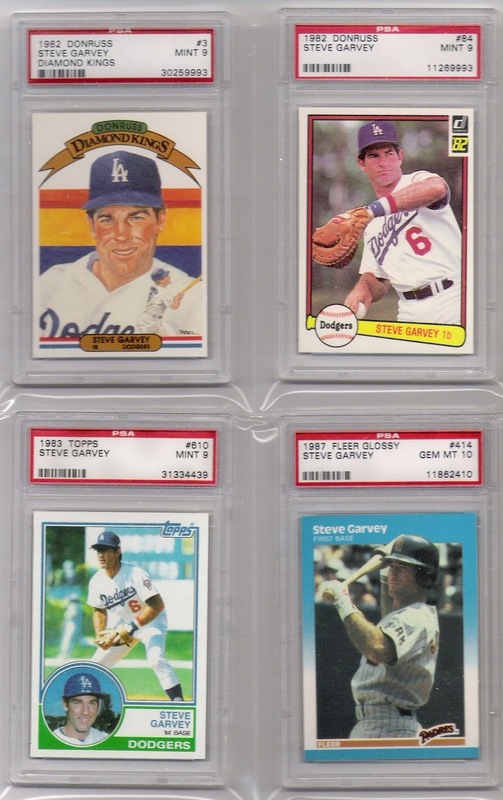 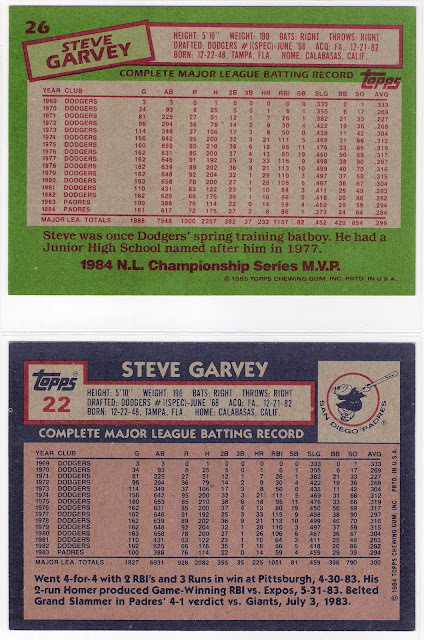 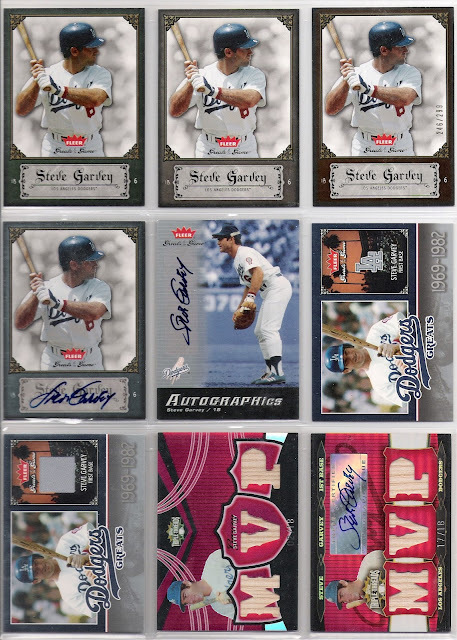 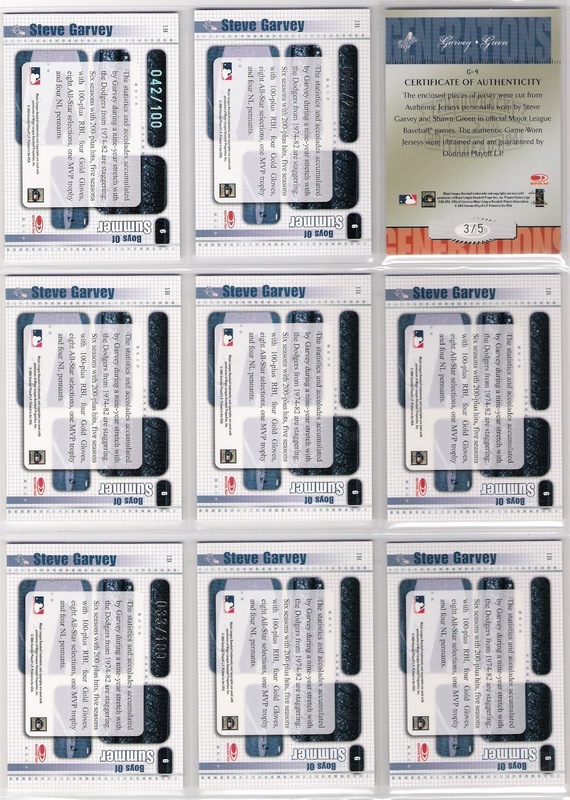 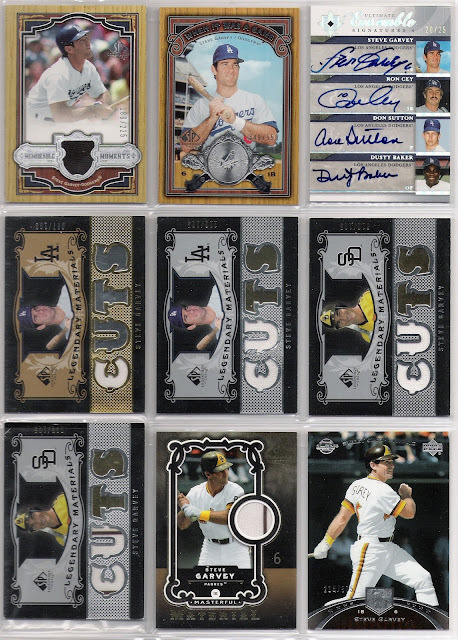 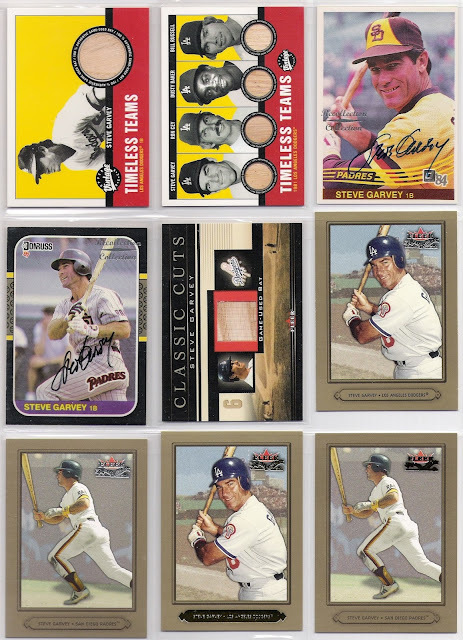 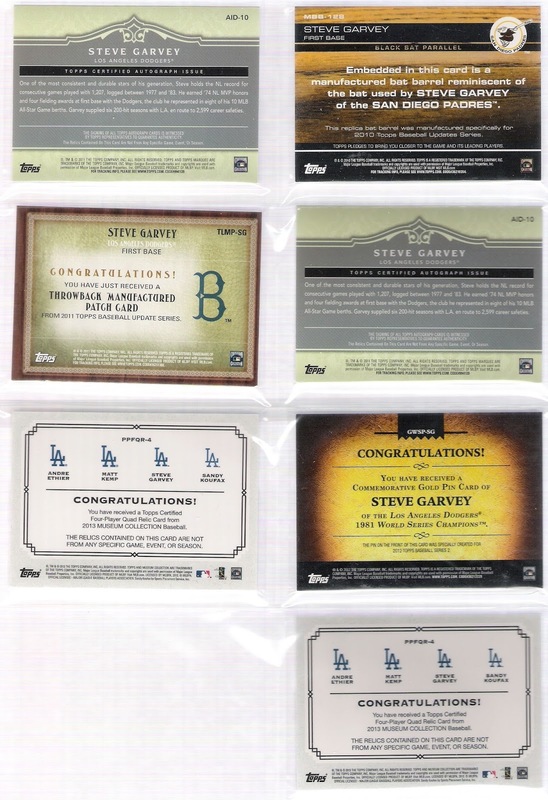 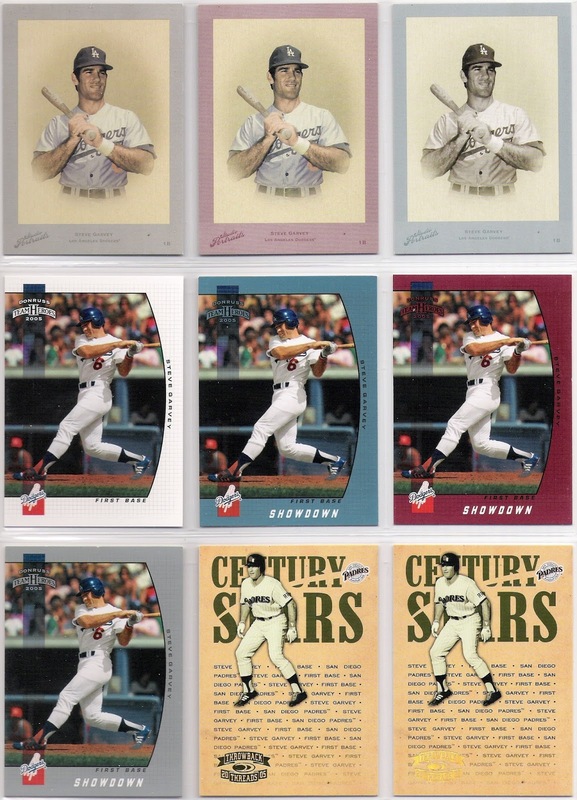 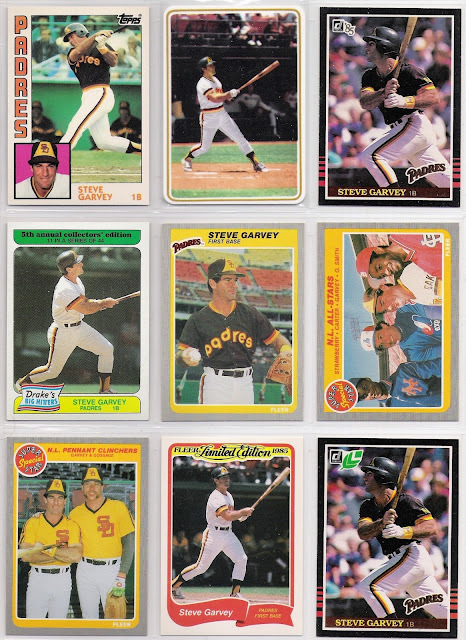 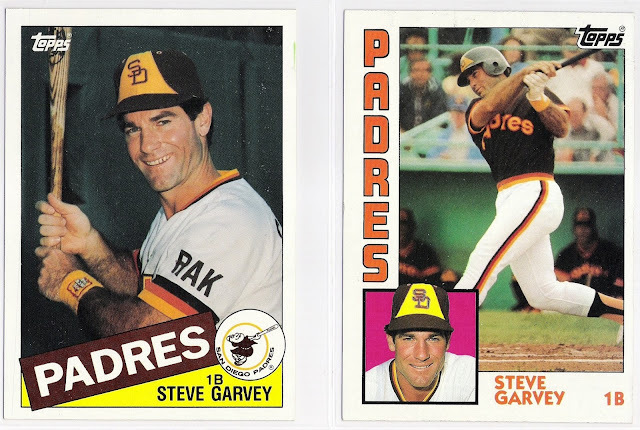 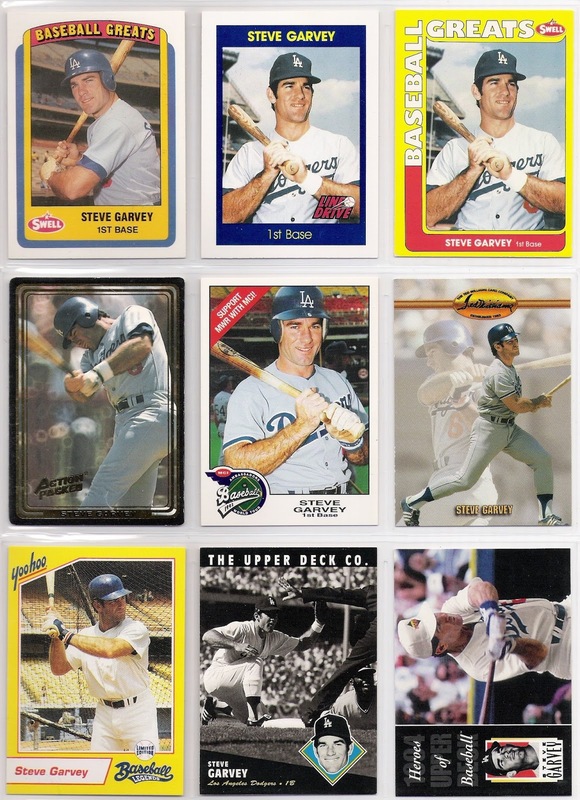 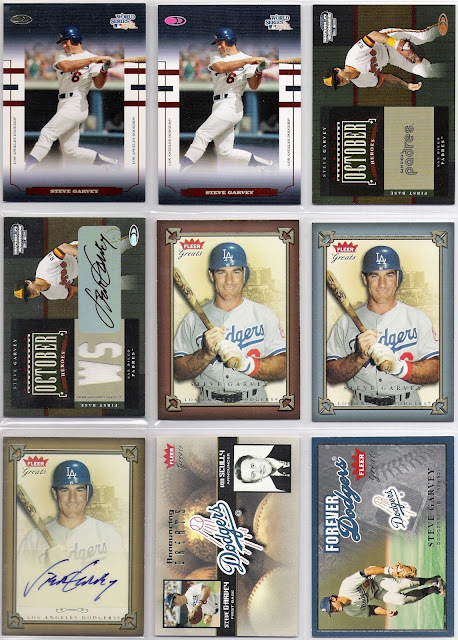 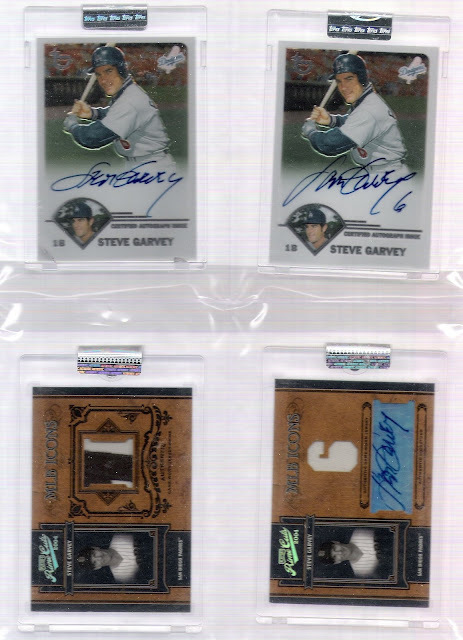 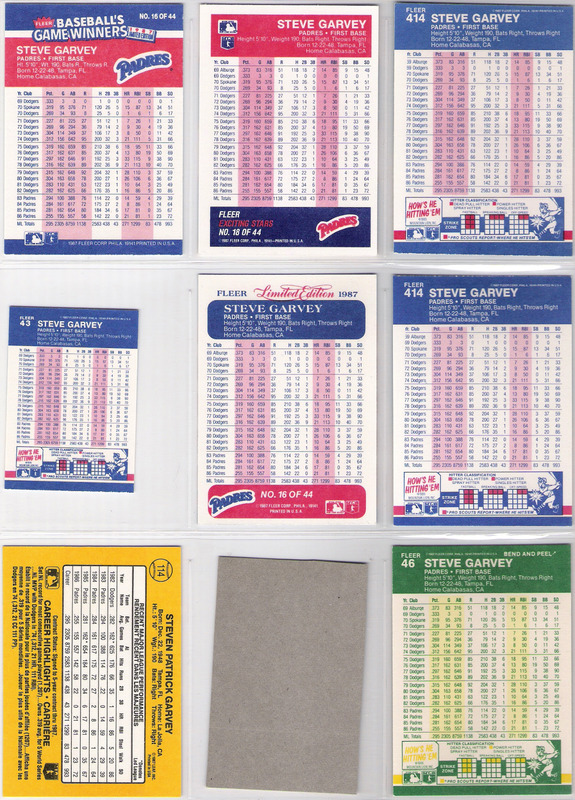 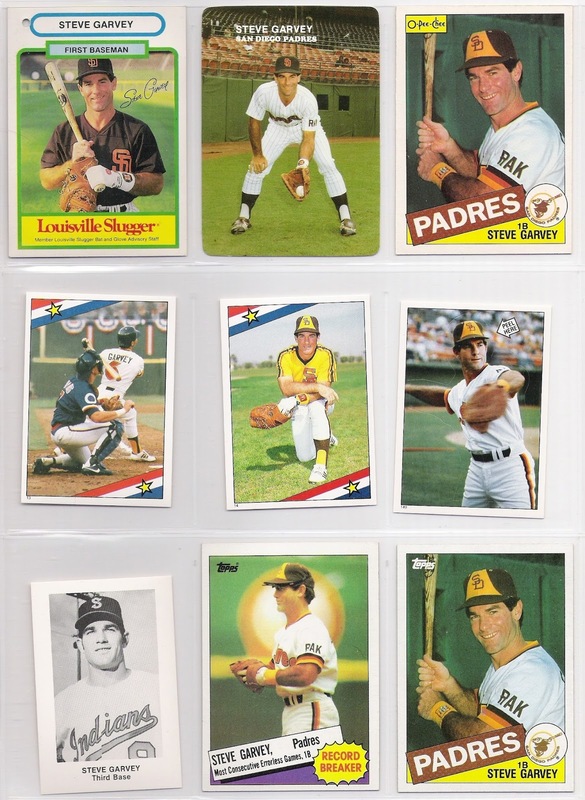 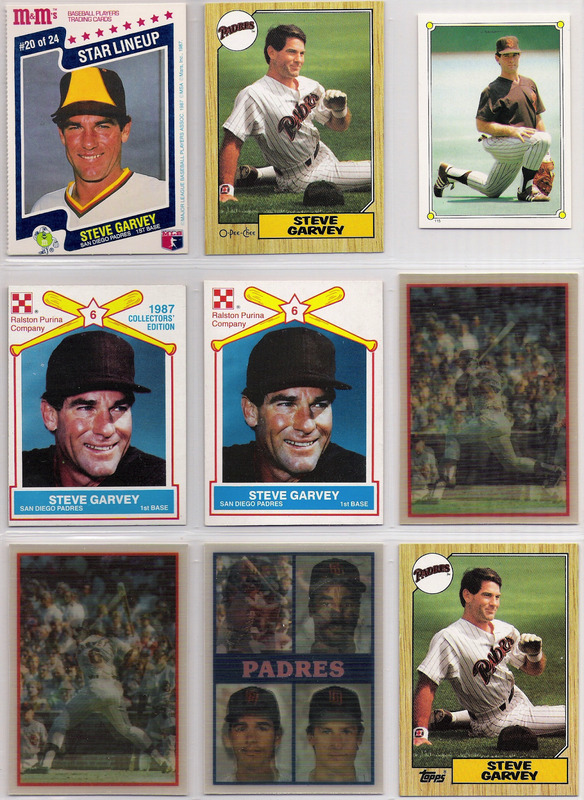 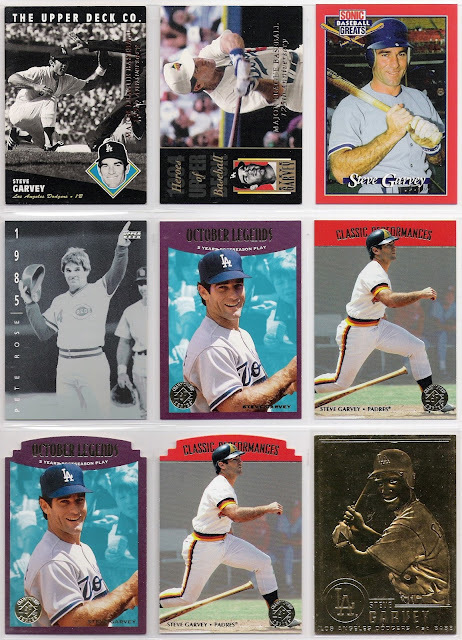 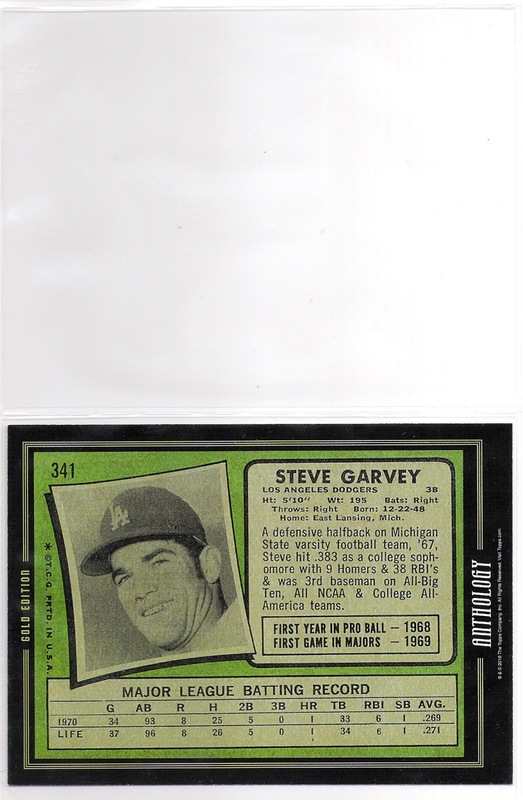 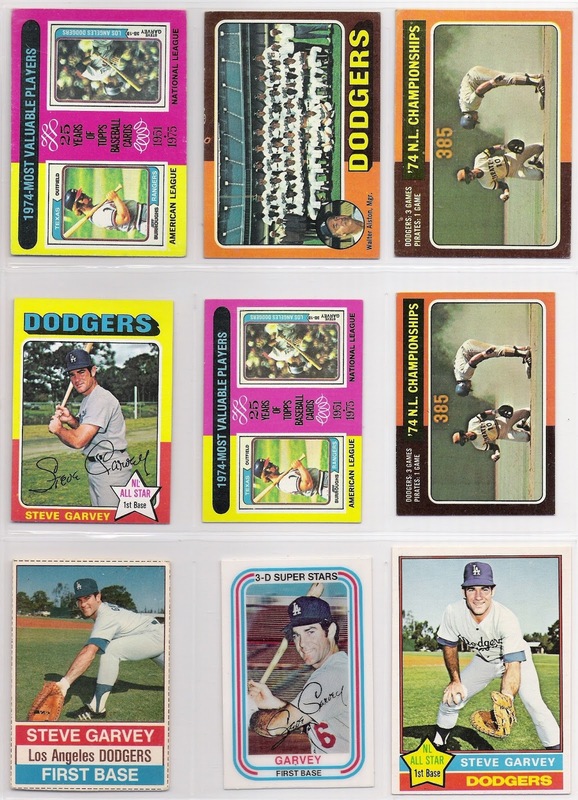 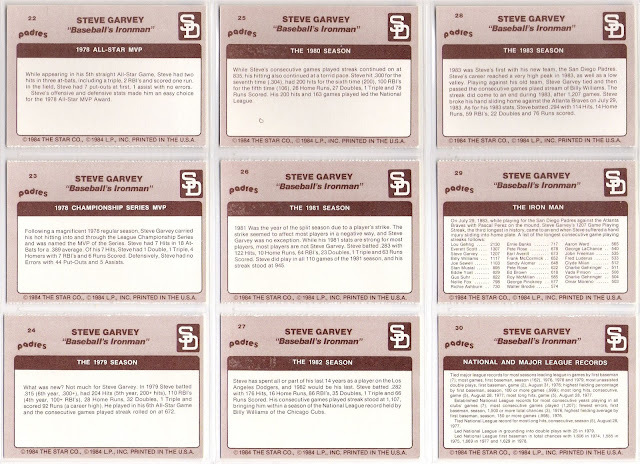 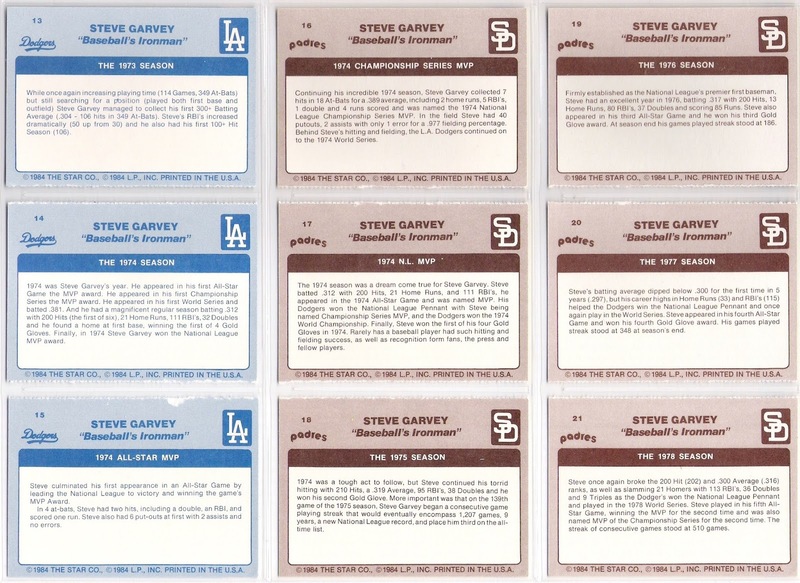 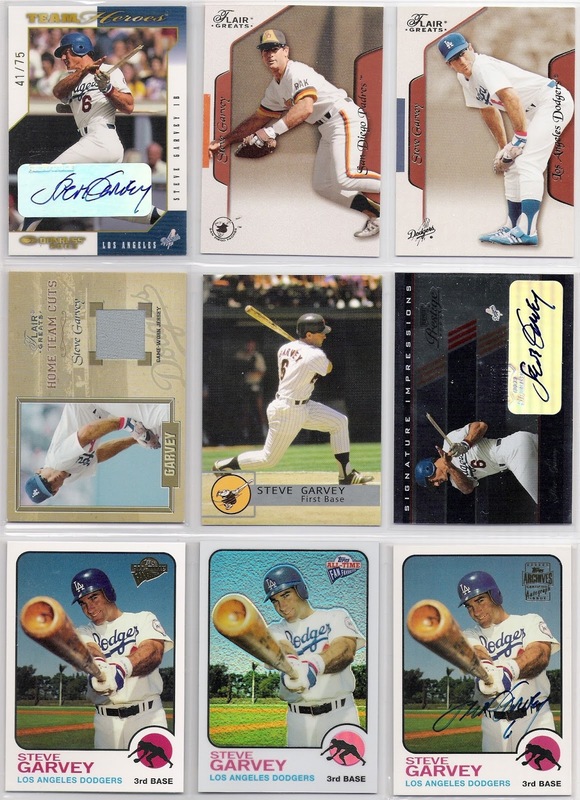 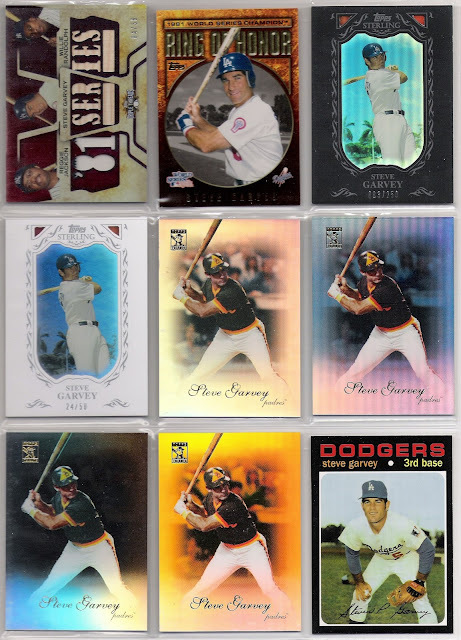 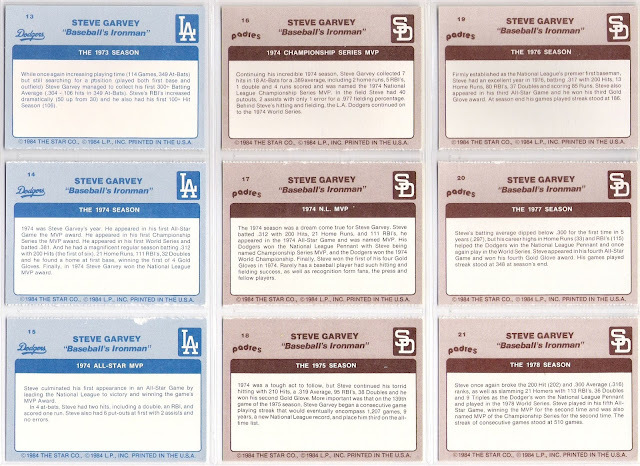 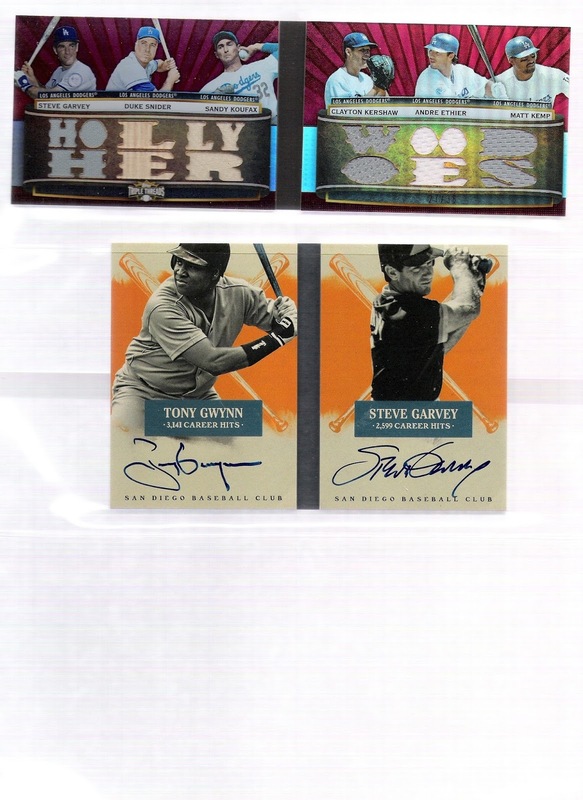 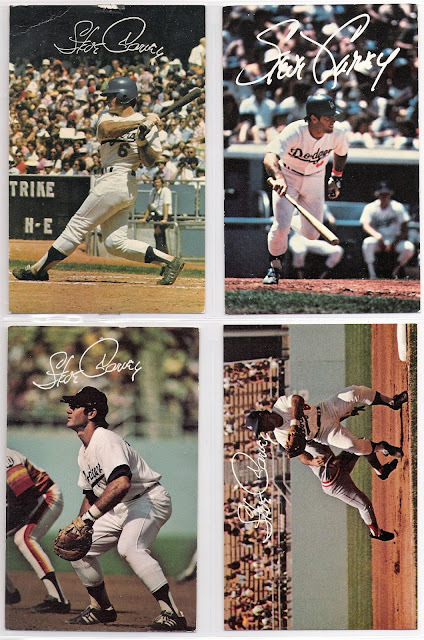 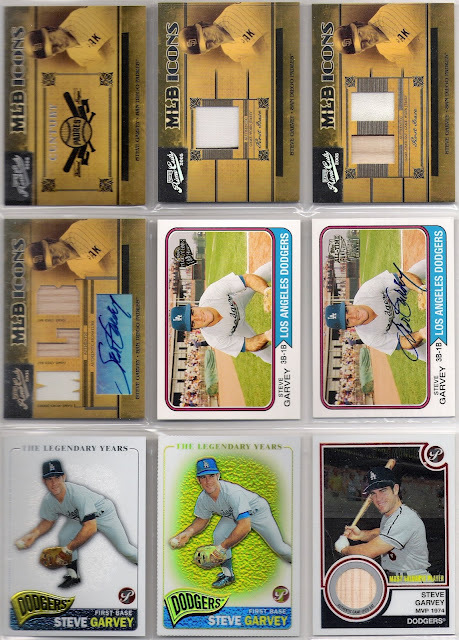 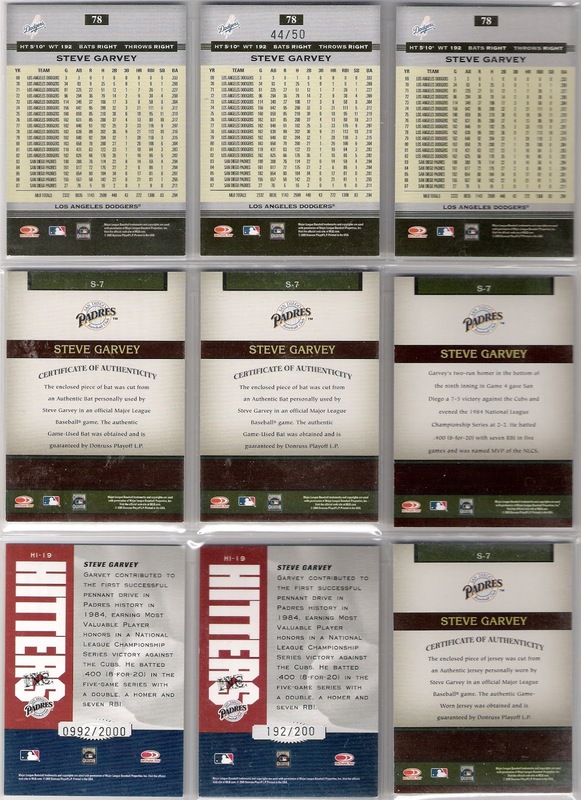 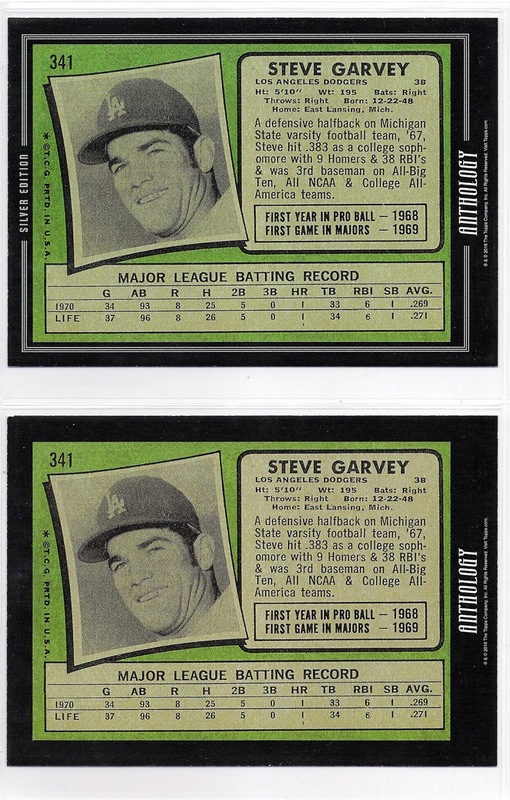 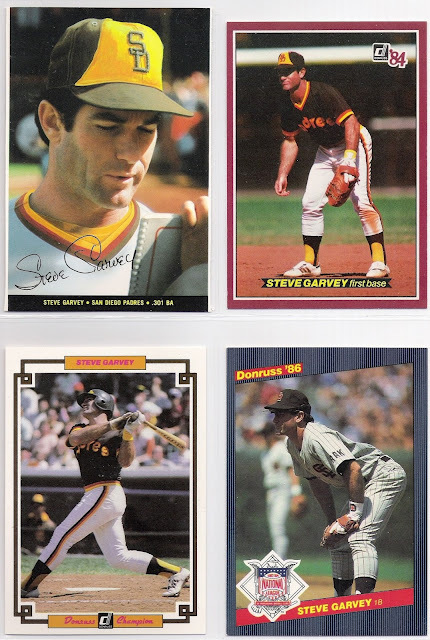 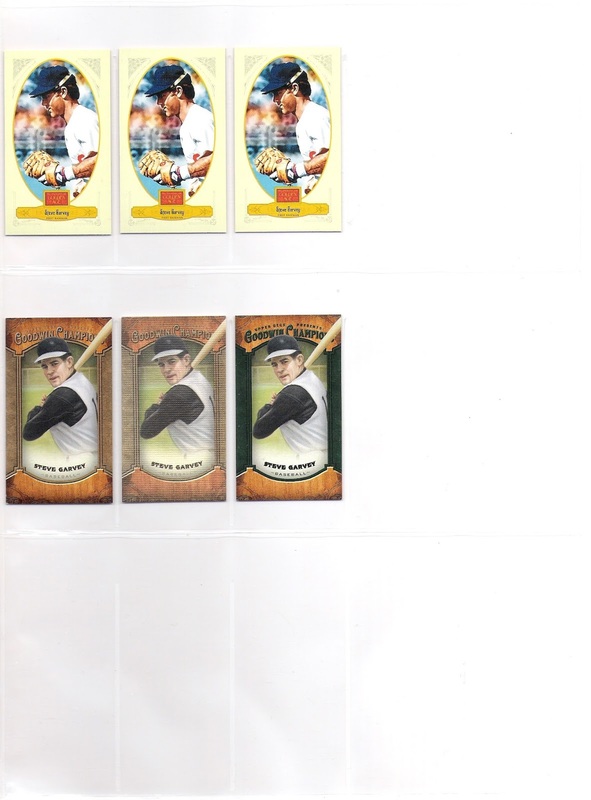 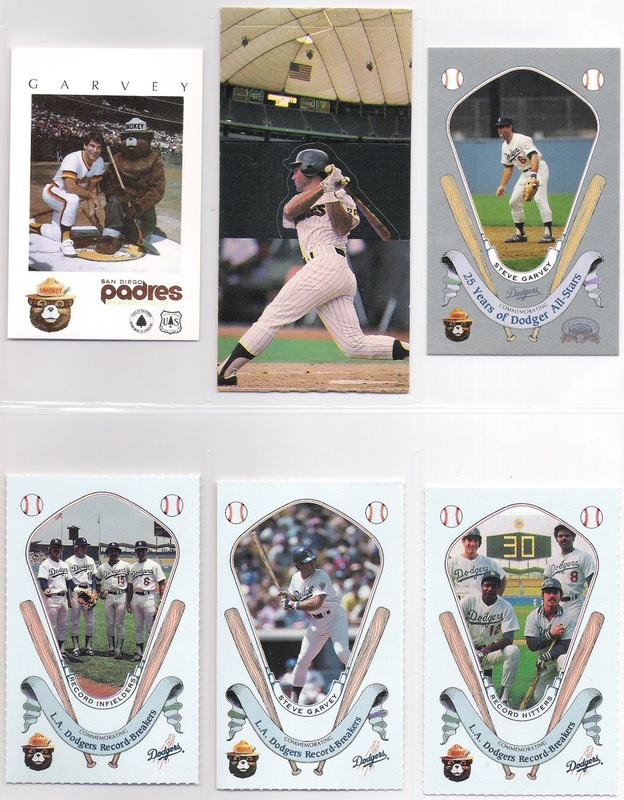 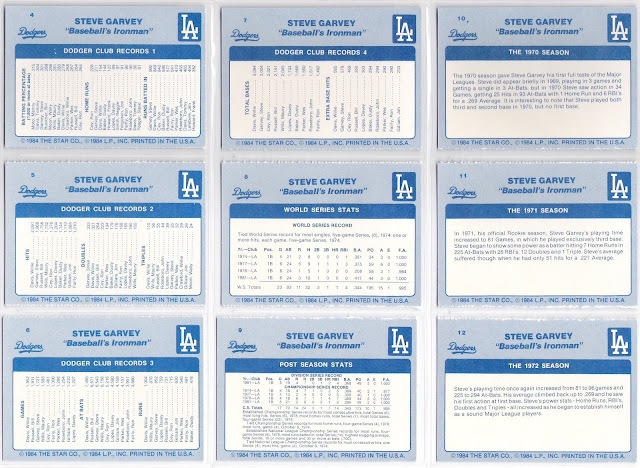 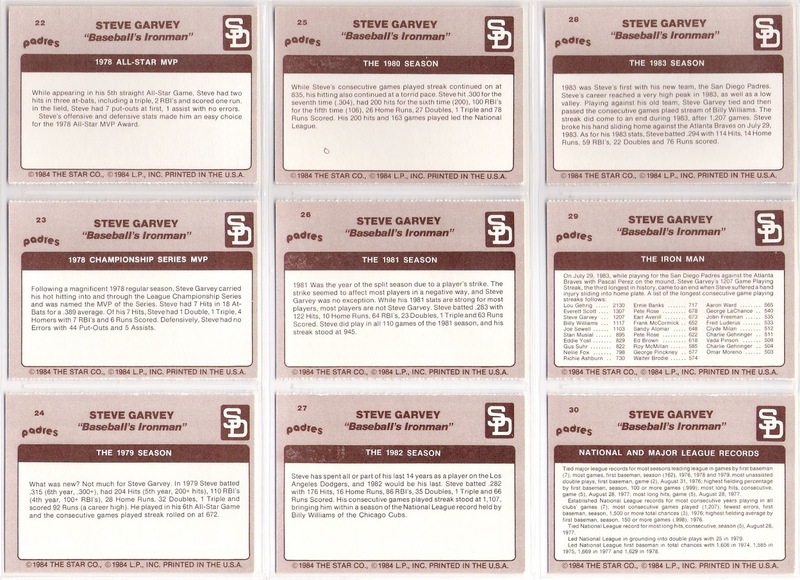 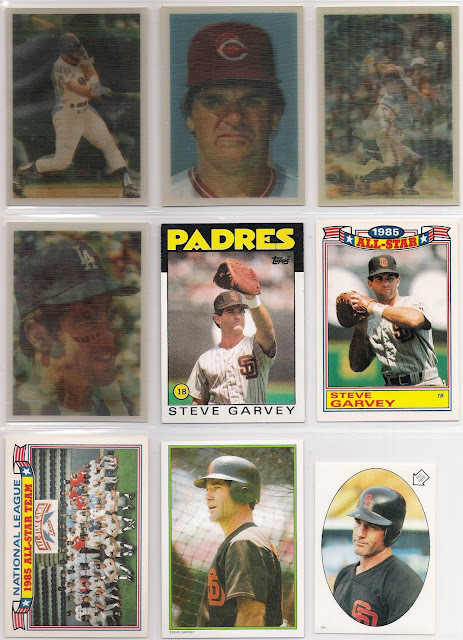 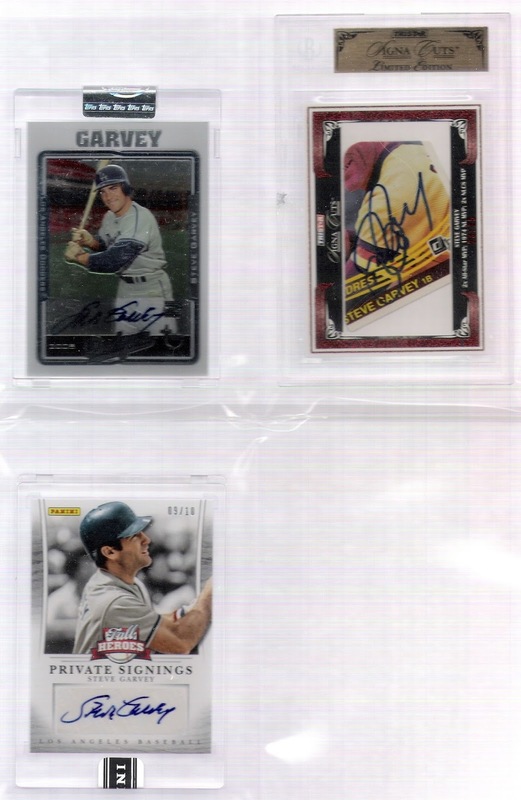 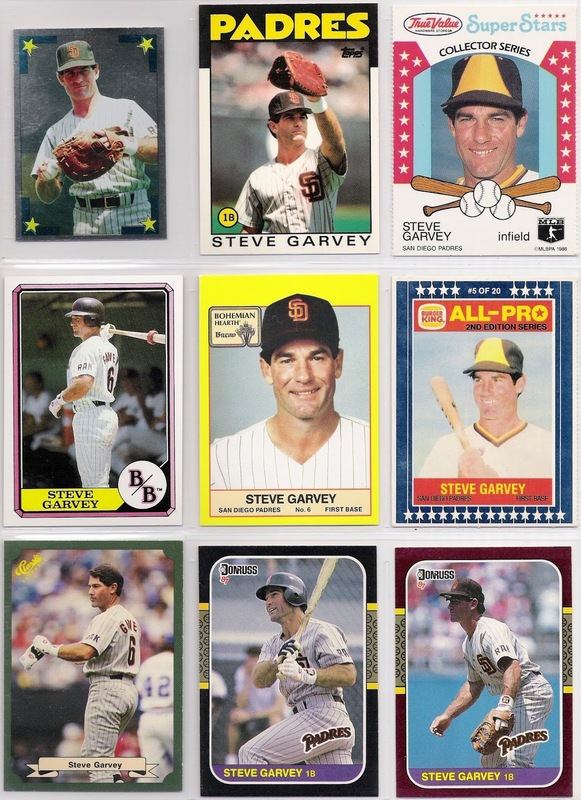 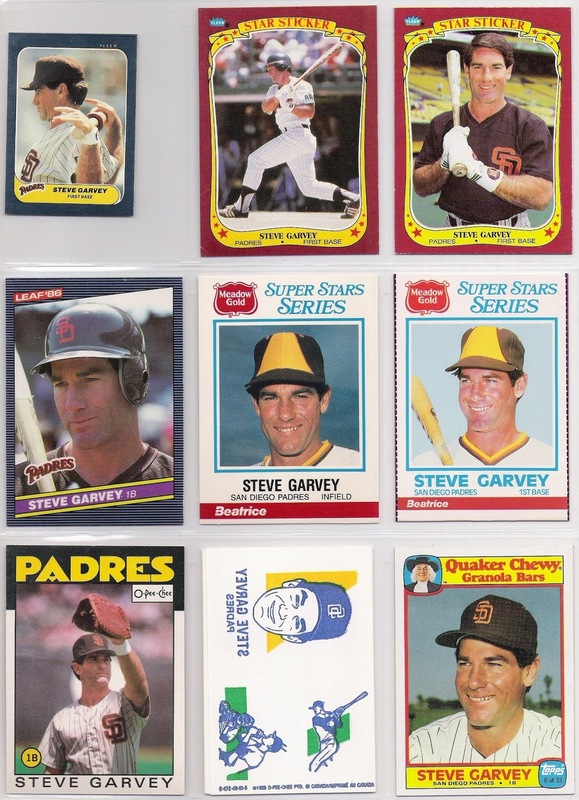 since i began posting the contents of my steve garvey binders, i've added a few cards. 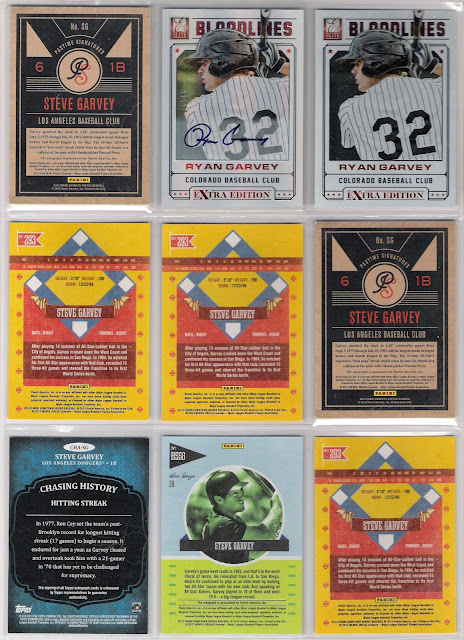 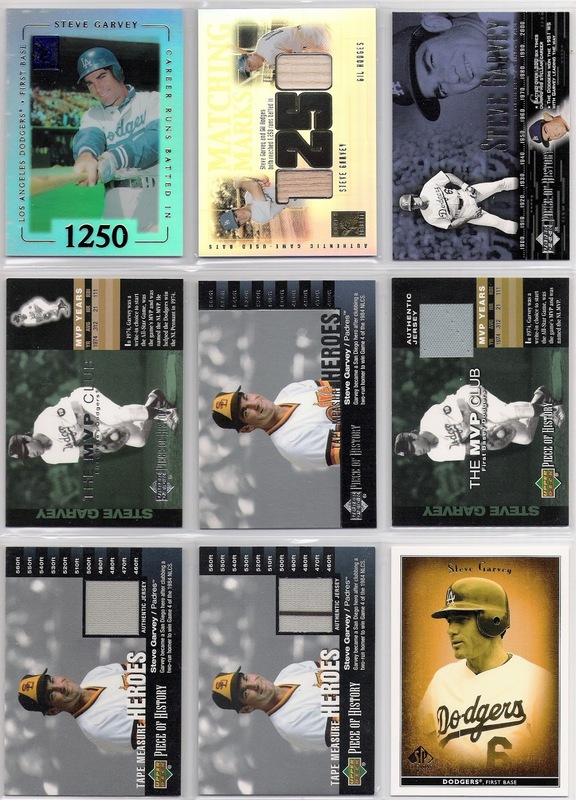 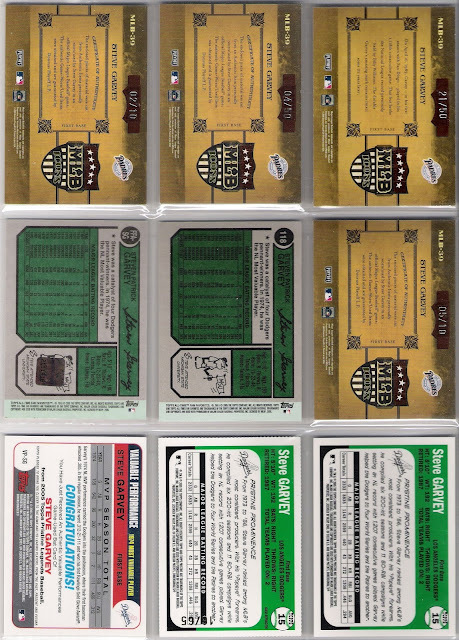 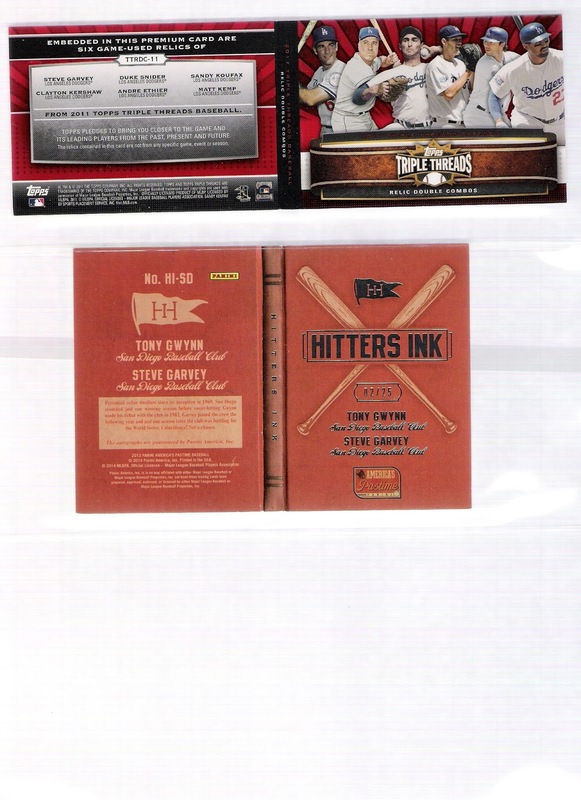 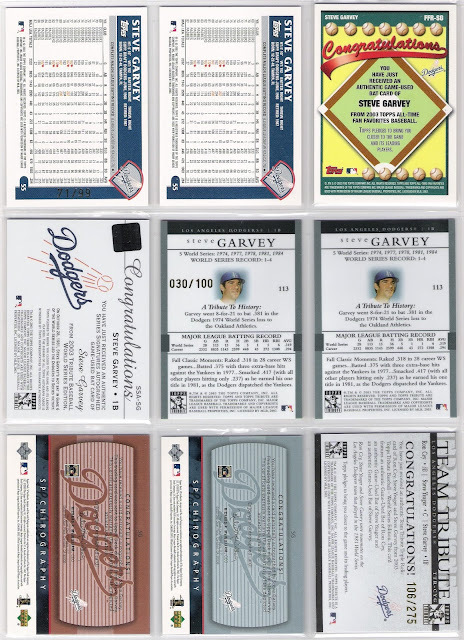 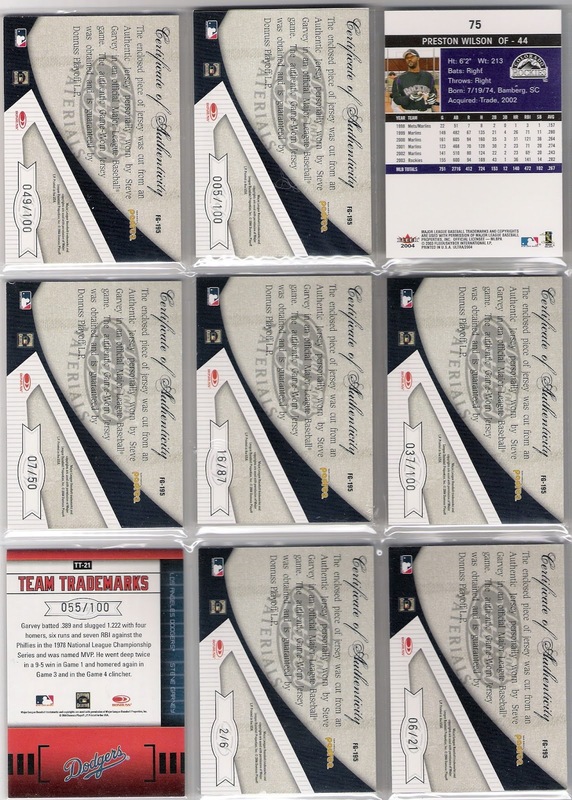 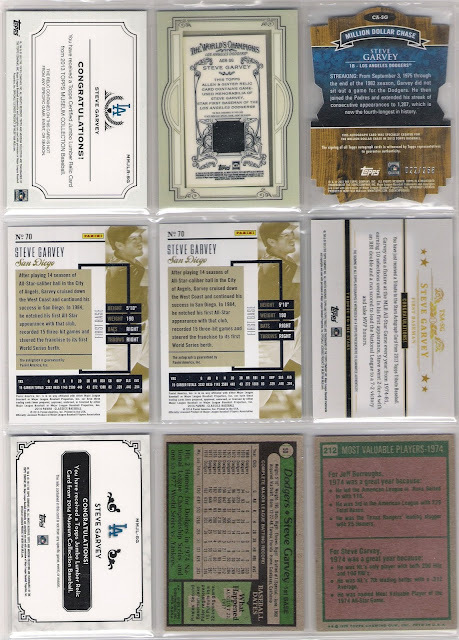 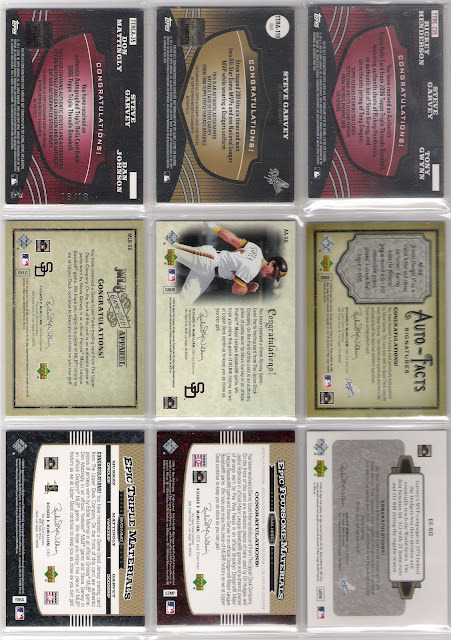 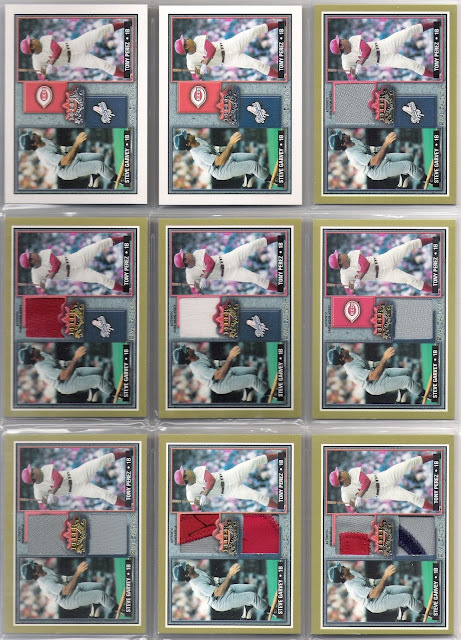 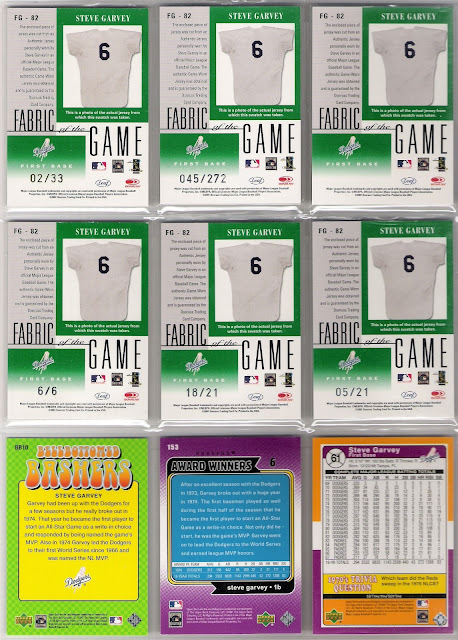 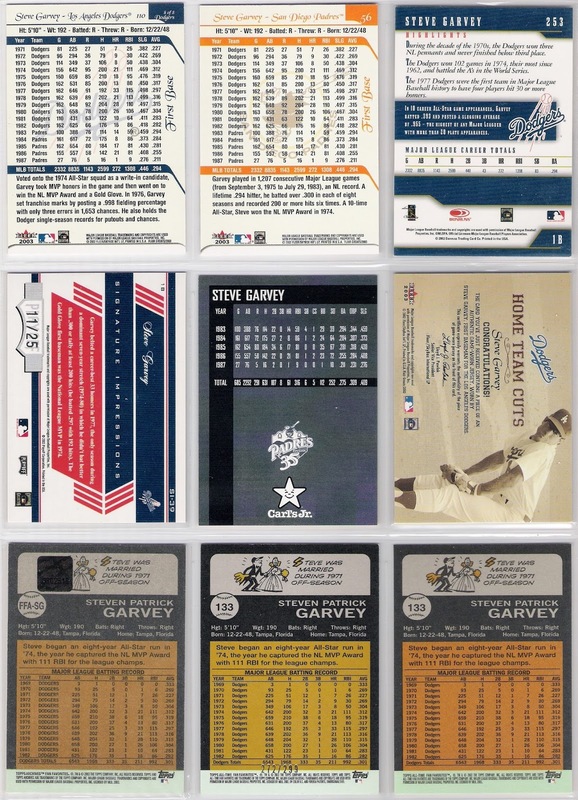 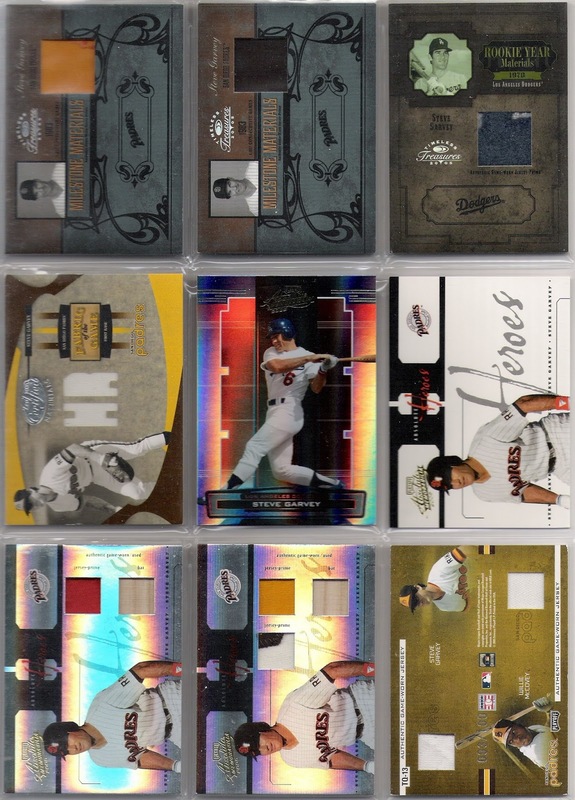 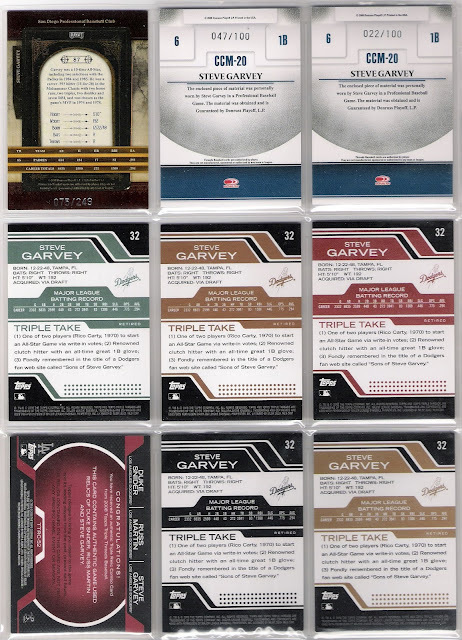 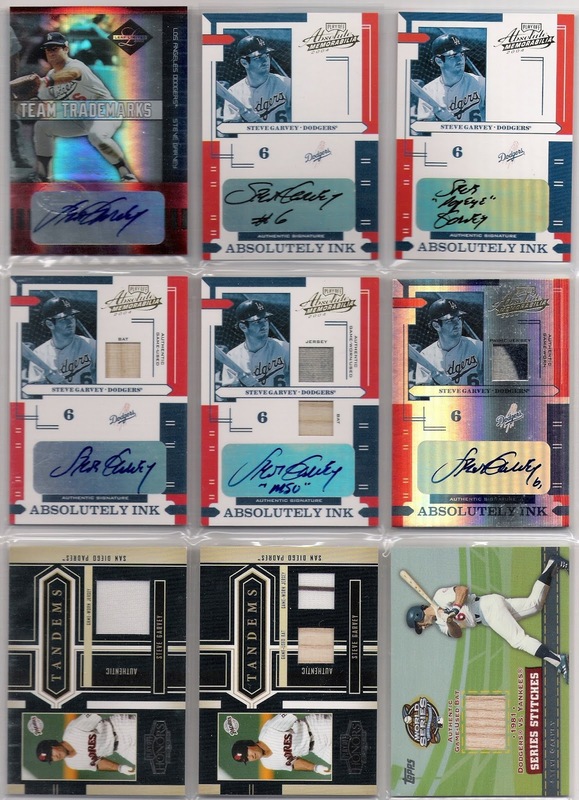 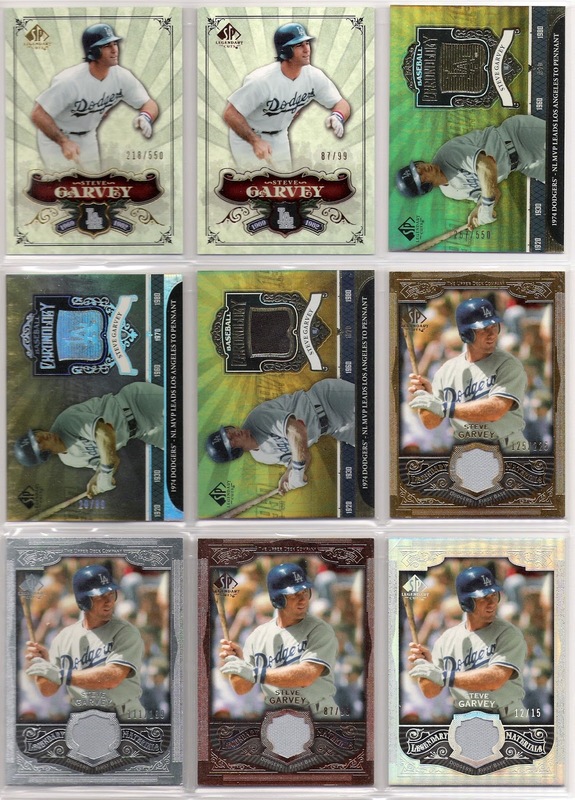 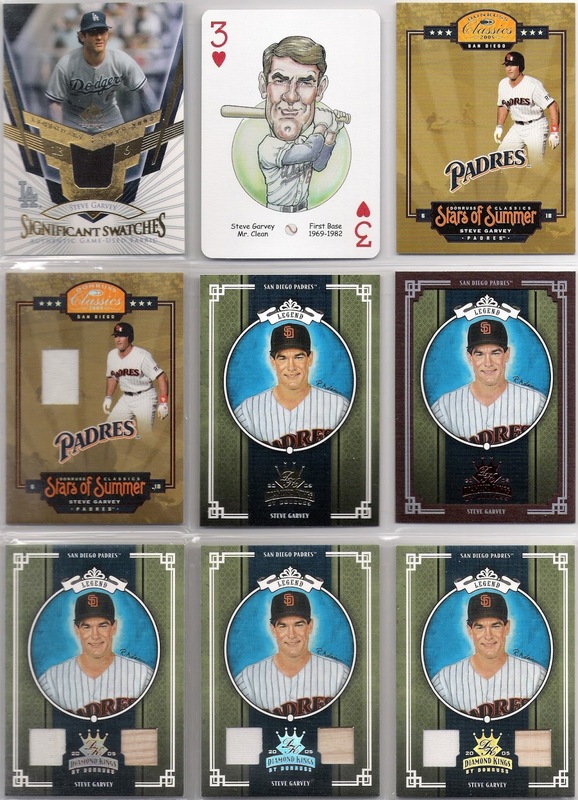 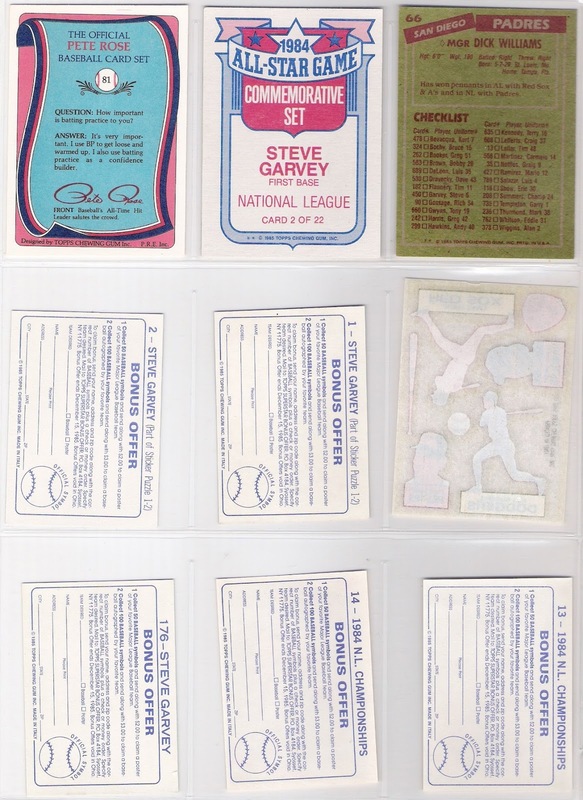 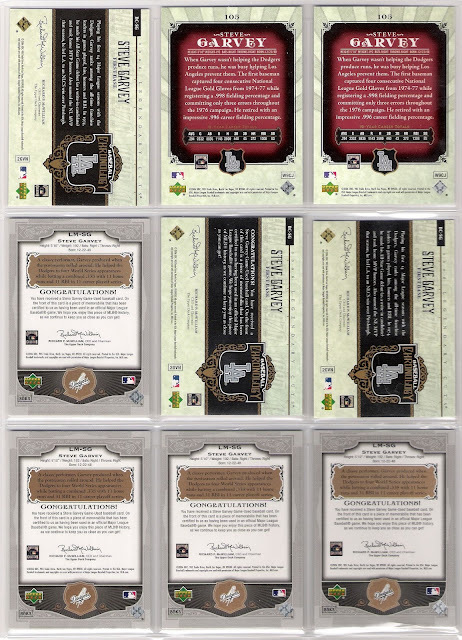 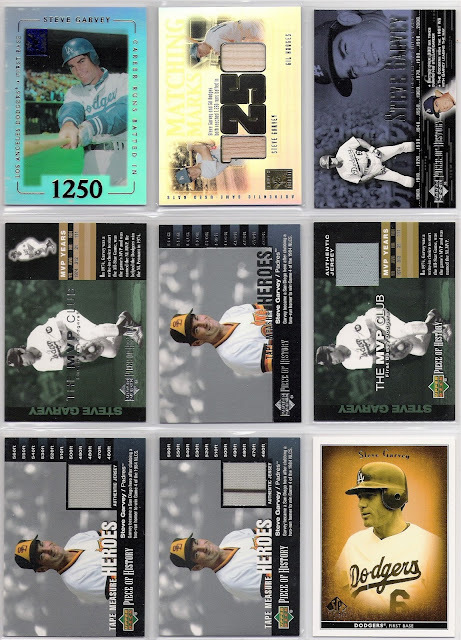 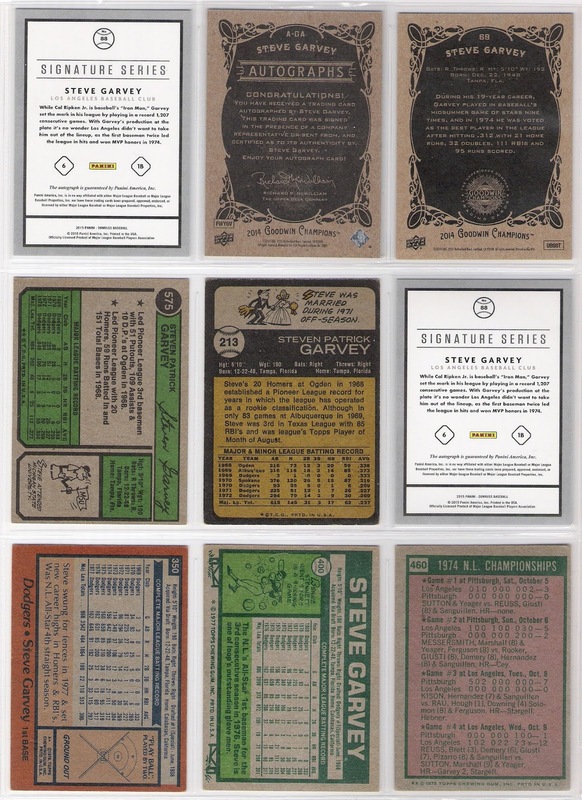 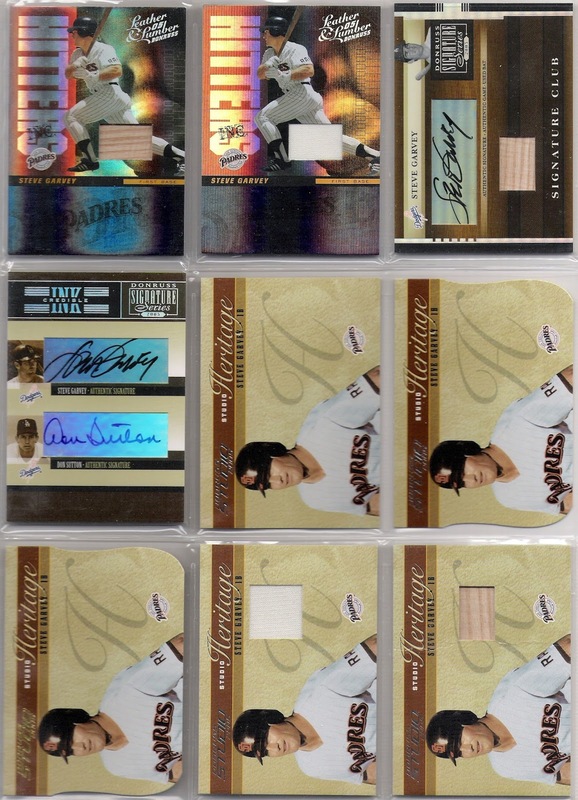 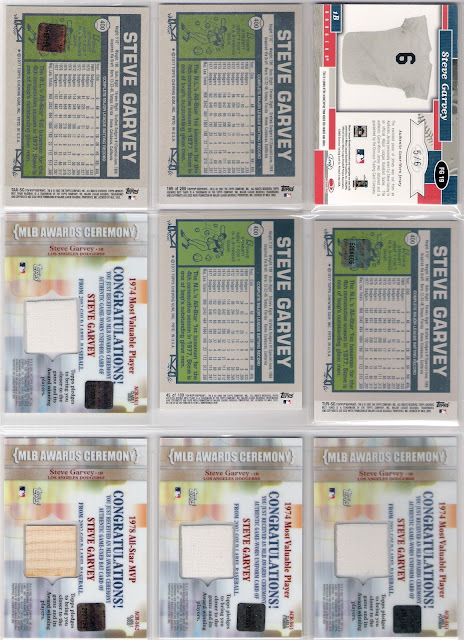 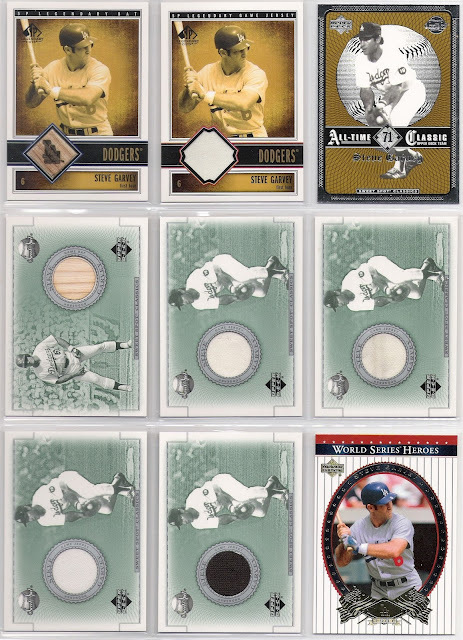 rather than update those past posts, i have re-scanned (some of) those affected binder pages and will repost the entirety of my garvey binders below. 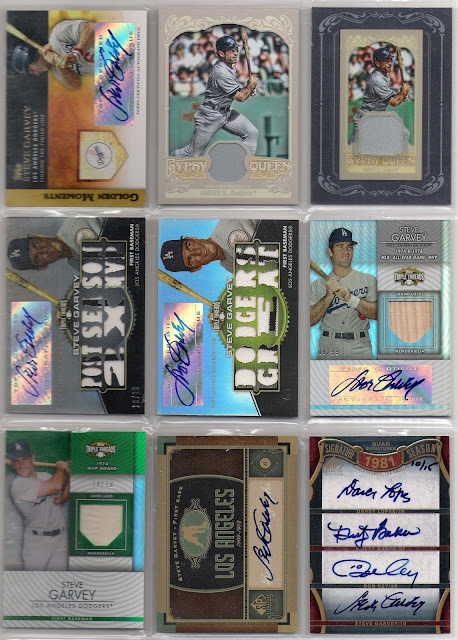 i plan to update this as often as i obtain new cards/items to add to the collection. i've also got a have/want list posted (but still under construction) at my want list site, which will be similarly updated as warranted. thanks to everyone who stuck with me through what turned out to be some fairly narrowly focused posts. i may have done it for myself, but i appreciate your interest and support.